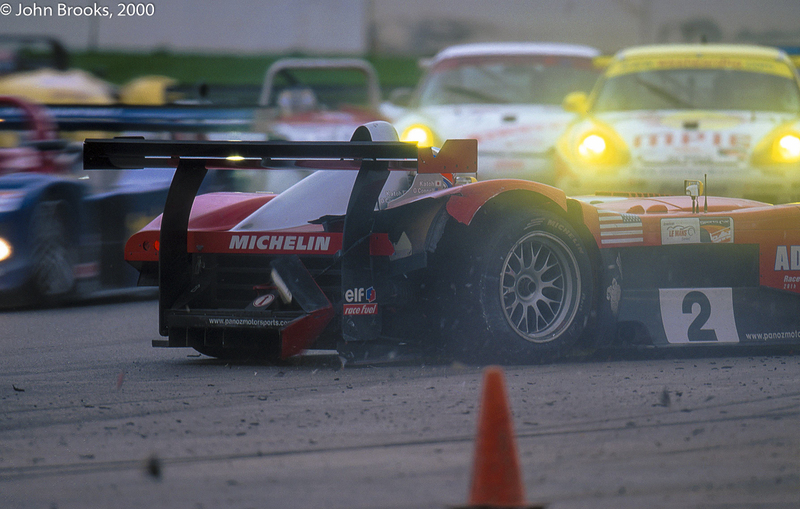 Driver shoots, don’t ya just love ’em? 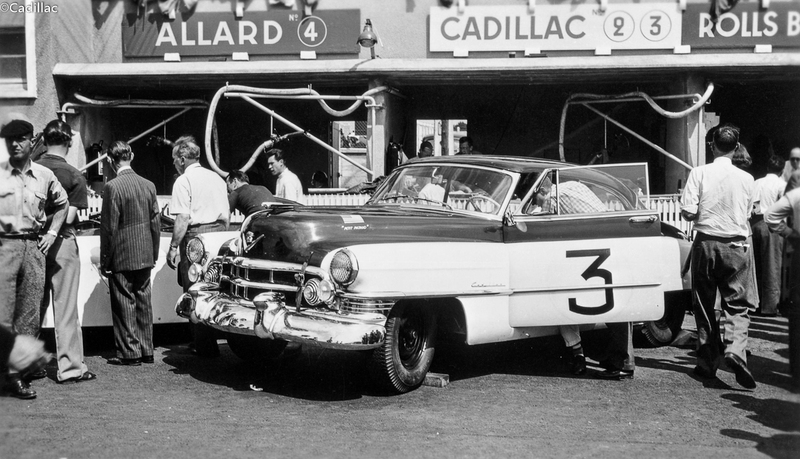 Herding cats would be easier and nothing has much changed in the 49-odd years since this scene at Le Mans. 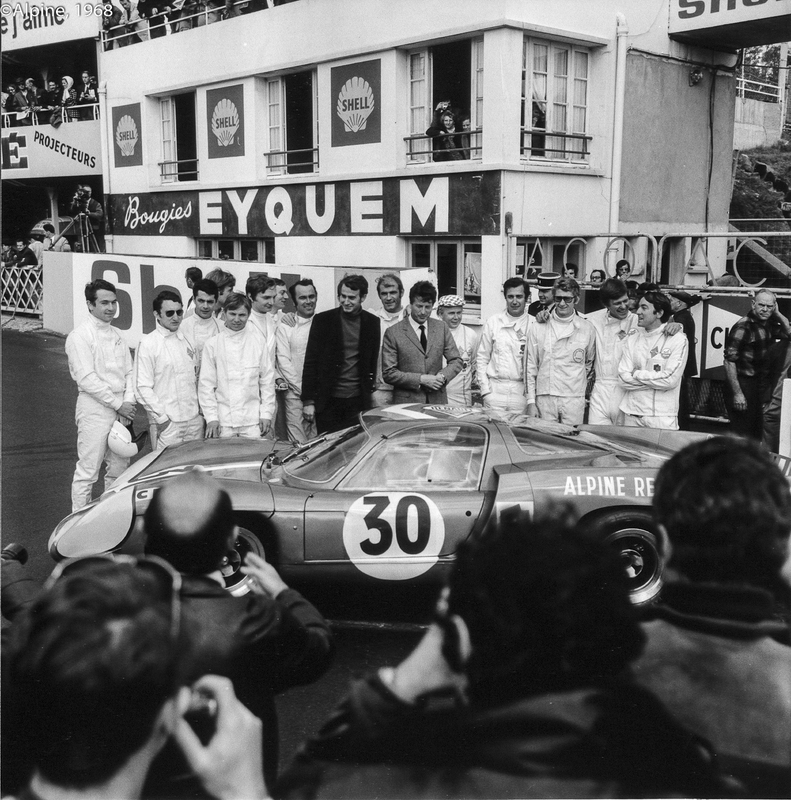 Even the scrum around local favourites still continues, the only thing missing is a selfie-stick………….but this bunch of drivers from the 1968 Alpine Le Mans team is also a bit special. 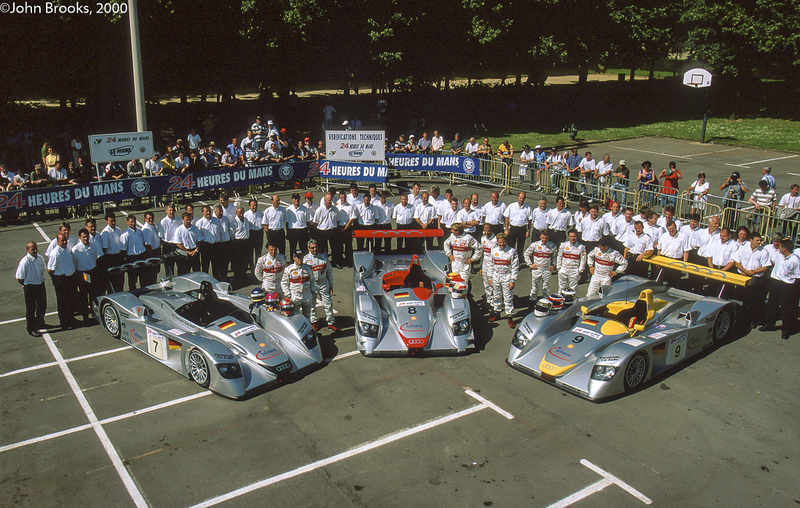 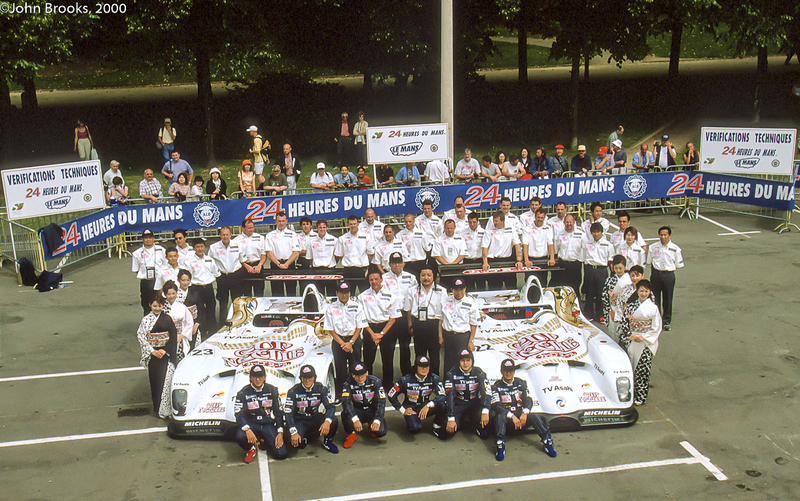 L to R as far as I can tell: Bob Wollek, Jean-Pierre Nicolas, Alain Serpaggi, Christian Ethuin, André de Cortanze, Jean-Luc Thérier, Jean Vinatier, François Castaing, Alain le Guellec, Jean Rédélé, Bernard Tramont, Jean Guichet, Jean-Pierre Jabouille, Henri Grandsire and Gérard Larrousse. 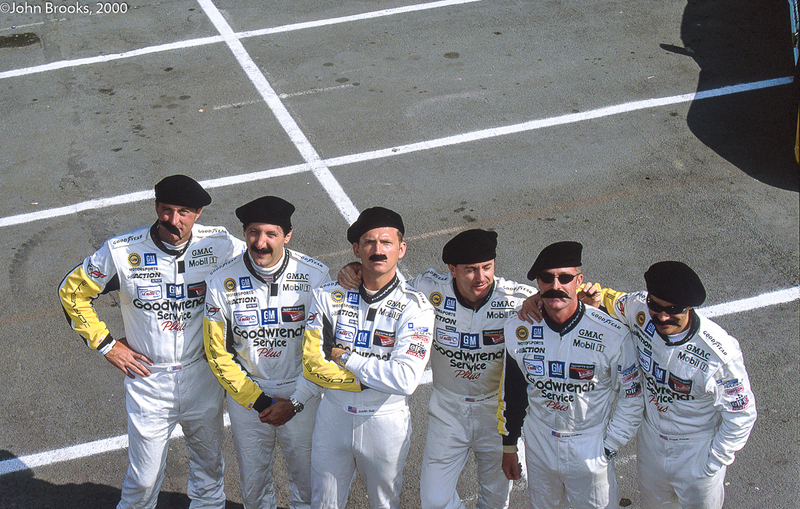 They would win Grand Prix, Le Mans (driving and designing), rallies and many, many races, a very select bunch. 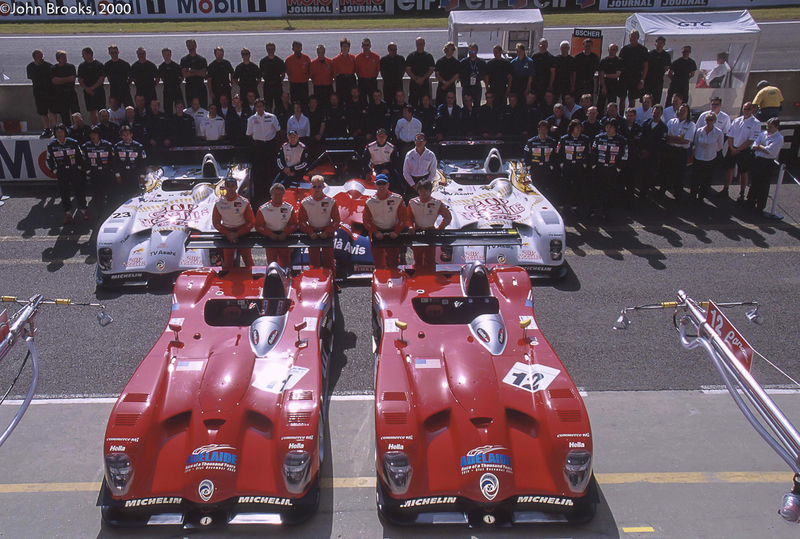 This entry was posted in Nostalgia, Notes from the Cellar and tagged 1968, Alain le Guellec, Alain Serpaggi, Alpine, André de Cortanze, Bernard Tramont, Bob Wollek, Christian Ethuin, François Castaing, Gérard Larrousse., Henri Grandsire, Jean Guichet, Jean Rédélé, Jean Vinatier, Jean-Luc Thérier, Jean-Pierre Jabouille, Jean-Pierre Nicolas, Le Mans 24 Hours on February 12, 2017 by John Brooks. 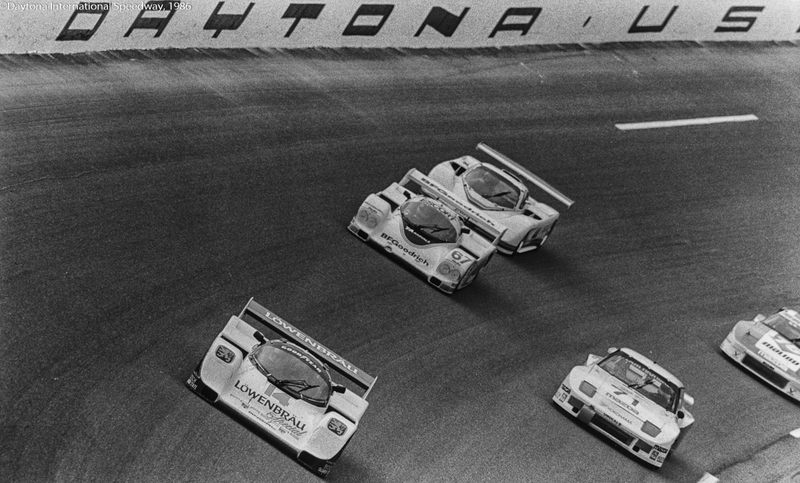 The Daytona 24 Hours in 1987 was an almost exclusively Porsche affair in the leading GTP class, no less than nine 962s chased victory. 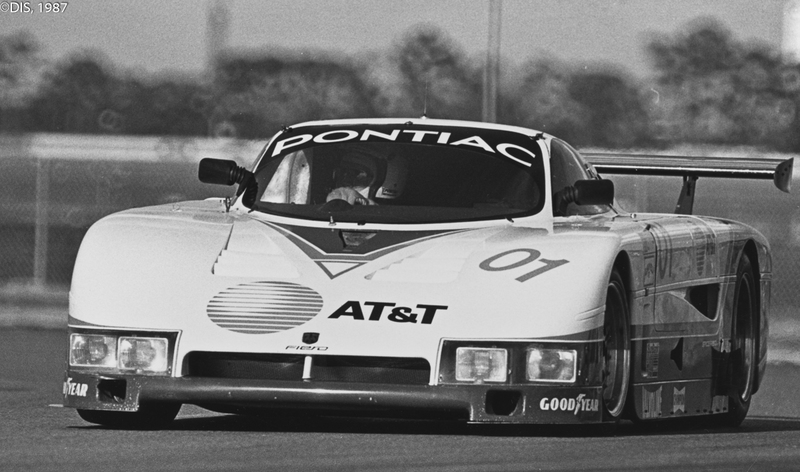 Five of these were powered by a 2.8 litre flat six and the other four a 3.0 litre version of the classic Porsche unit, power was traded off for less fuel stops, a bit of a leap of faith at Daytona. 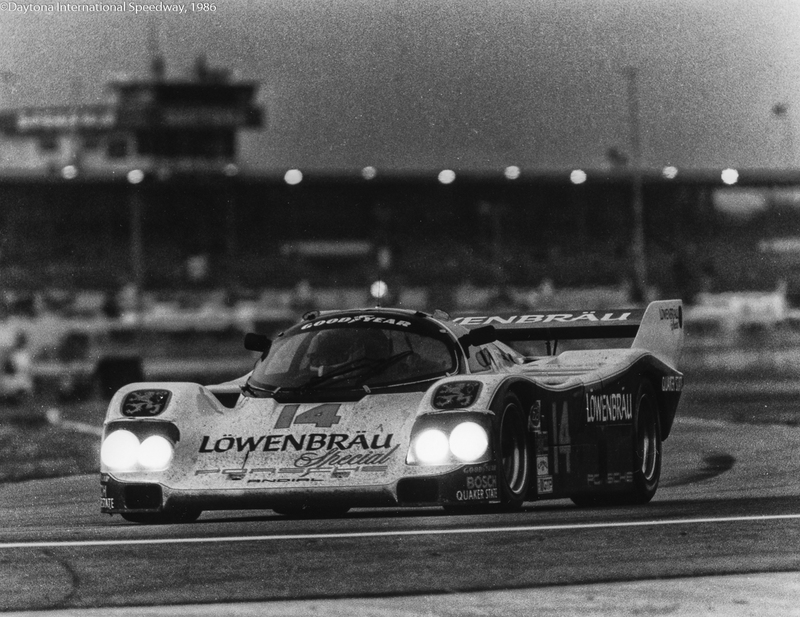 Leading the charge was Jochen Mass in Bruce Leven’s 962 posting a pole lap of 1:41.005. 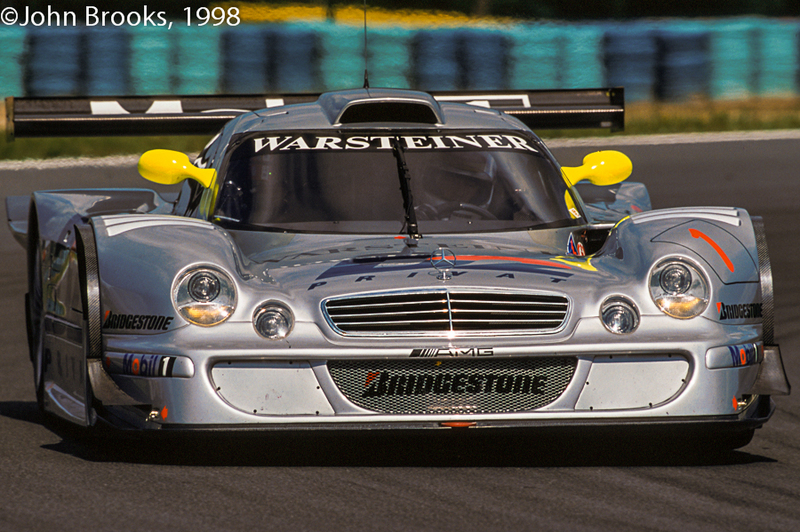 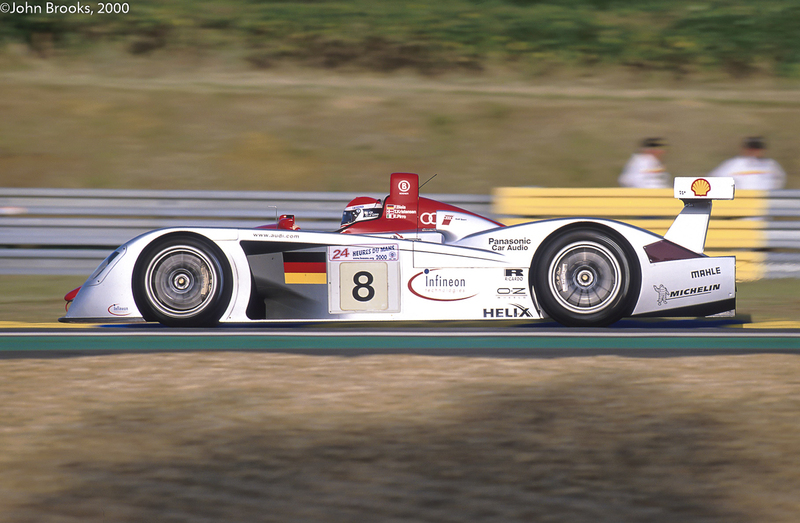 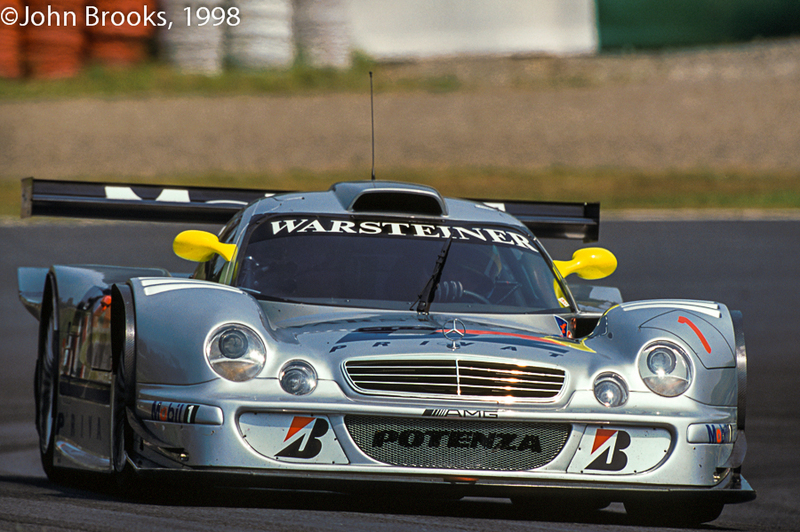 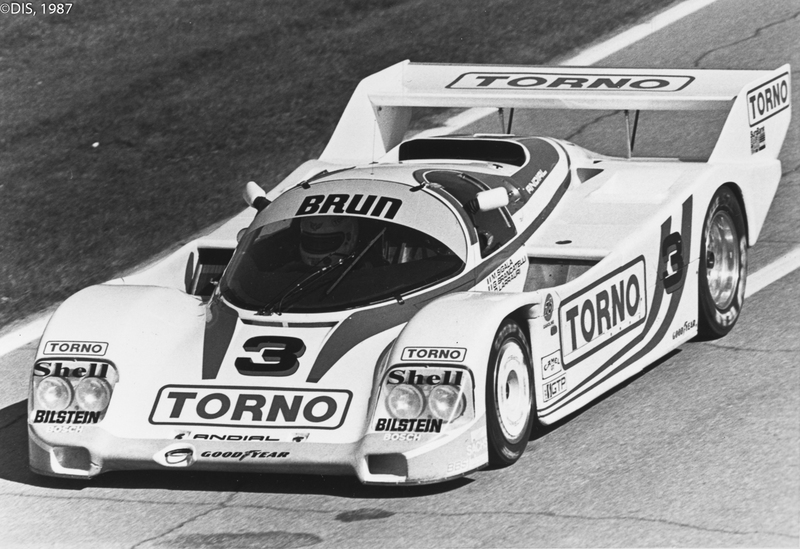 The German star shared the car with the owner and Klaus Ludwig. 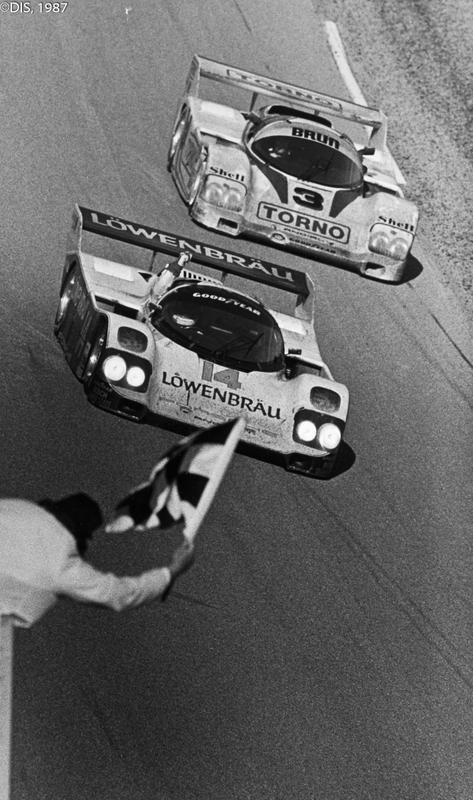 They led the first four hours or so of the race but contact while passing a back marker on the banking led to a big shunt and retirement. 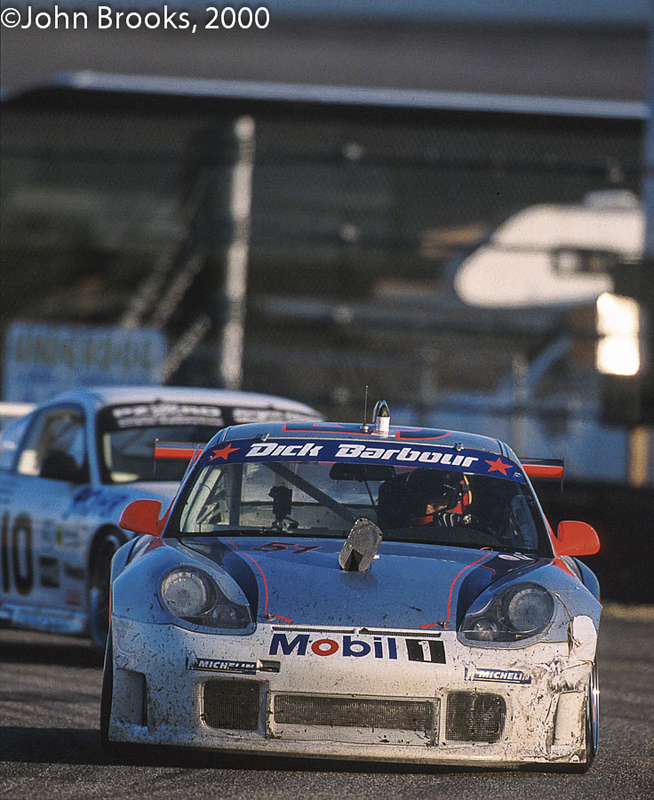 Also in the wars early in the race was the other front row Porsche of Jim Busby sharing with Bob Wollek and Darin Brassfield. 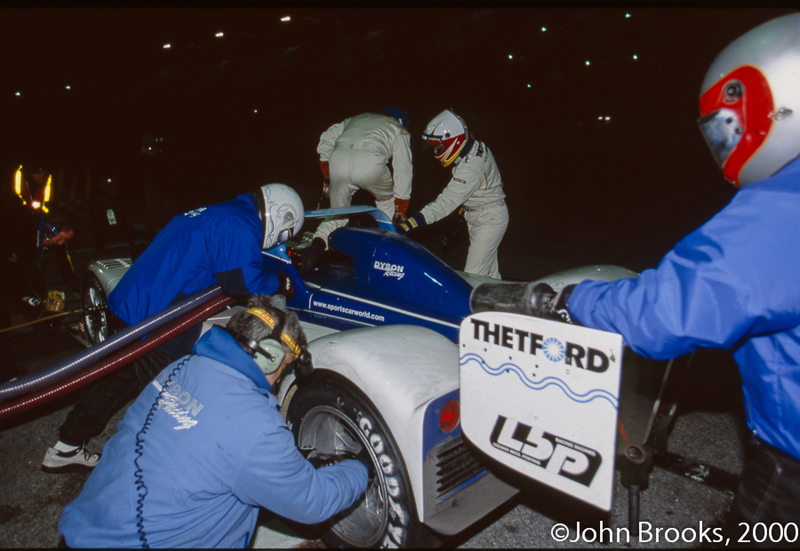 Valve failure after 89 laps put the BFGoodrich 962 out. 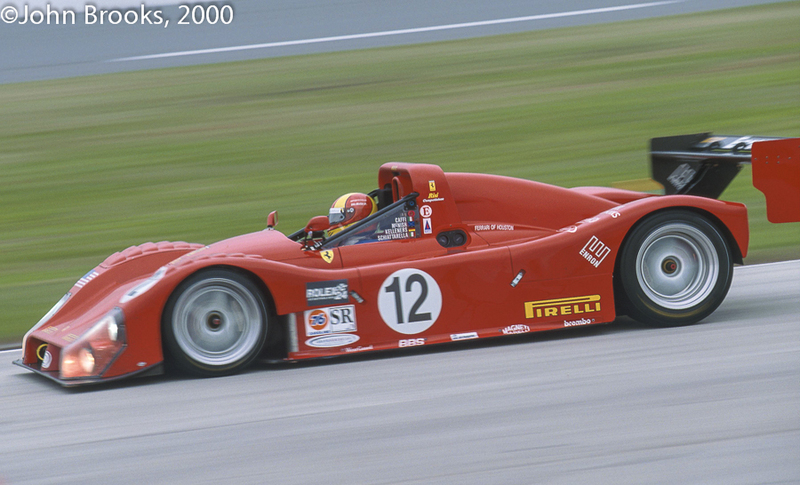 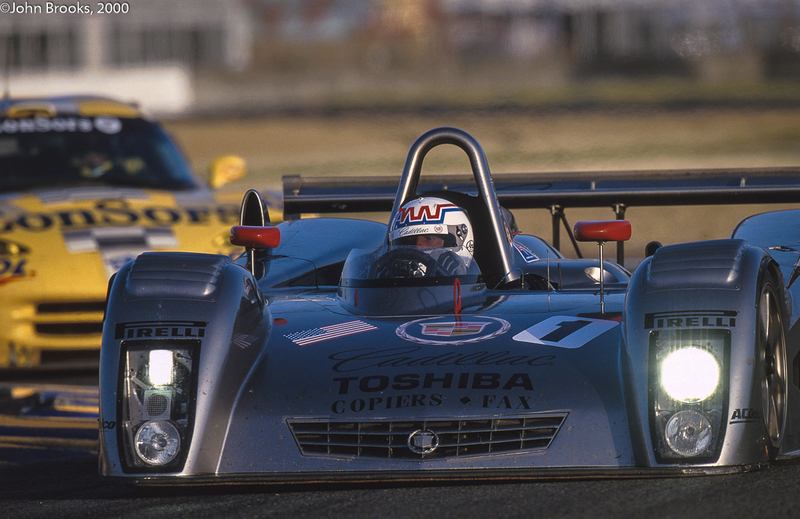 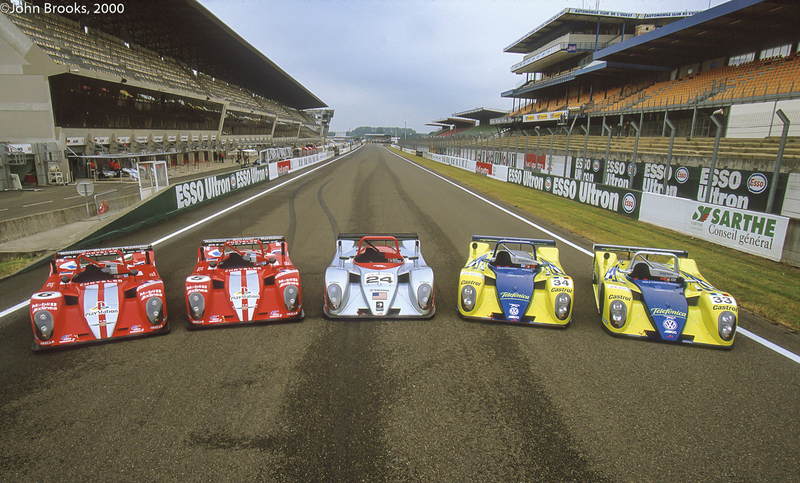 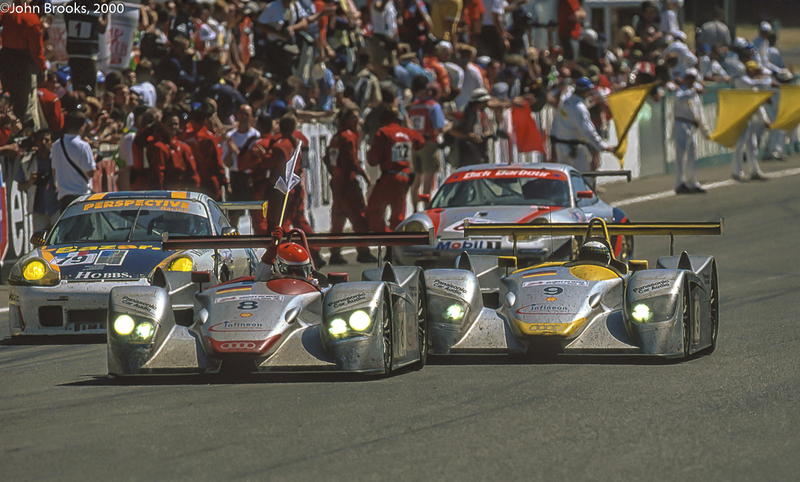 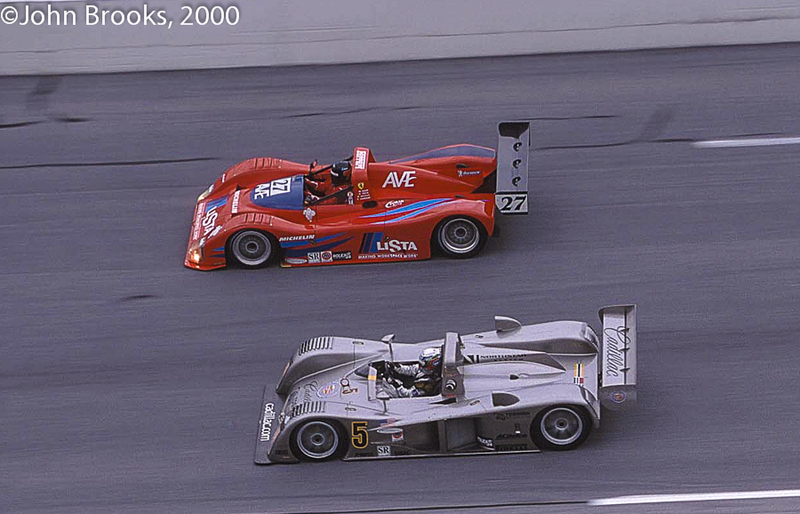 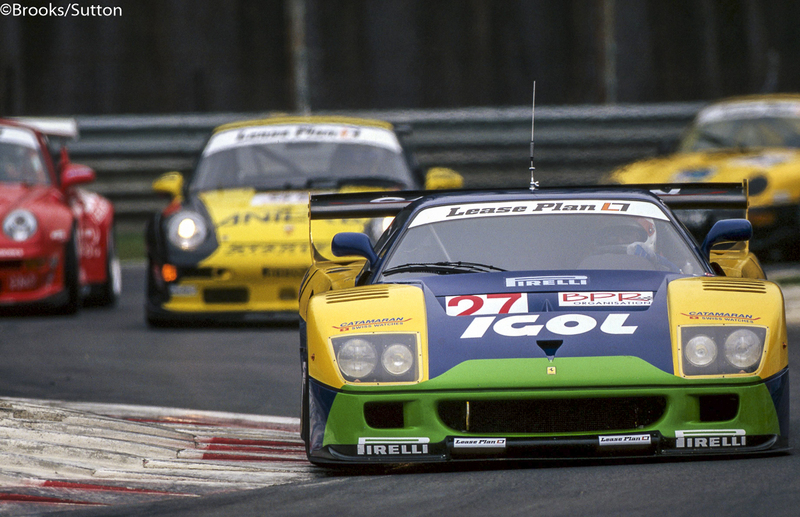 Three 962s were left at the top contesting victory. 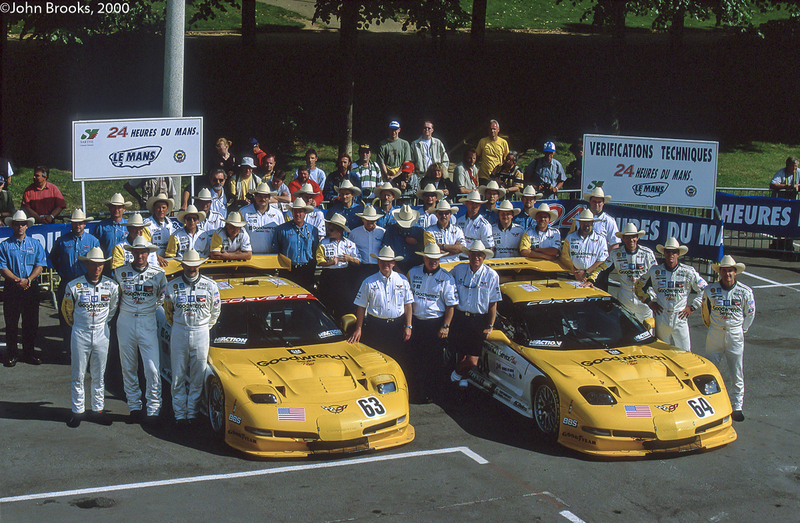 The American road-racing royalty of Rob Dyson, A.J. 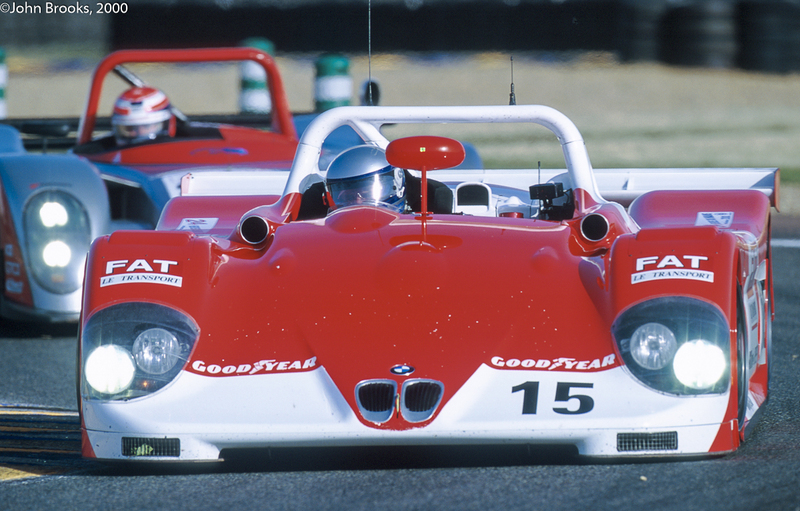 Foyt and Al Holbert each had a car capable of winning. 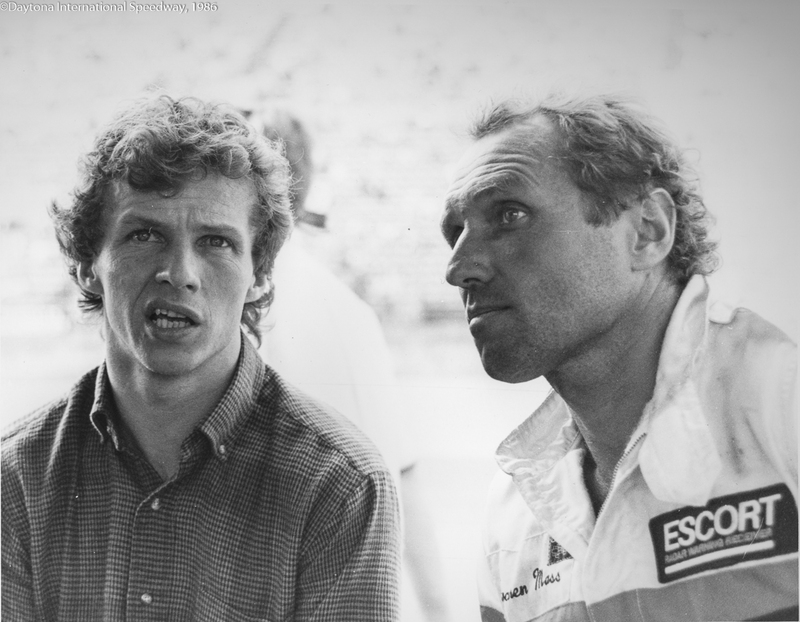 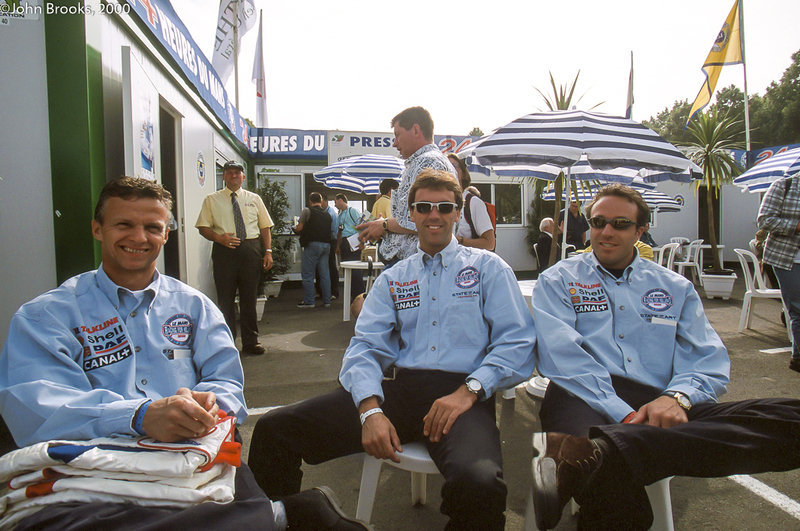 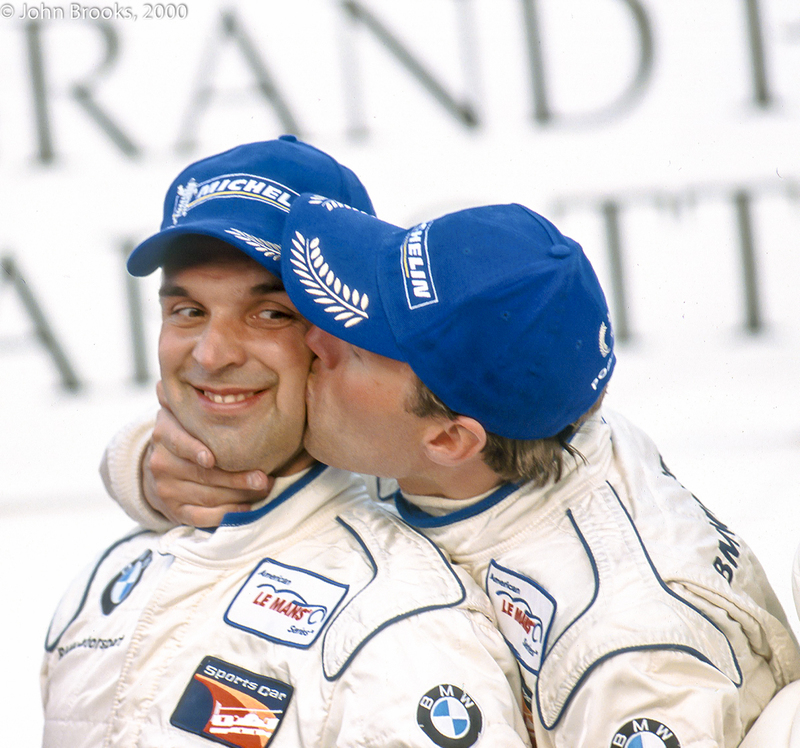 Dyson shared with his regular co-driver Price Cobb and they were supported by Vern Schuppan. 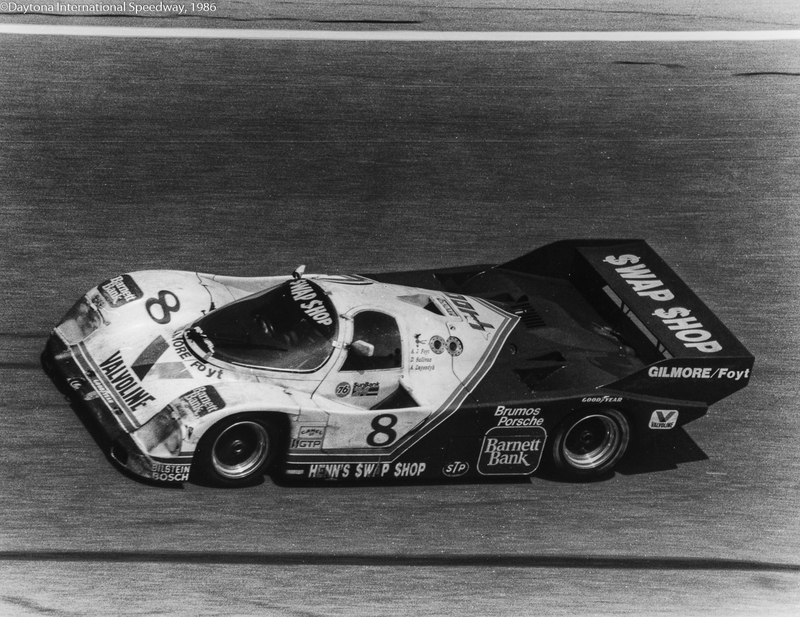 The legendary A. J. Foyt, twice a winner at the Daytona 24 Hours was looking for his third win, running with Danny Sullivan and Al Unser Sr. 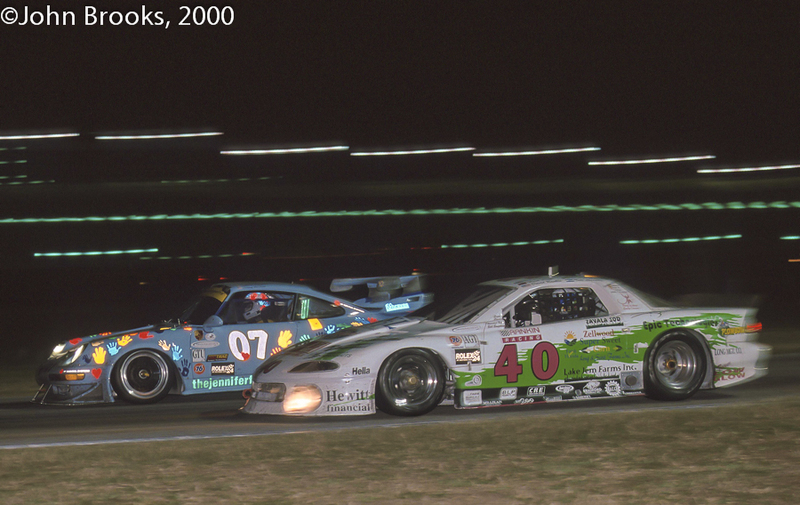 The race would come down a dog fight between the #1 and #14. 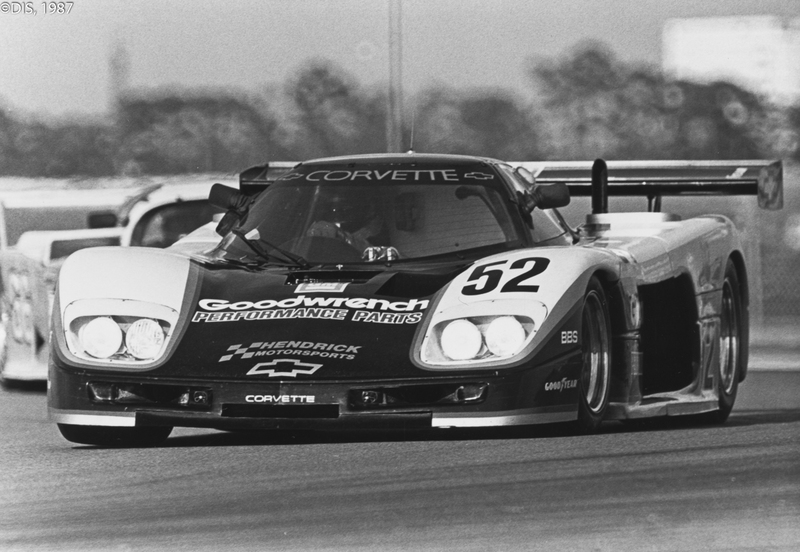 Best of the non-Porsches was the Chevrolet Corvette GTP-T710 of Sarel van der Merwe and Doc Bundy but they went out in the night with engine failure after running in the leading pack. 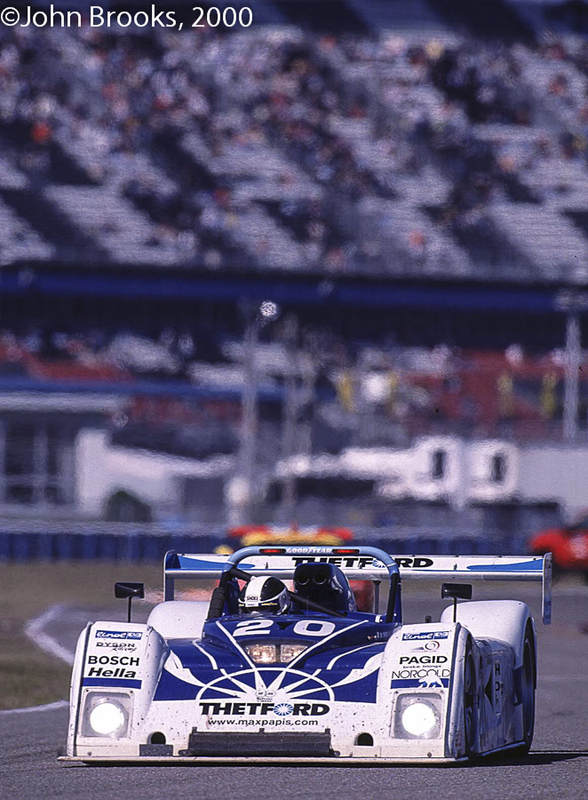 Another car that succumbed in the darkness to engine problems following a fire was the Jaguar XJR-7 of Bob Tullius, Hurley Haywood and John Morton after running as high as second. 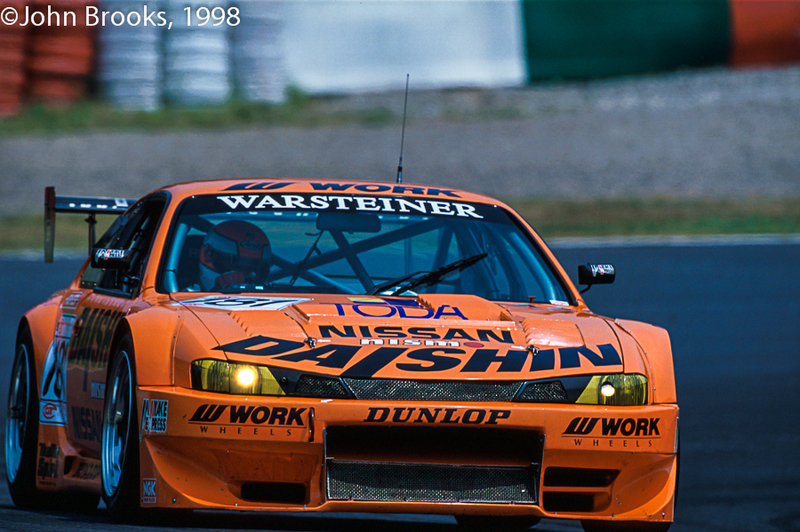 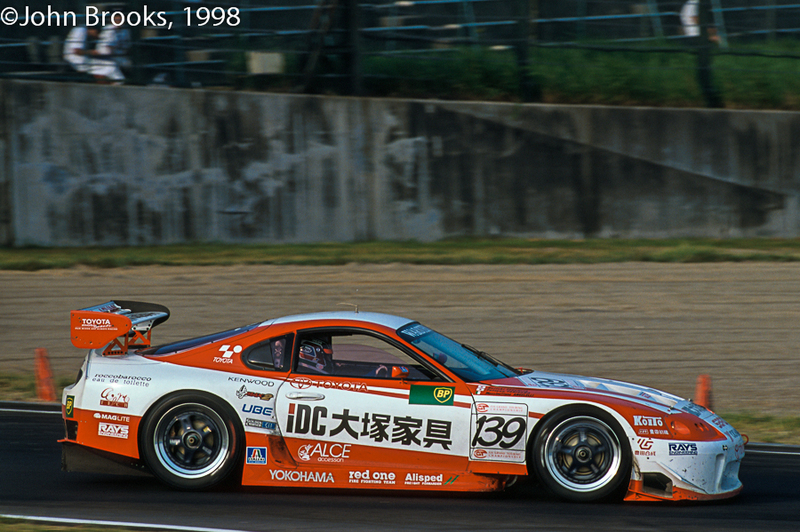 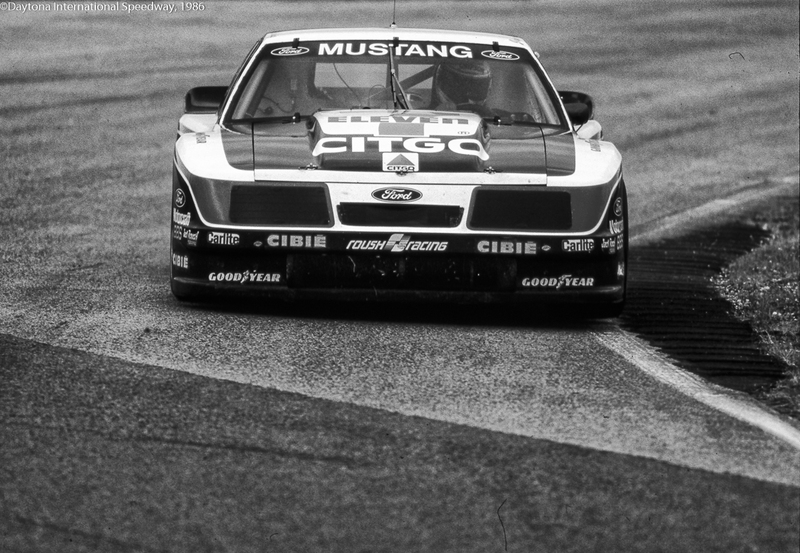 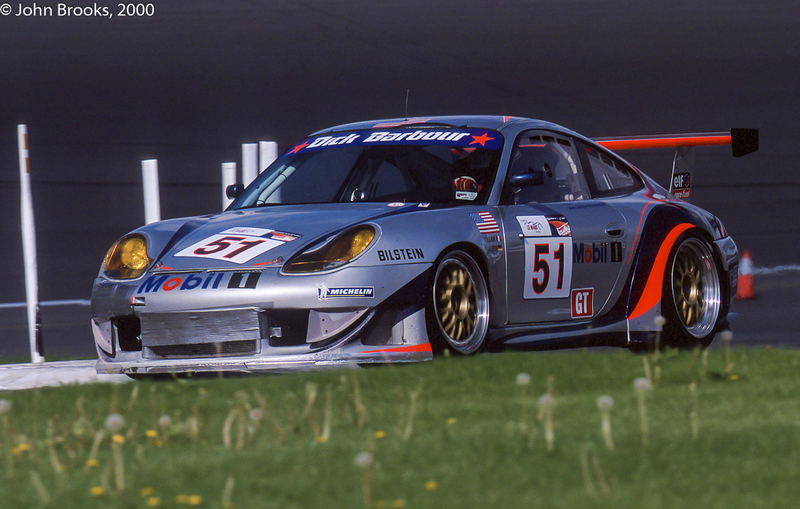 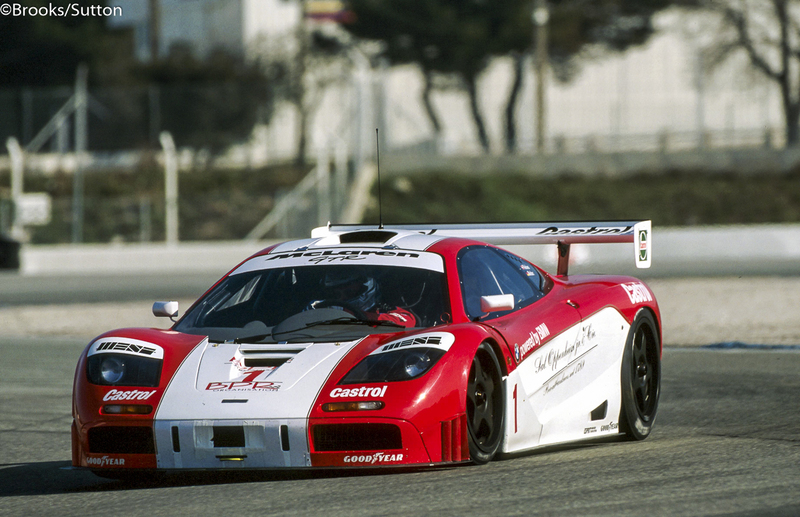 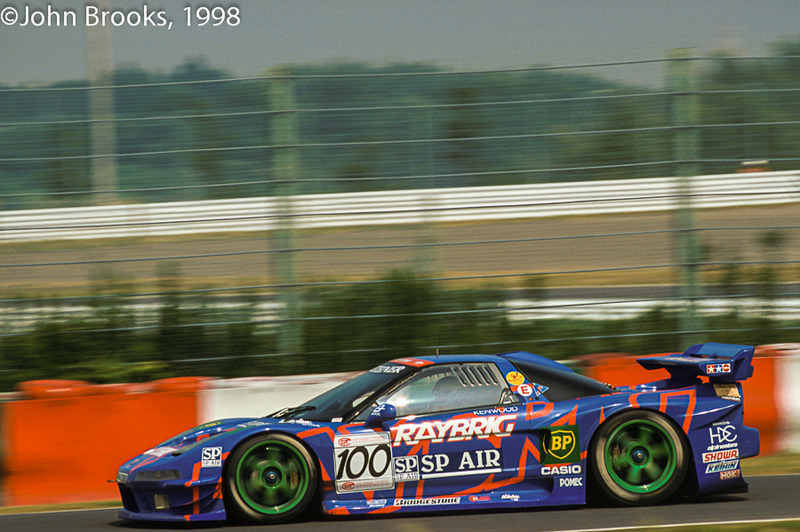 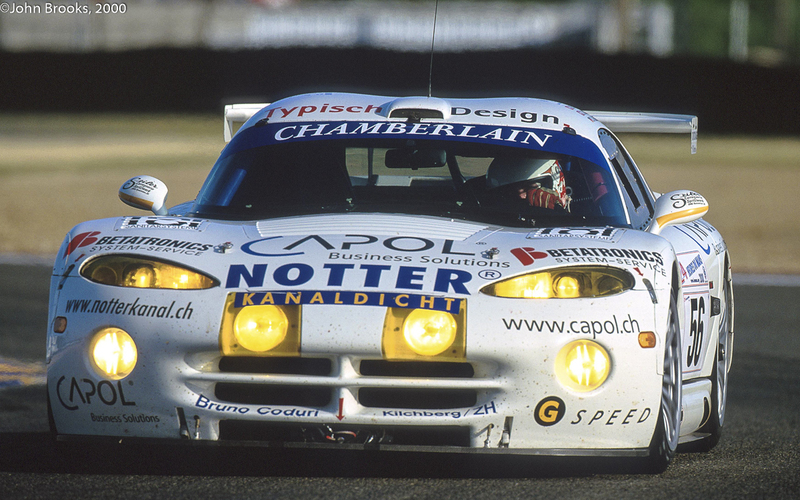 Less impressive in the GTP ranks was the Zakspeed Ford Probe GTP of David Hobbs, Whitney Ganz and Momo Moretti. 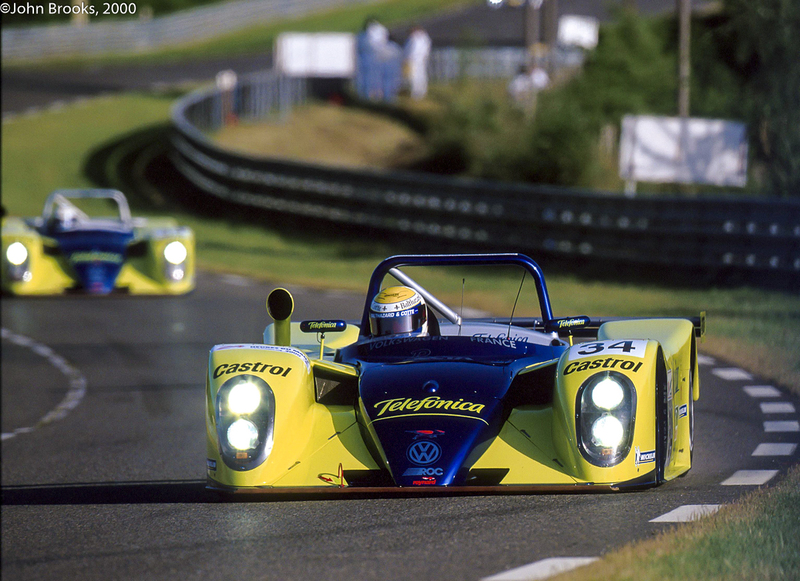 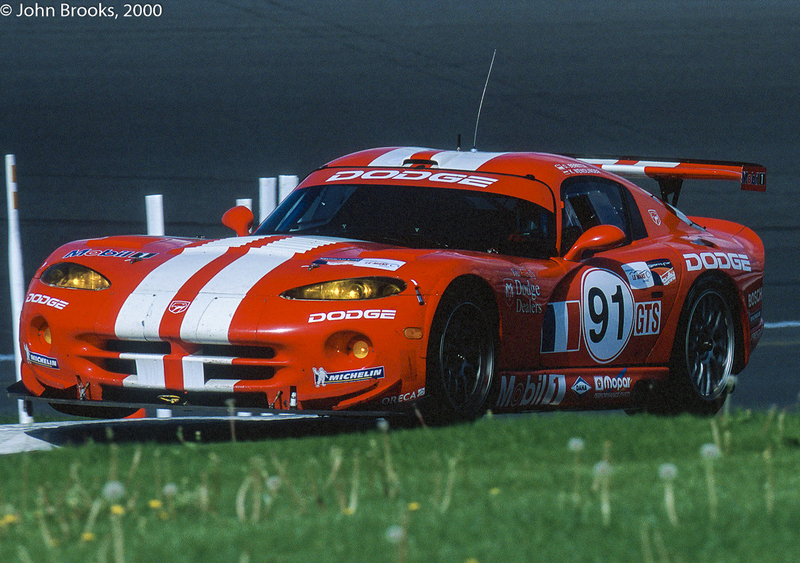 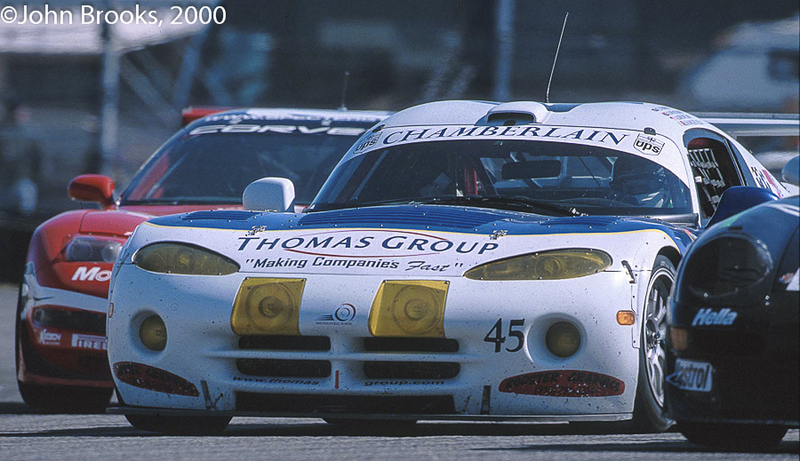 Not really competitive, they also disappeared in the night with engine maladies. 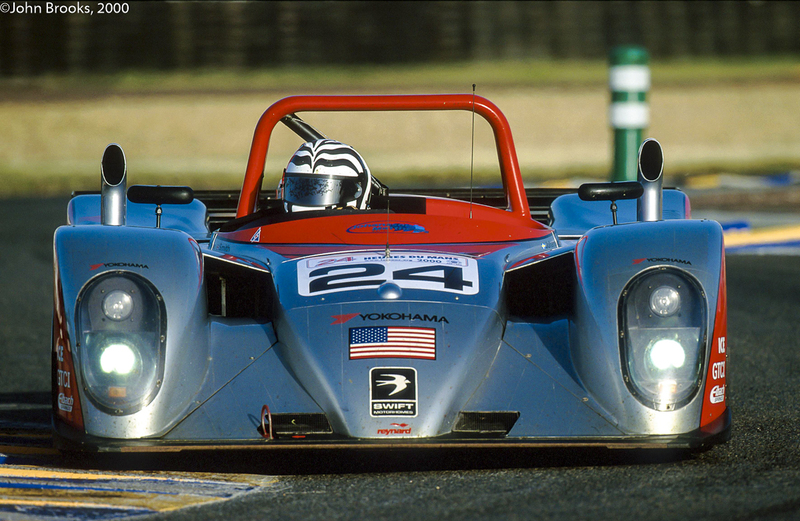 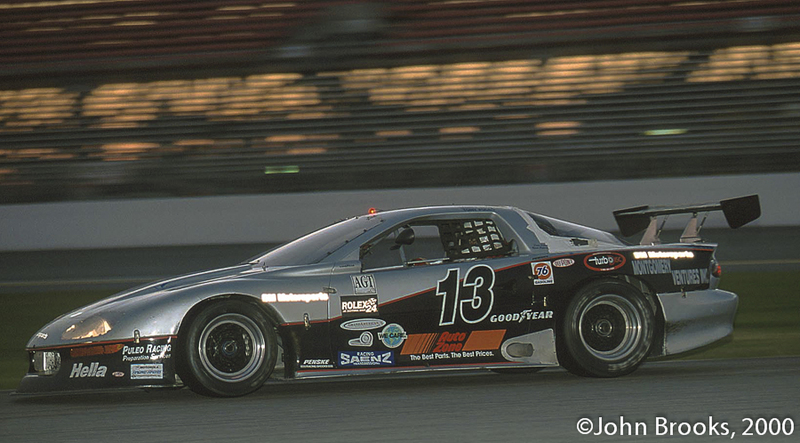 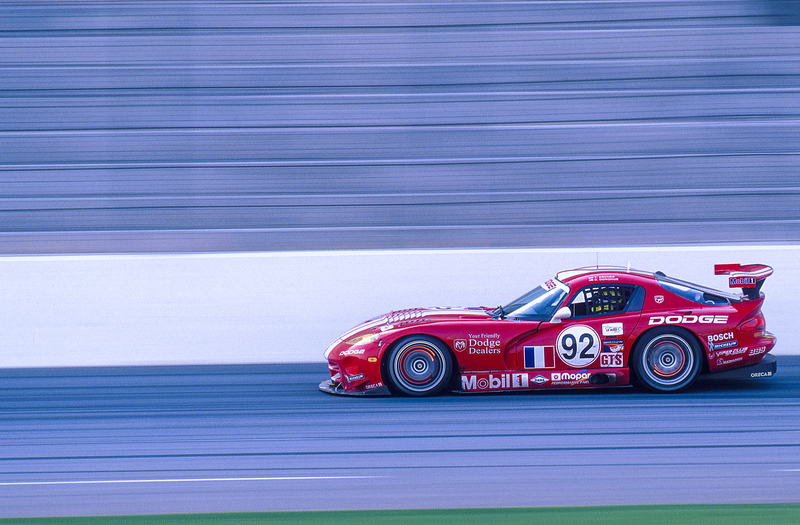 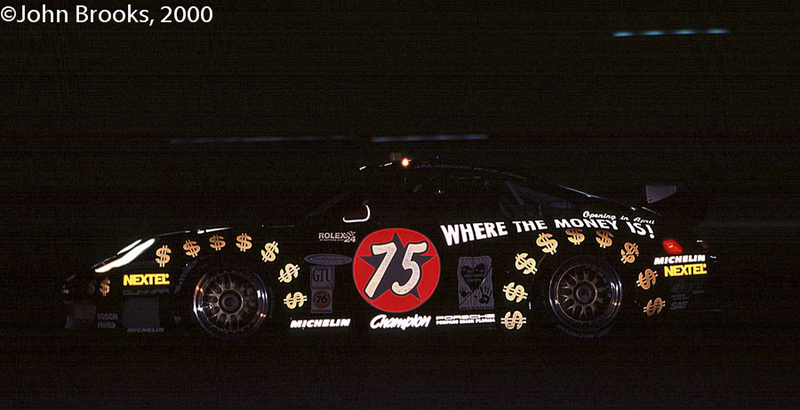 IMSA GTP Lights were the property of the factory entered Spice-Pontiac Fiero. 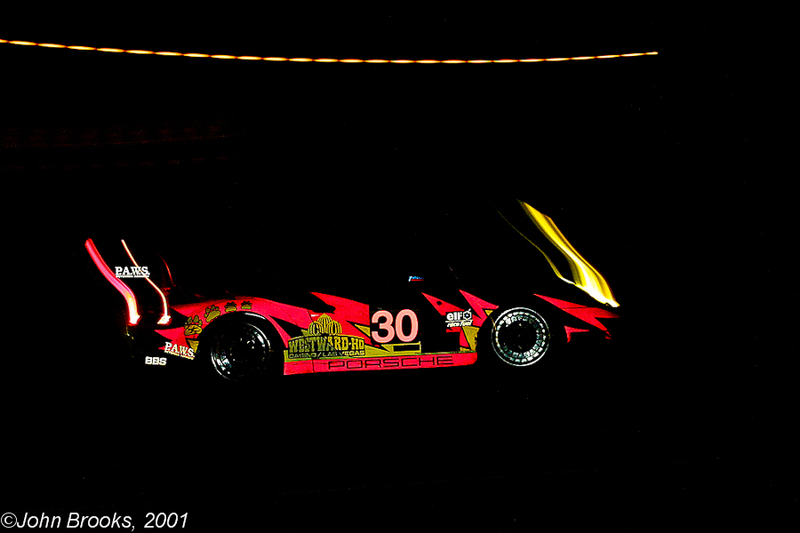 Bob Earl, Don Bell and Jeff Kline overcame electrical issues in the night to run out winners. 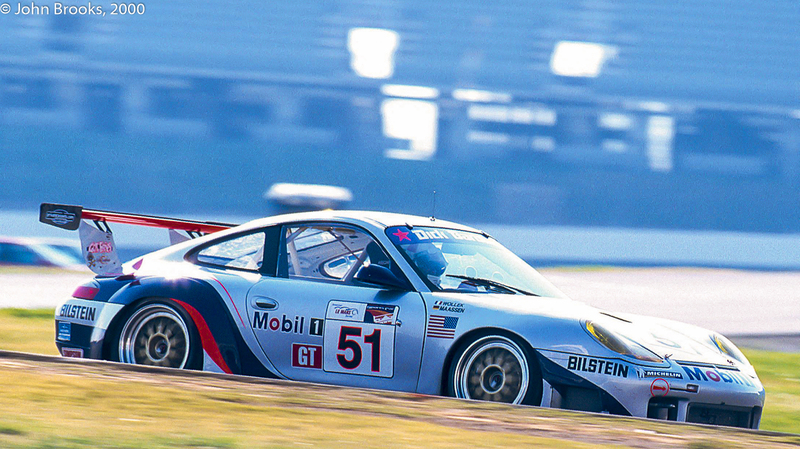 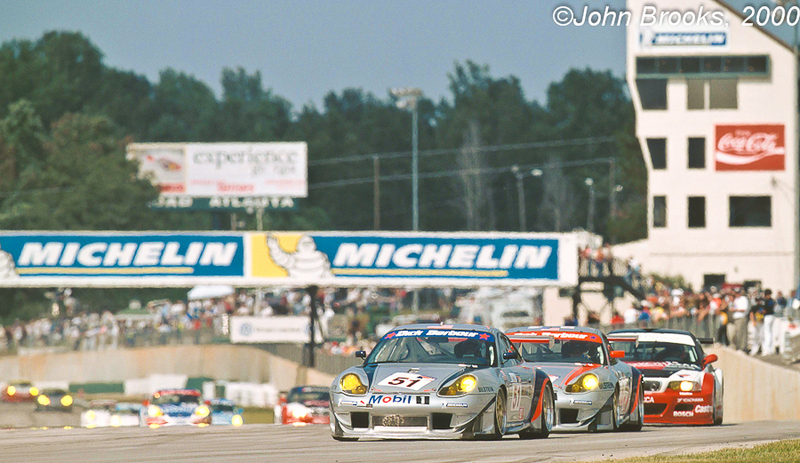 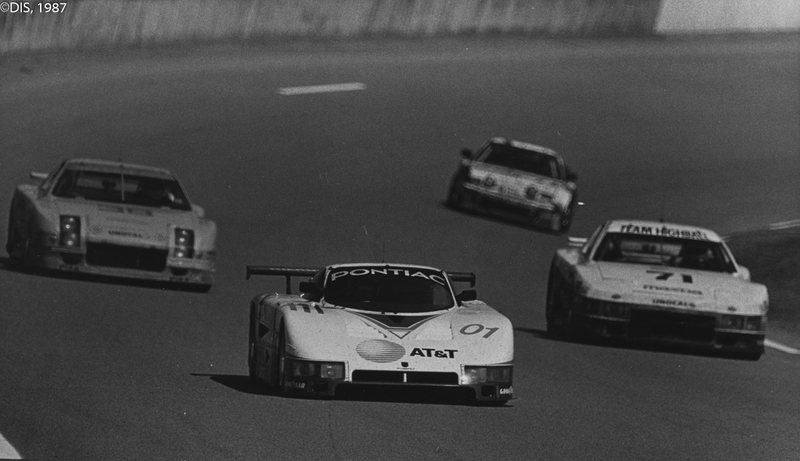 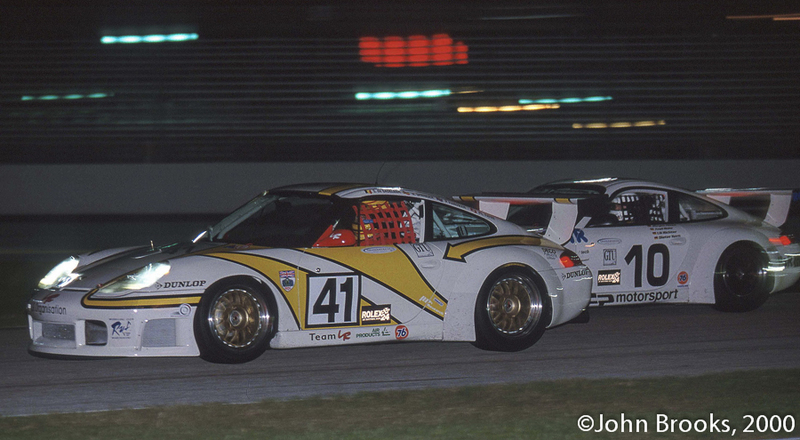 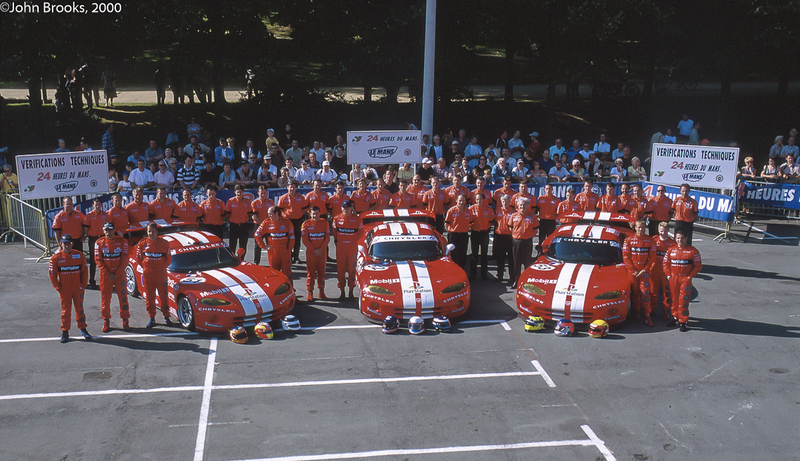 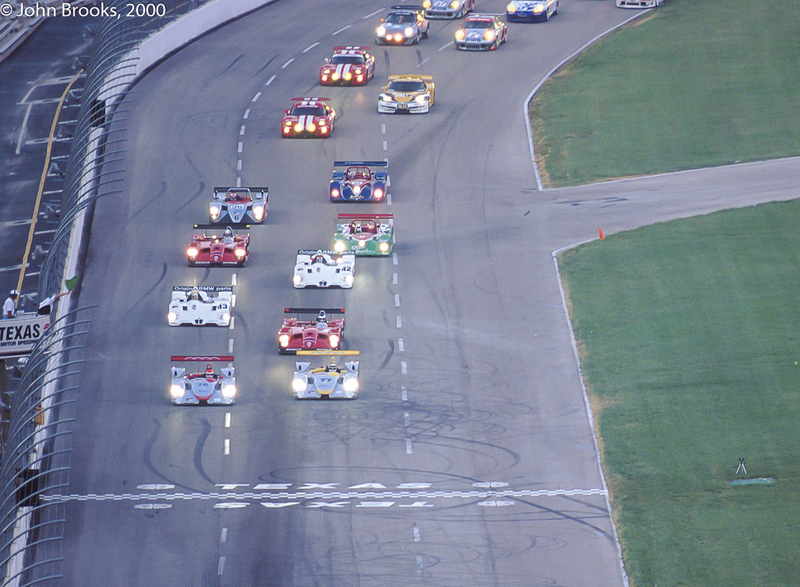 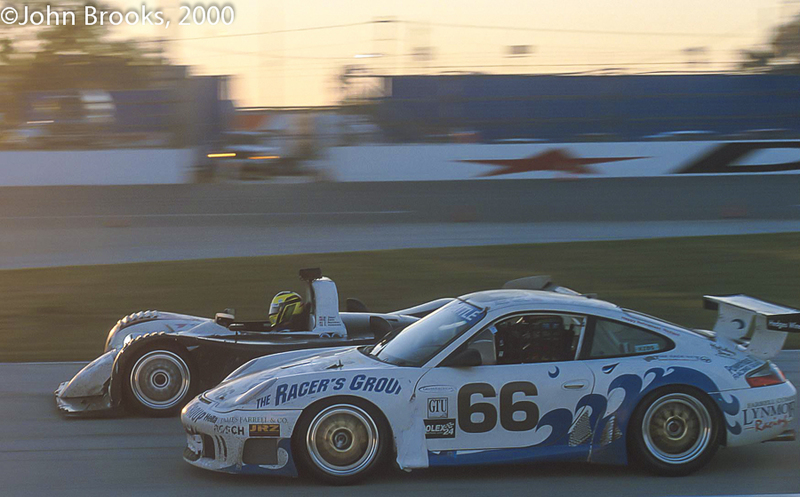 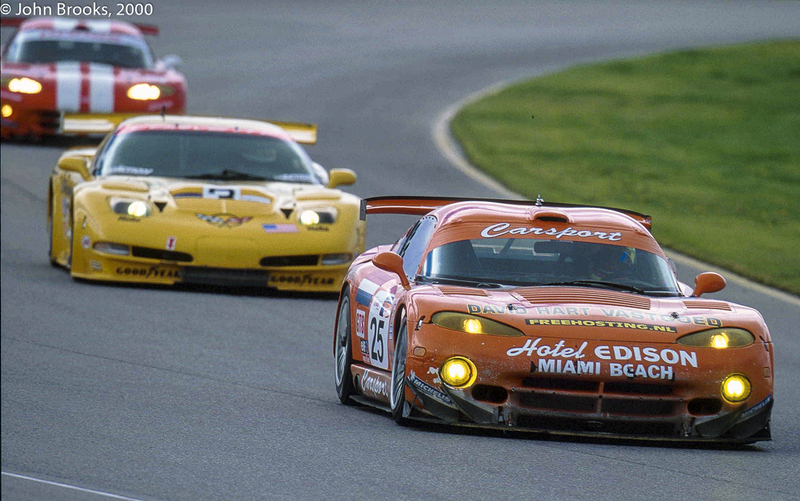 IMSA GTO class was hotly contested. 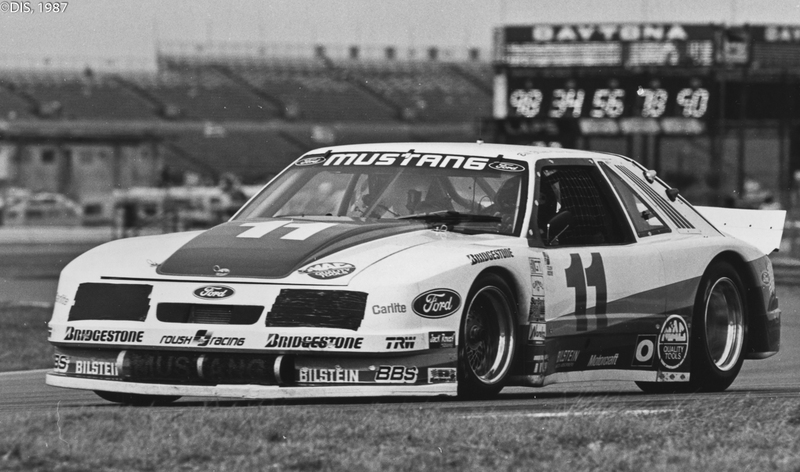 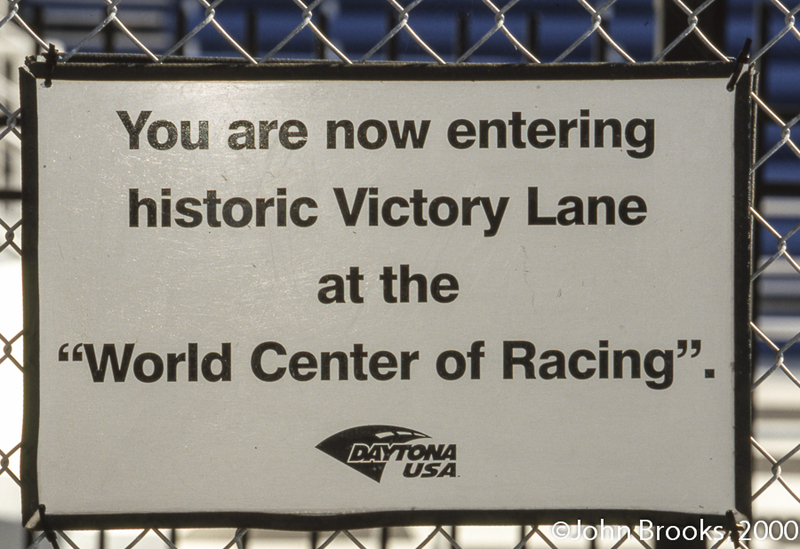 The Roush Ford Mustang was chasing a hat trick of wins at Daytona. 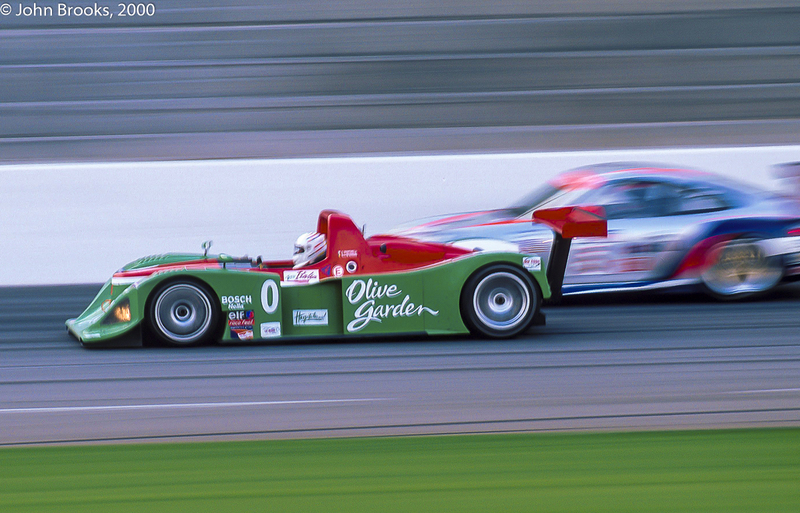 NASCAR star Bill Elliott ran with Scott Pruett, Lyn St. James and Tom Gloy. 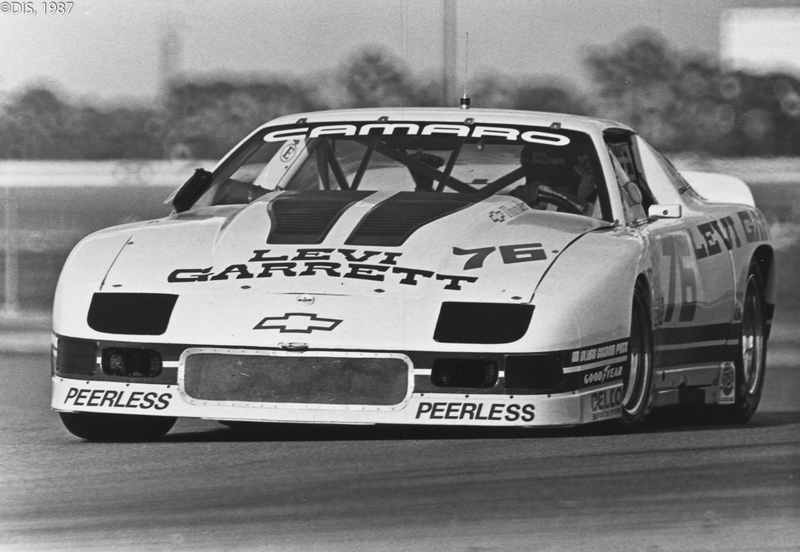 More NASCAR talent was on show in the Protofab Chevrolet Camaro of Darrell Waltrip, Terry Labonte and Greg Pickett. 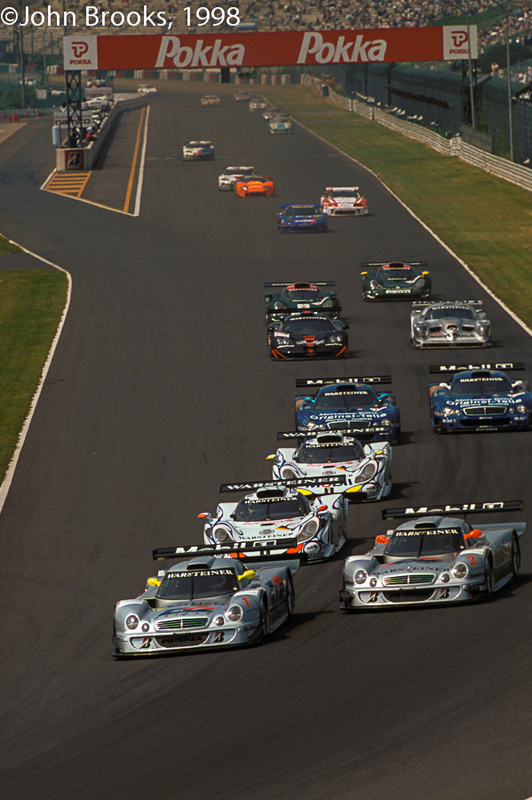 They led the class at the halfway point but lost a wheel out on track and that was that. 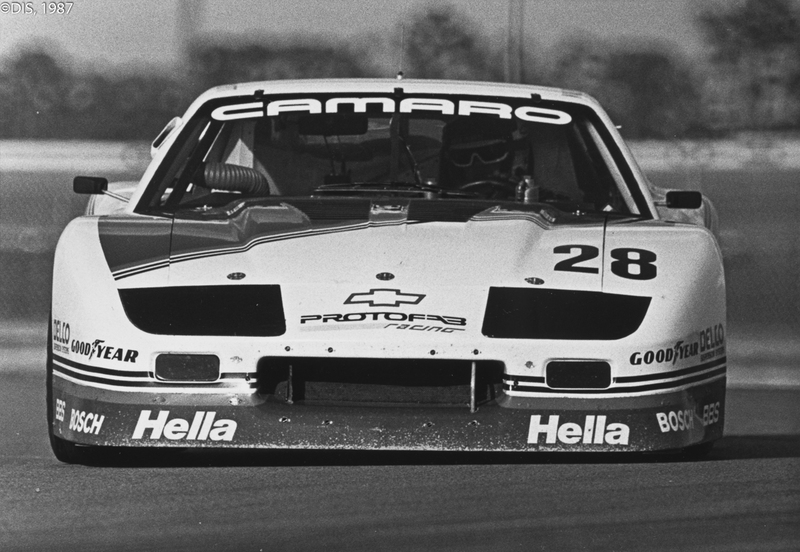 Another strong Camaro was the Rick Hendrick-entered Peerless version for Jack Baldwin and Eppie Wietzes but they were another victim of engine issues. 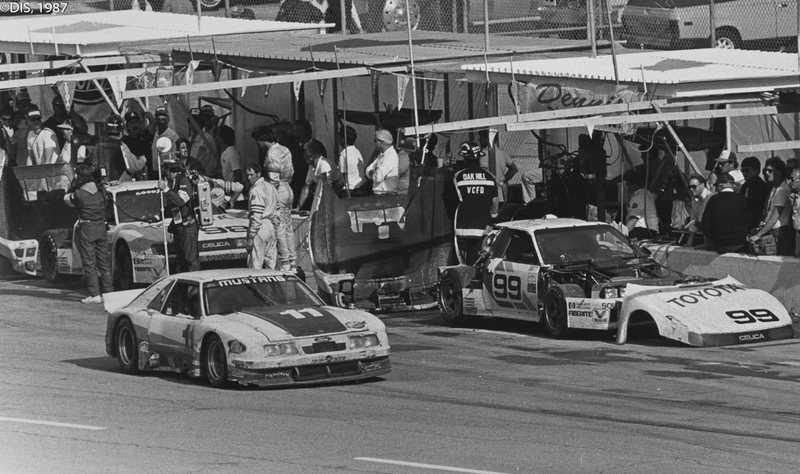 Dan Gurney had a pair of Toyota Celicas, #98 for Chris Cord and Steve Millen, #99 had Ricky Rudd, Jerrill Rice and Juan Manuel Fangio ll on driving duties. 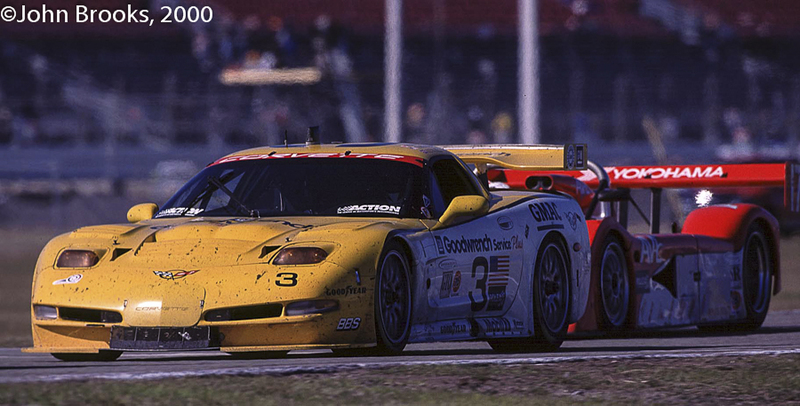 Problems late in the race struck both All American Racing cars with #99 retiring and #98 clinging on to second spot despite rear suspension issues. 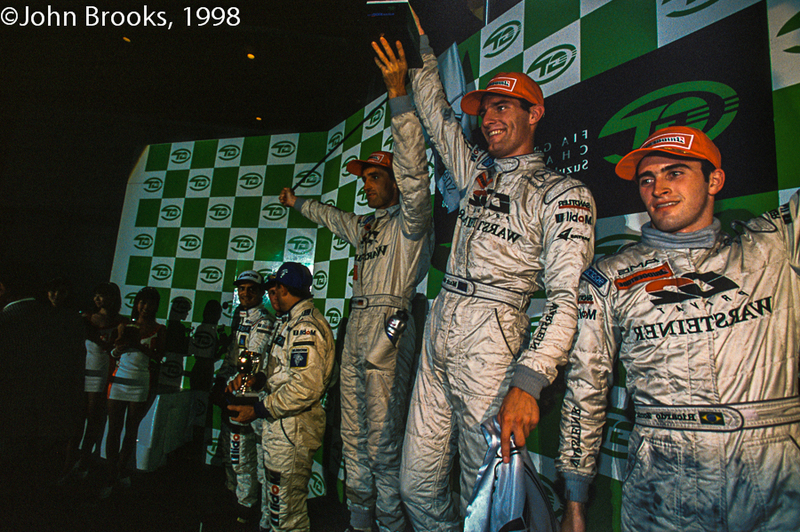 All of which propelled #11 to the top step of the podium. 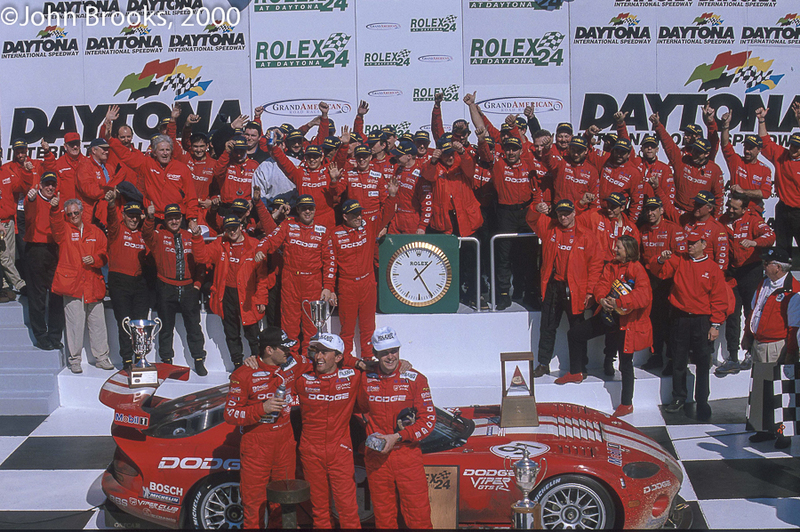 A sweet victory for the Roush Ford outfit. 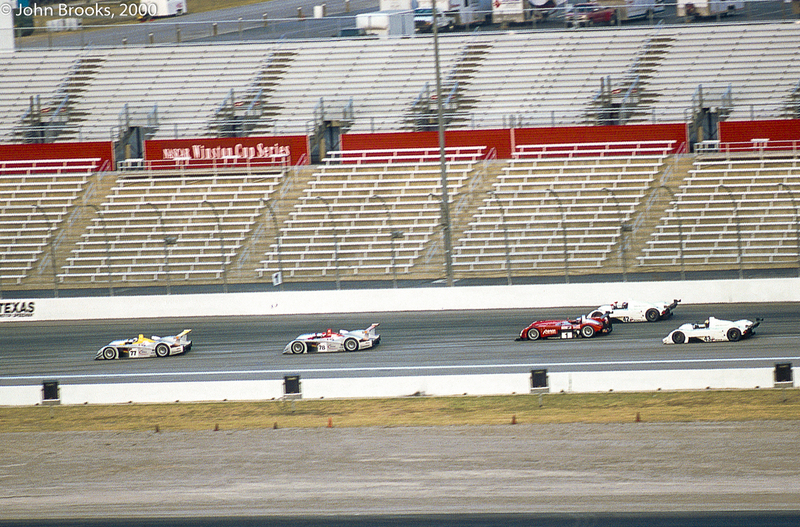 Back at the head of the field things appeared to be going the way of Foyt’s 962 but there was not much margin in it. 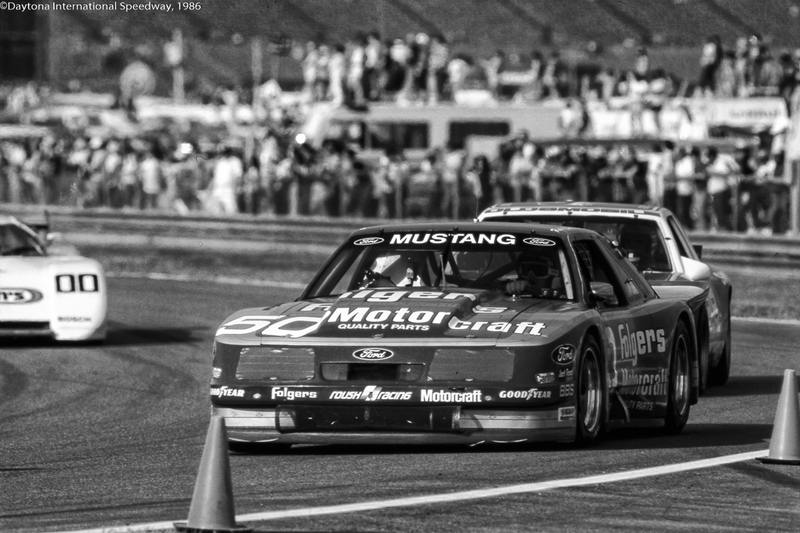 The Unsers engaged in an early morning Father and Son duel after which they had breakfast together. 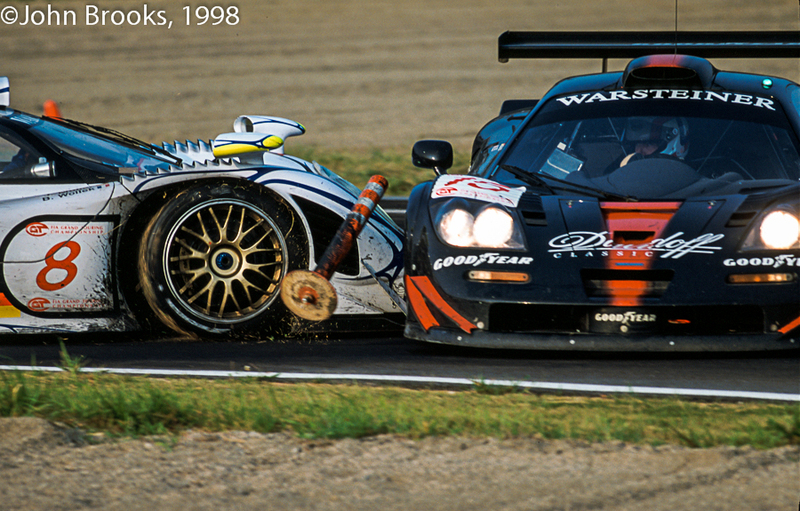 There were epic battles between the two teams and any advantage gained was soon pulled back. 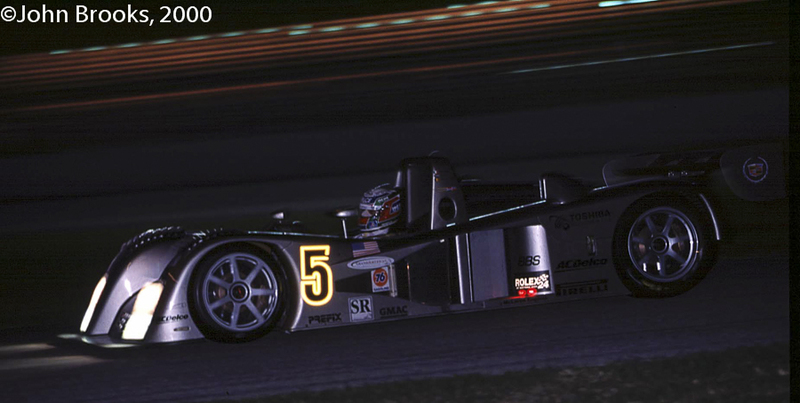 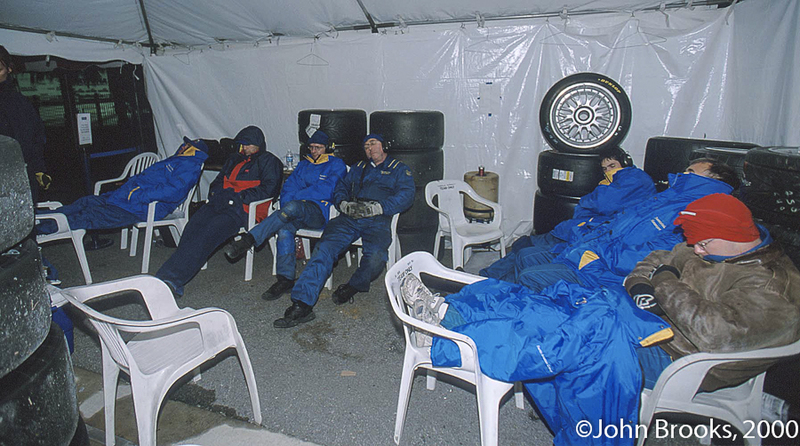 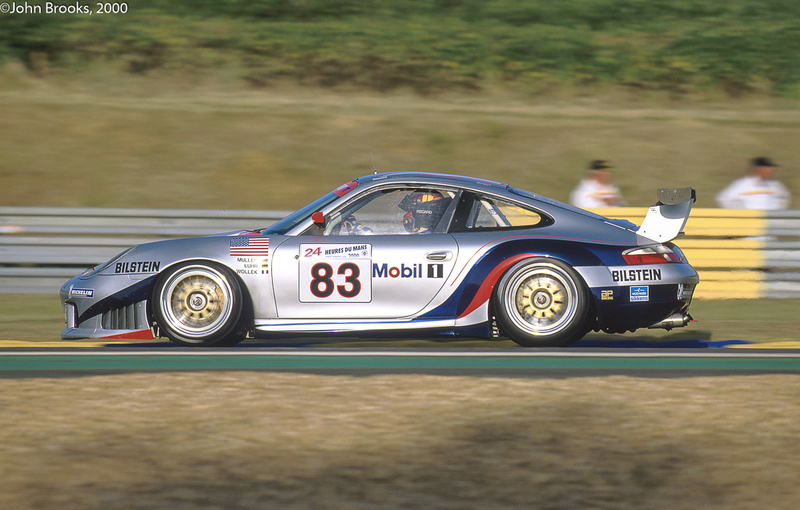 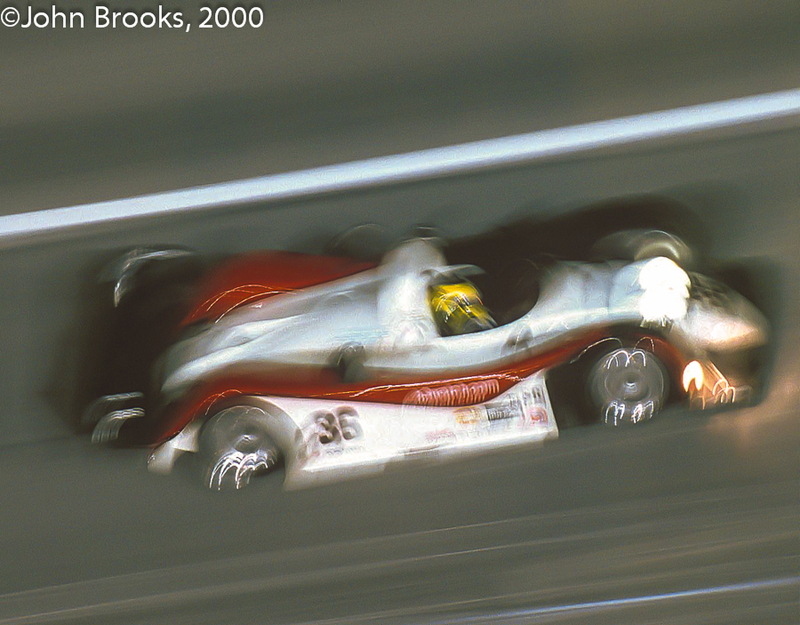 Al Holbert had to change his strategy as both Al Unser Jr. and Chip Robinson were exhausted and Derek Bell needed time to recover for the final stint. 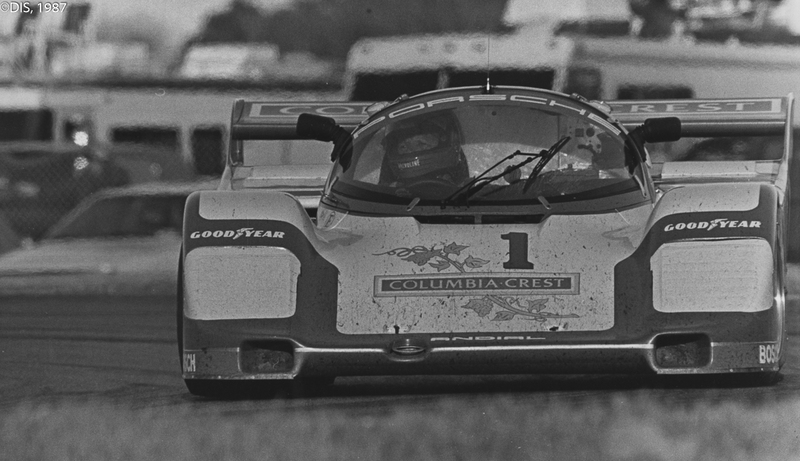 Al jumped into the Porsche to take the fight to rival 962. 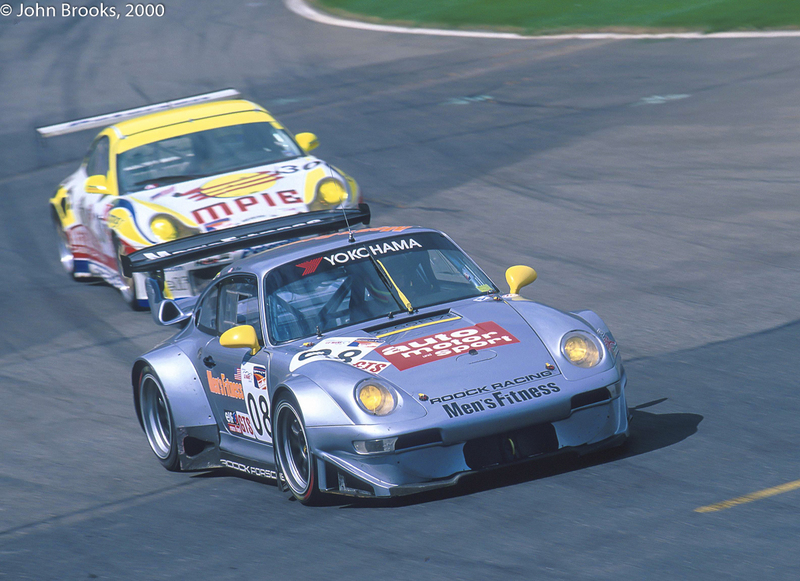 The race was decided in the final hour when the normally bullet-proof Porsche motor in the #1 car let go with 50 minutes left to run. 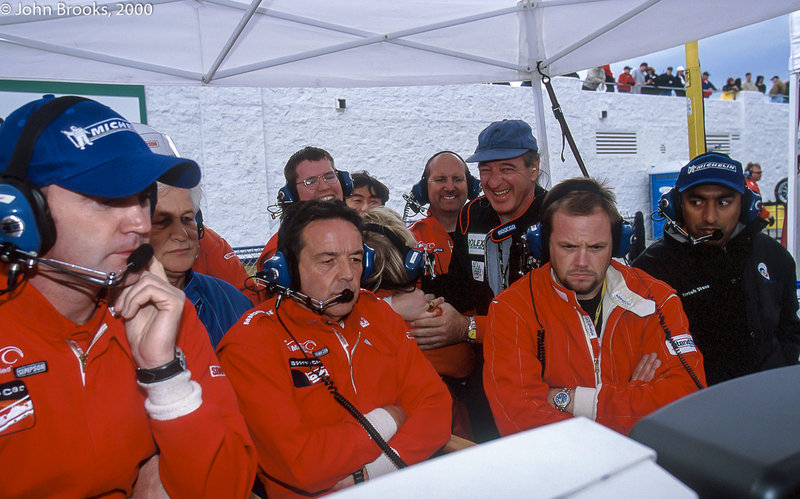 Victory for the Holbert car, huge disappointment for Foyt’s outfit. 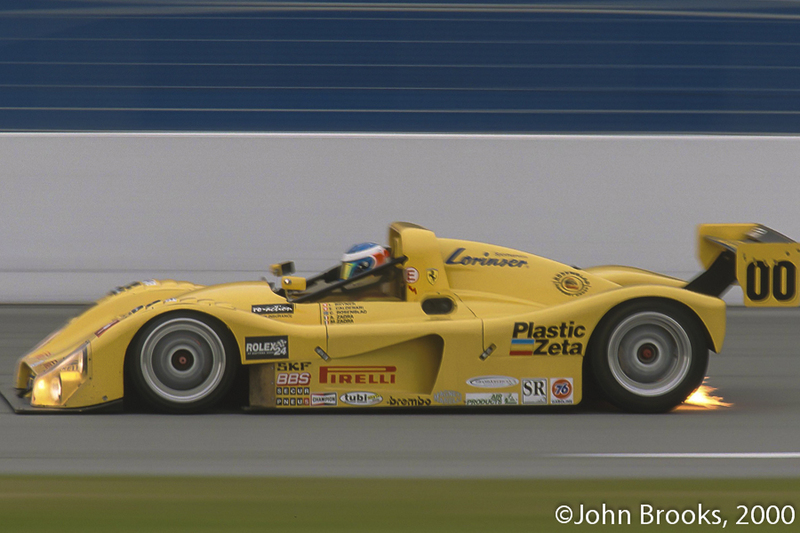 Second place fell to the Brun Motorsport 962 that had lost 14 laps in the first hour with a faulty weld on a pipe. 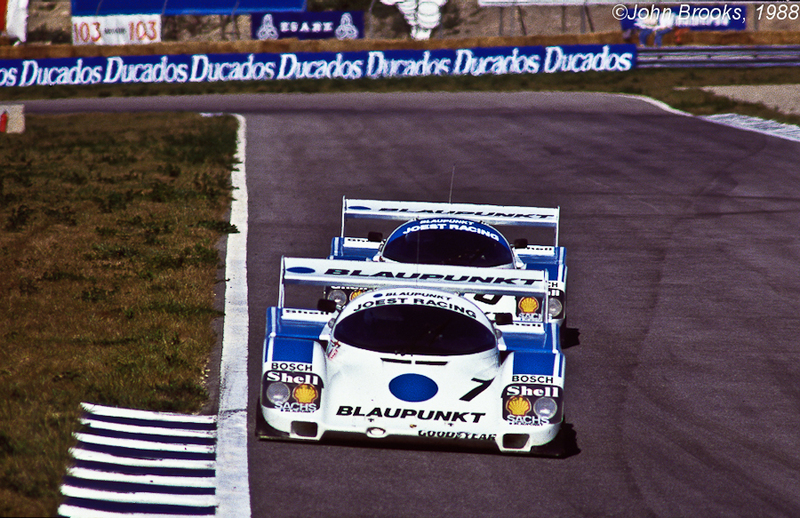 Once that was fixed they began the long climb back from 54th place. 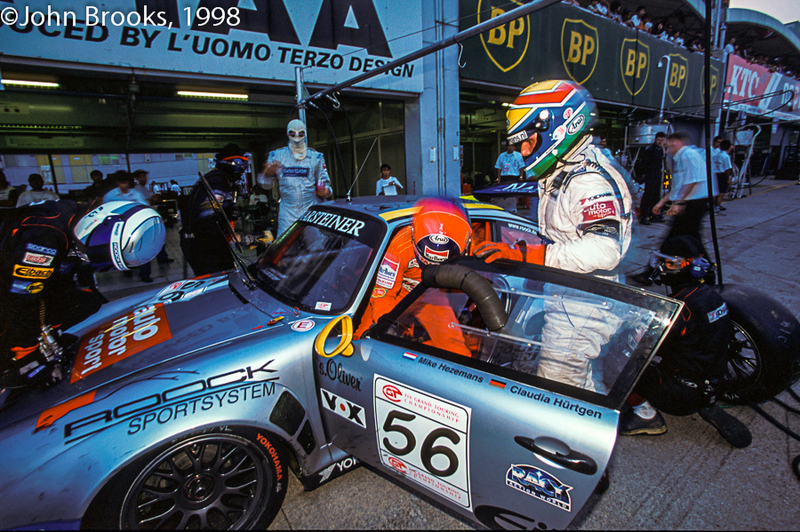 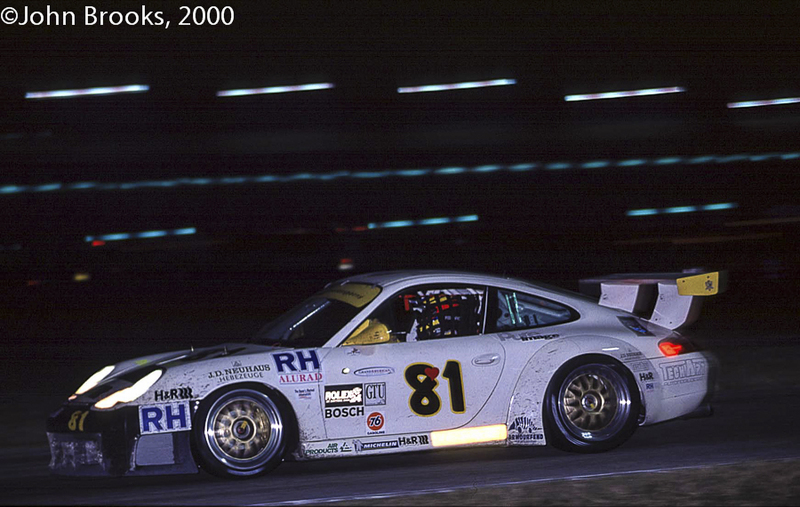 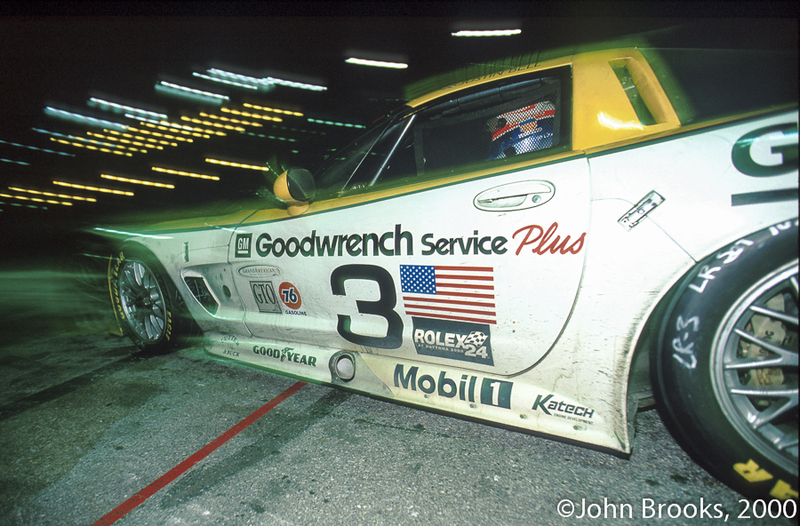 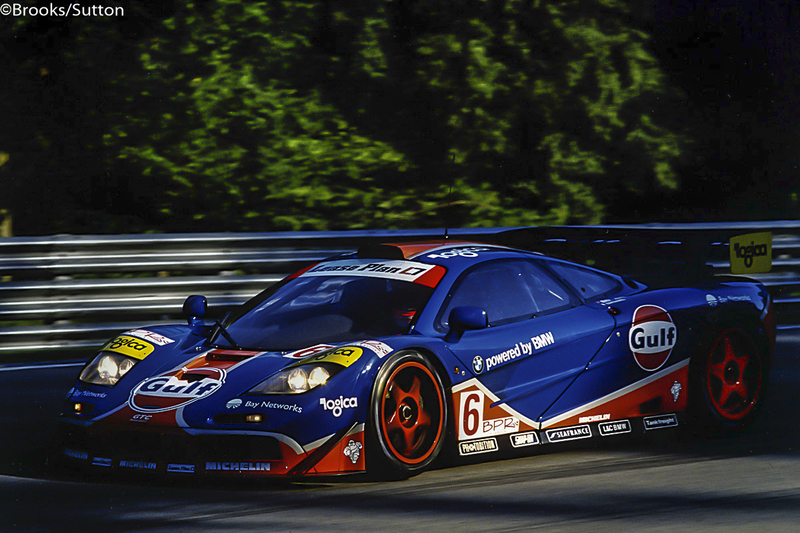 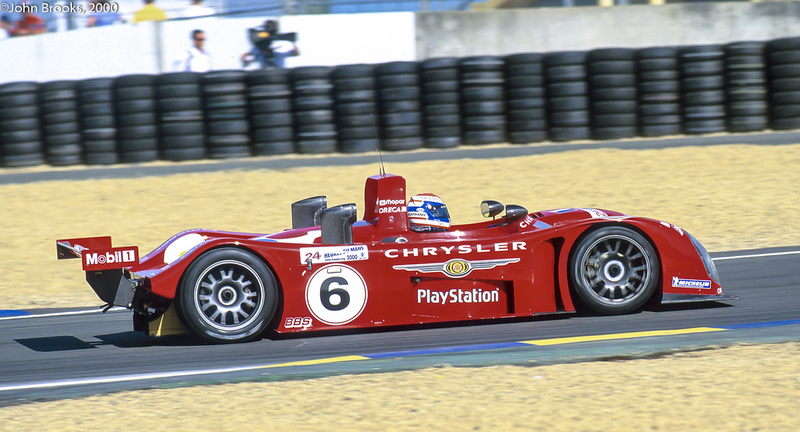 They were the quickest car on track during the night, sometimes as much as five seconds a lap! 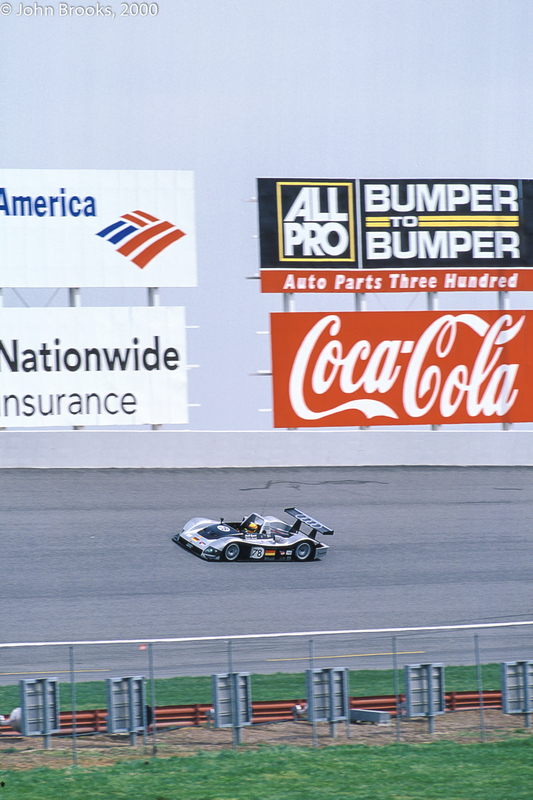 Once the Foyt car stopped they were elevated to the podium just ahead of the Dyson 962 with the unfortunate Texan effort classified as fourth. 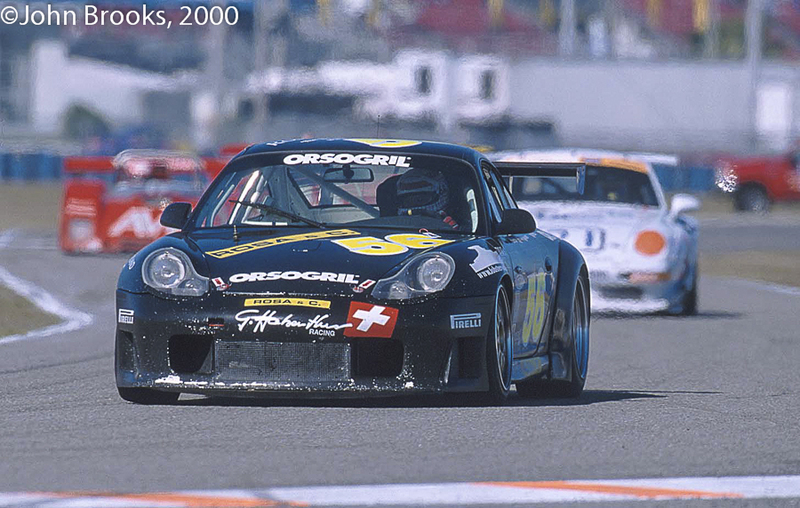 It was a just reward for Walter’s team of Oscar Larrauri, Massimo Sigala and Gianfranco Brancatelli. 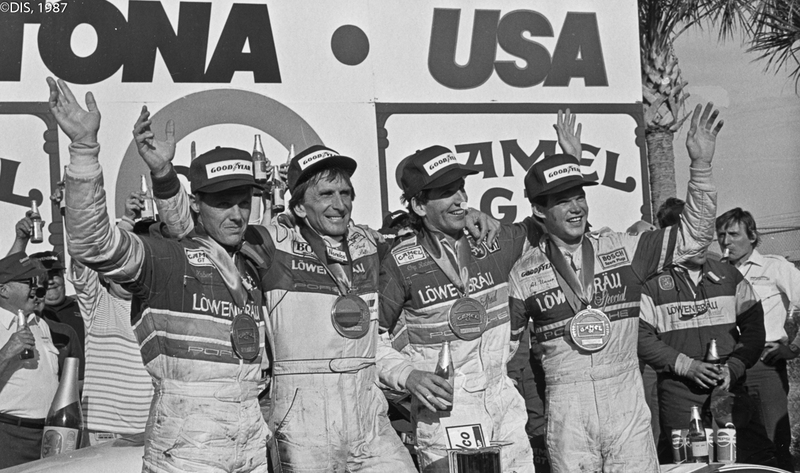 Messrs Holbert, Bell, Robinson and Unser Jr. celebrated a famous victory, a really tough race for them. 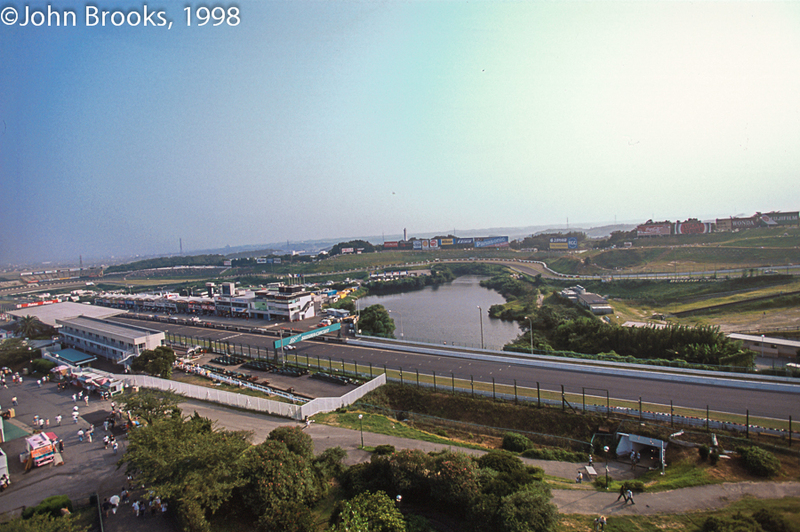 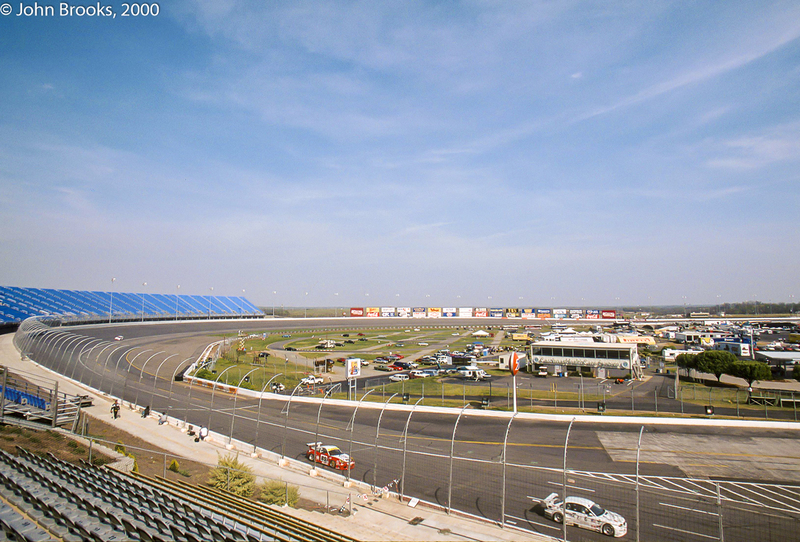 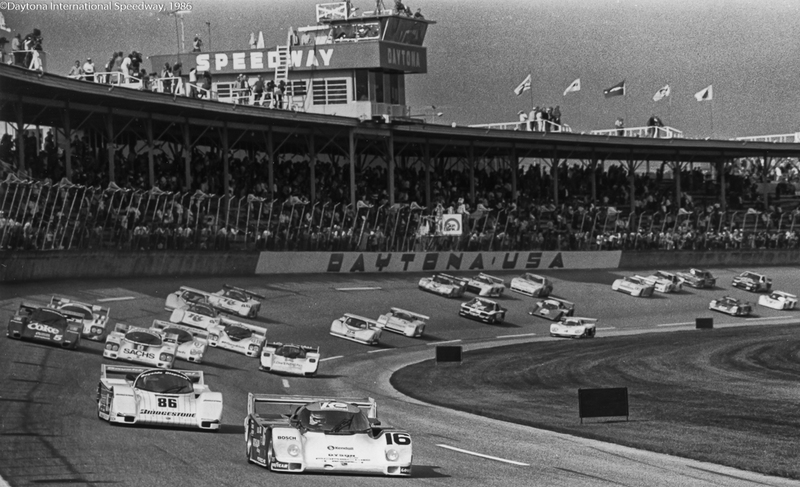 The race was flat out from the start and the winning crew covered 753 laps breaking the previous record set in 1986 by 41 laps or 146 miles. 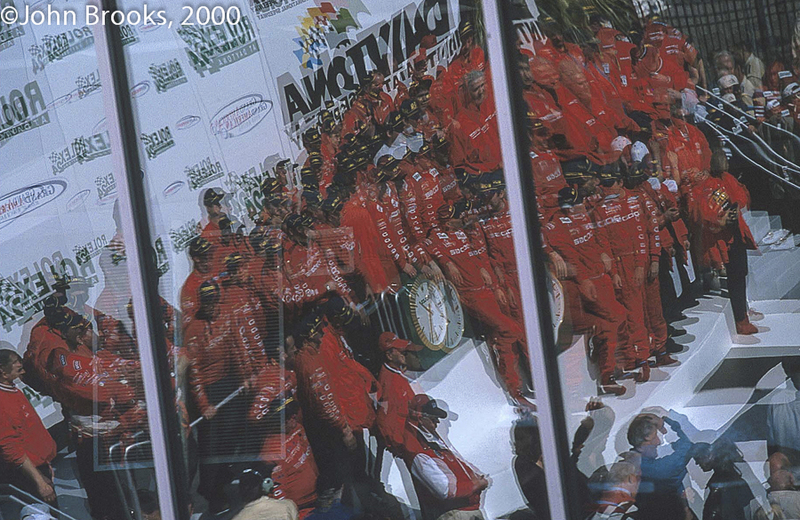 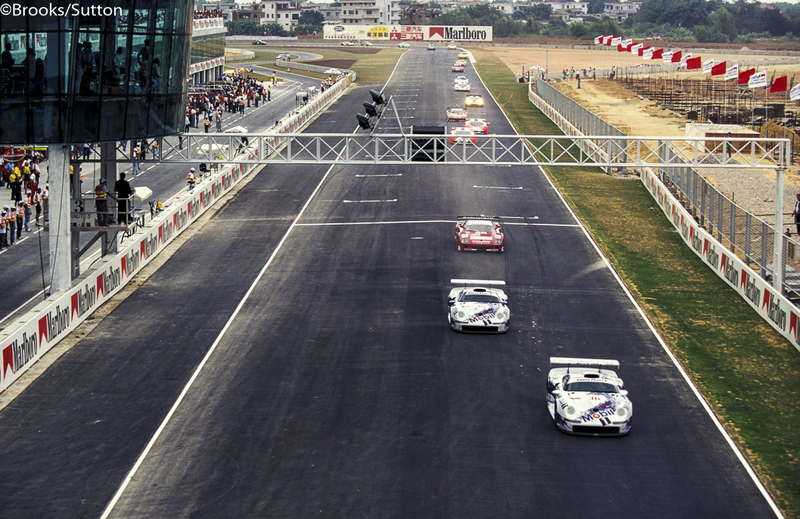 The race average speed was 111.6mph, a champion performance by any standards. 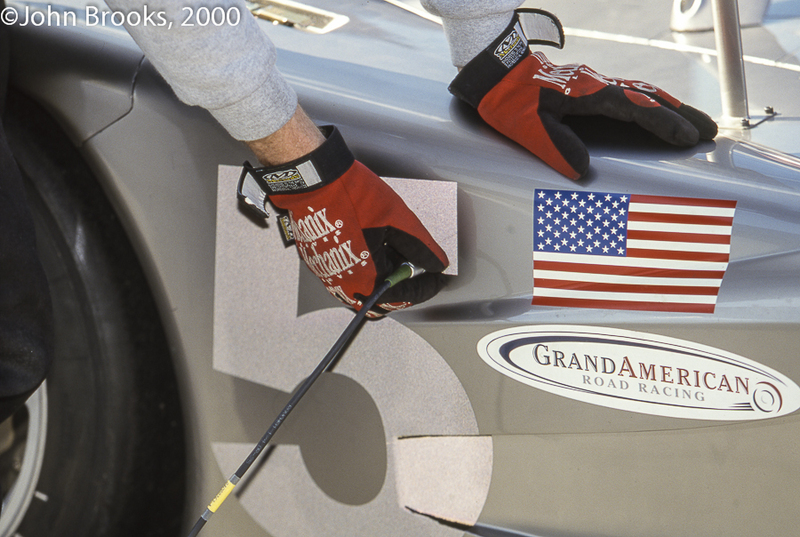 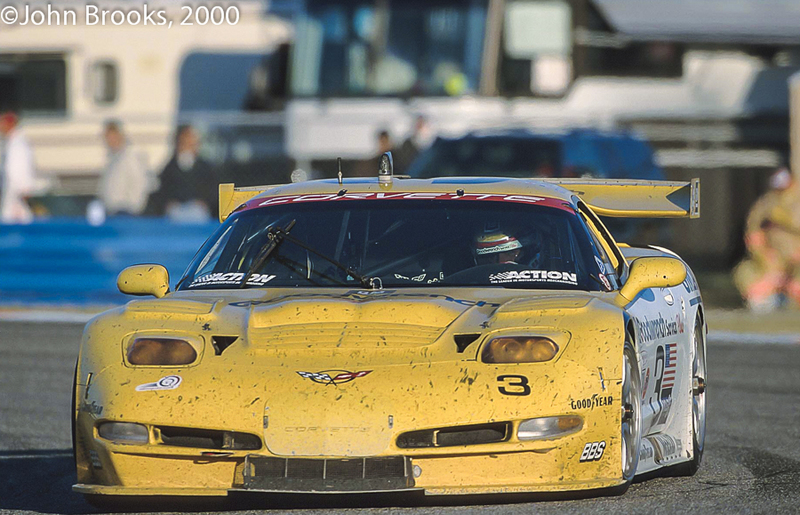 This entry was posted in Nostalgia, Notes from the Cellar and tagged A. J. Foyt, Al Holbert, Al Unser Jr., Al Unser Sr., All American Racing, Bill Elliott, Bob Earl, Bob Tullius, Bob Wollek, Bruce Leven, Brun Motorsport, Chevrolet Corvette GTP-T710, Chip Robinson, Danny Sullivan, Darin Brassfield, Darrell Waltrip, David Hobbs, Daytona 24 Hours, Derek Bell, Doc Bundy, Don Bell, Gianfranco Brancatelli, Greg Pickett, Hurley Haywood, Jaguar XJR-7, Jeff Kline, Jim Busby, Jochen Mass, John Morton, Klaus Ludwig, Lyn St. James, Massimo Sigala, Momo Moretti, Oscar Larrauri, Porsche 962, Price Cobb, Protofab Chevrolet Camaro, Rob Dyson, Roush Ford Mustang, Sarel van der Merwe, Scott Pruett, Spice-Pontiac Fiero, Terry Labonte, Tom Gloy, Vern Schuppan, Whitney Ganz, Zakspeed Ford Probe GTP on January 28, 2017 by John Brooks. 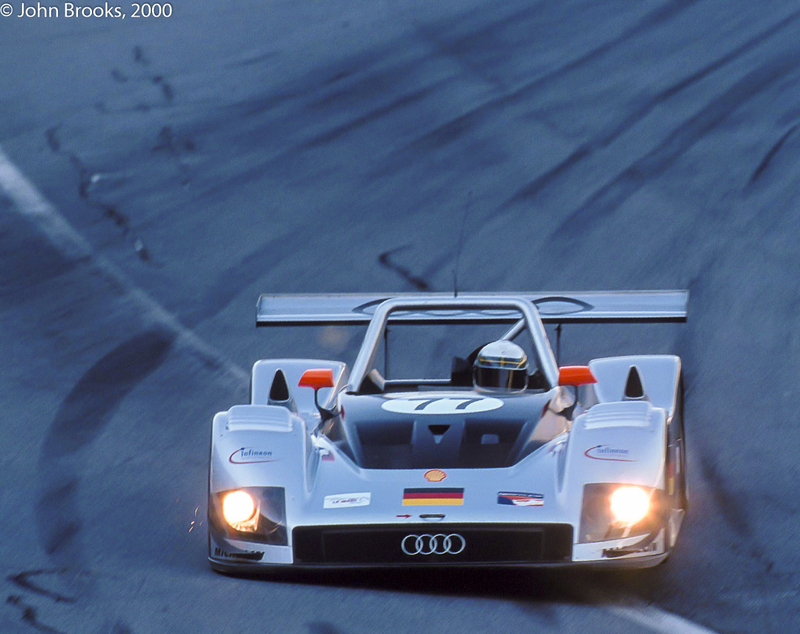 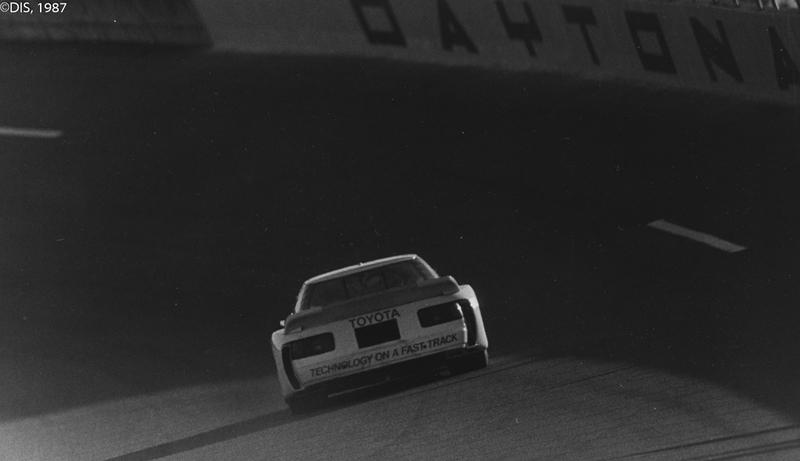 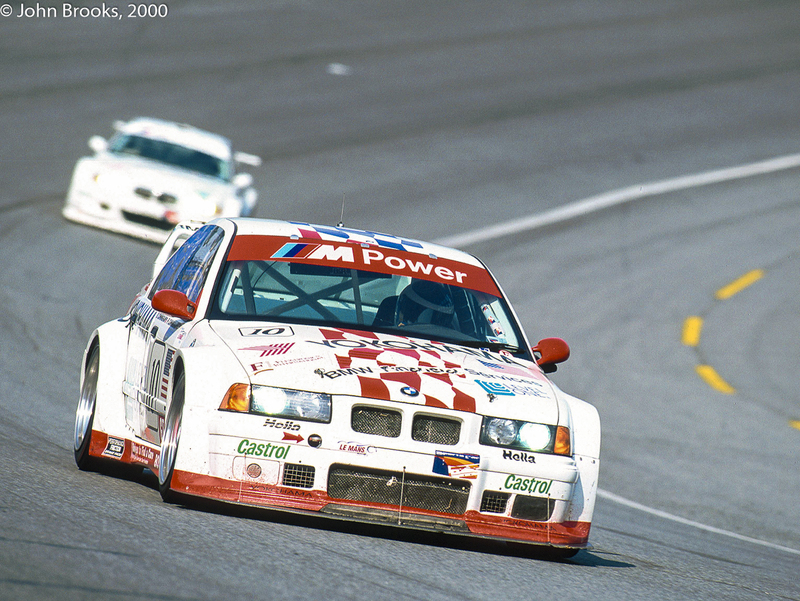 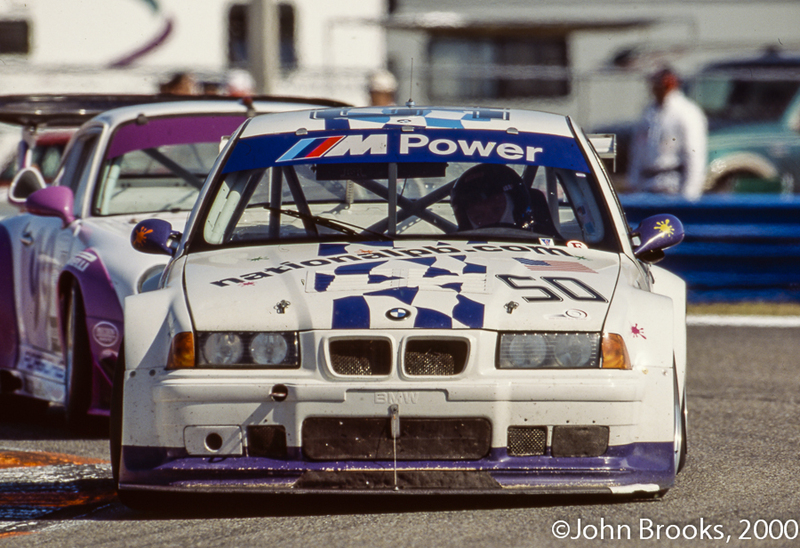 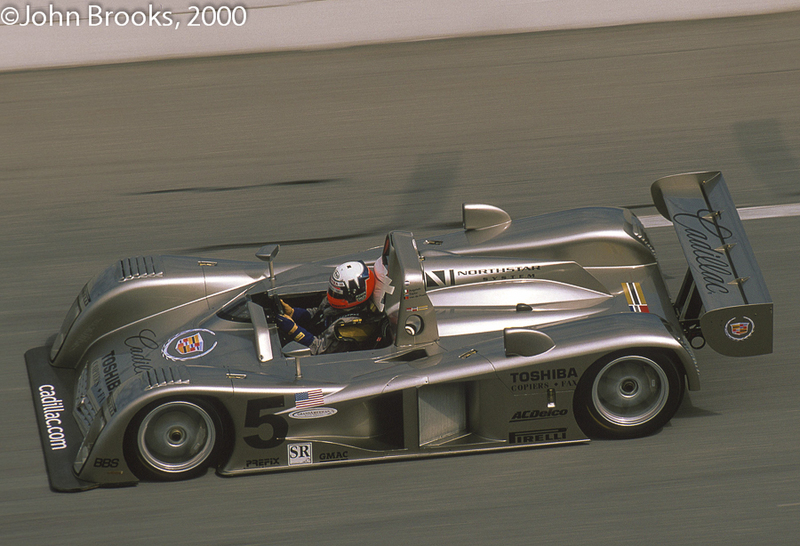 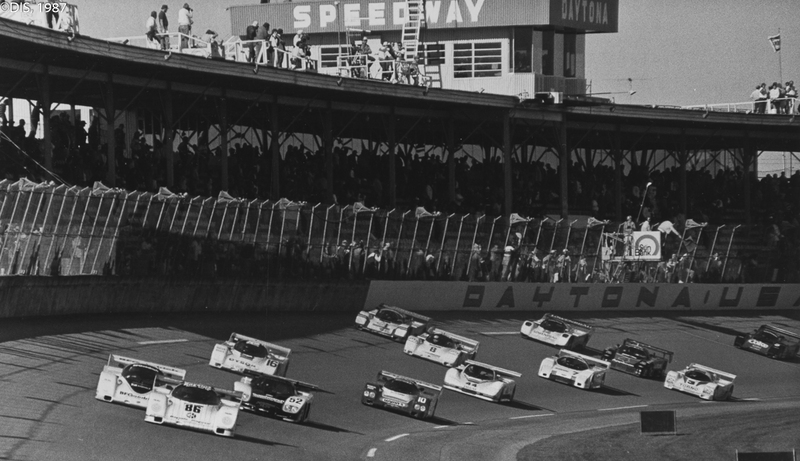 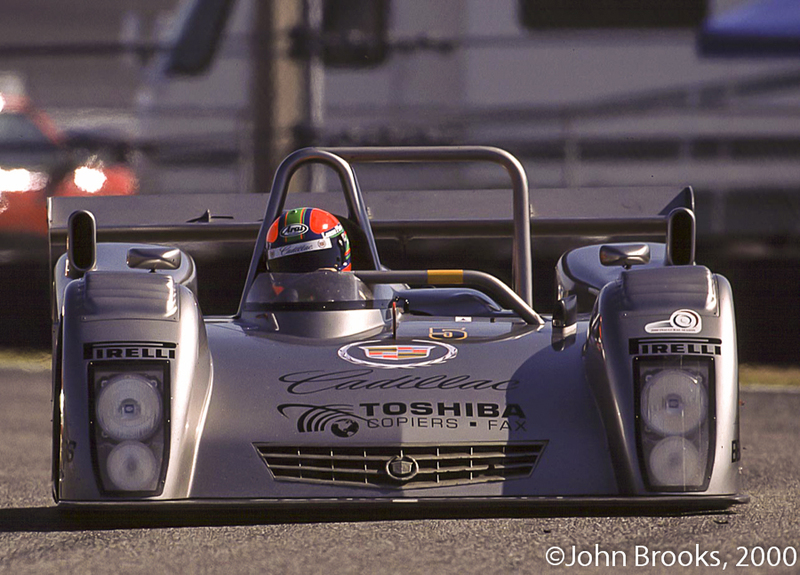 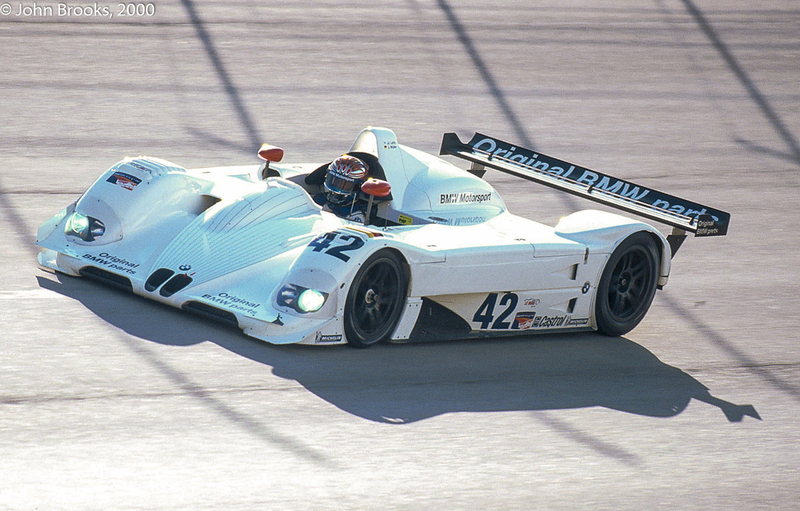 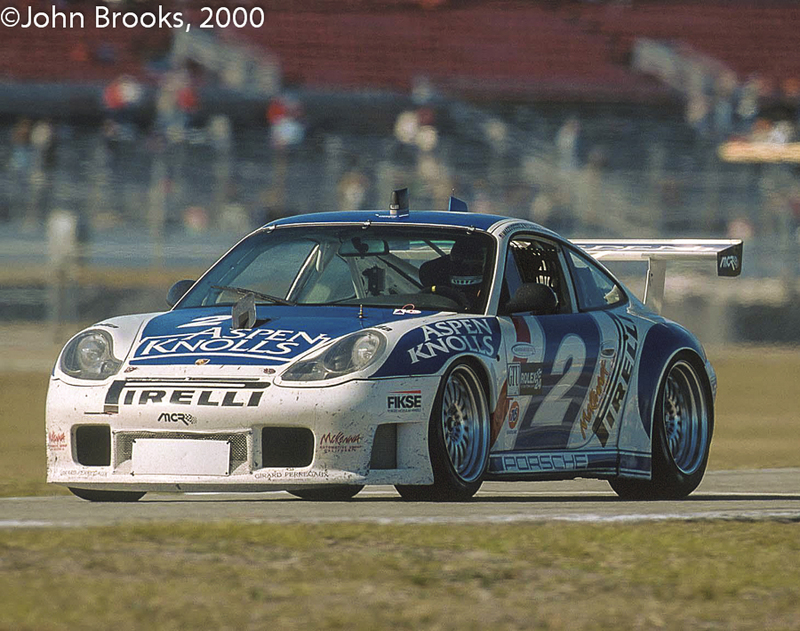 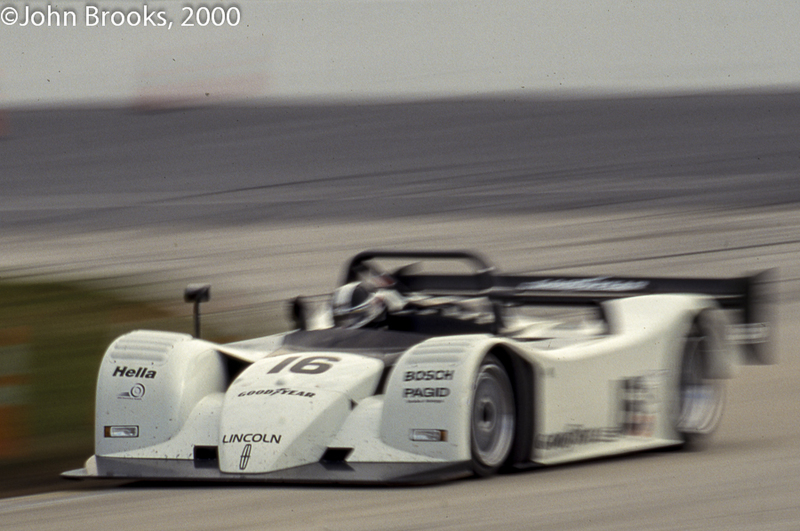 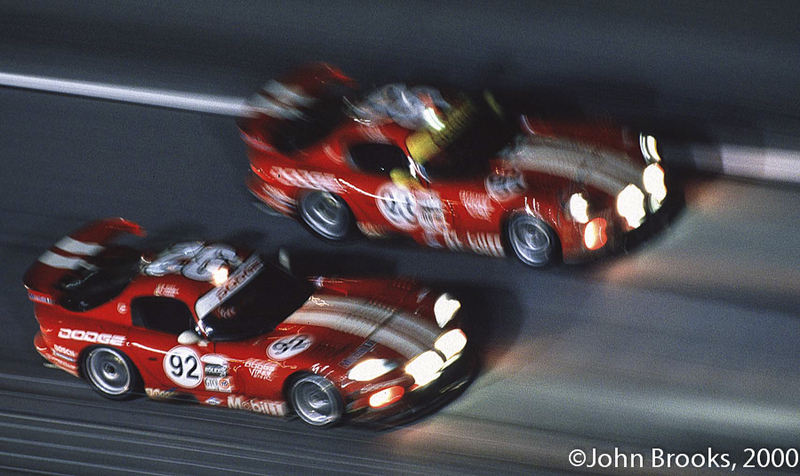 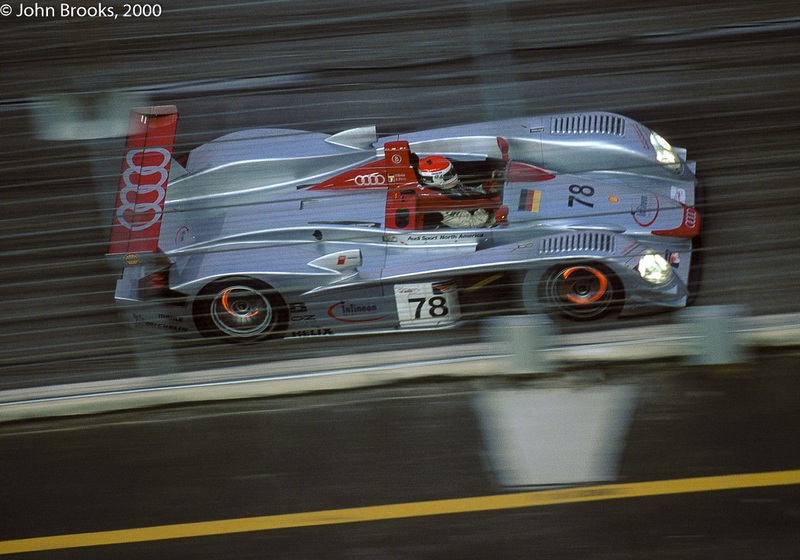 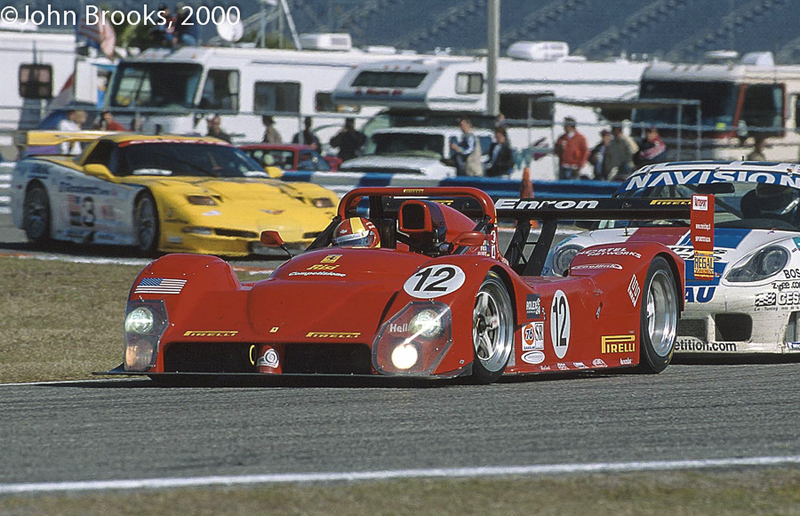 The 1986 SunBank 24 at Daytona was forecast to be the race where the old order in IMSA would be toppled. 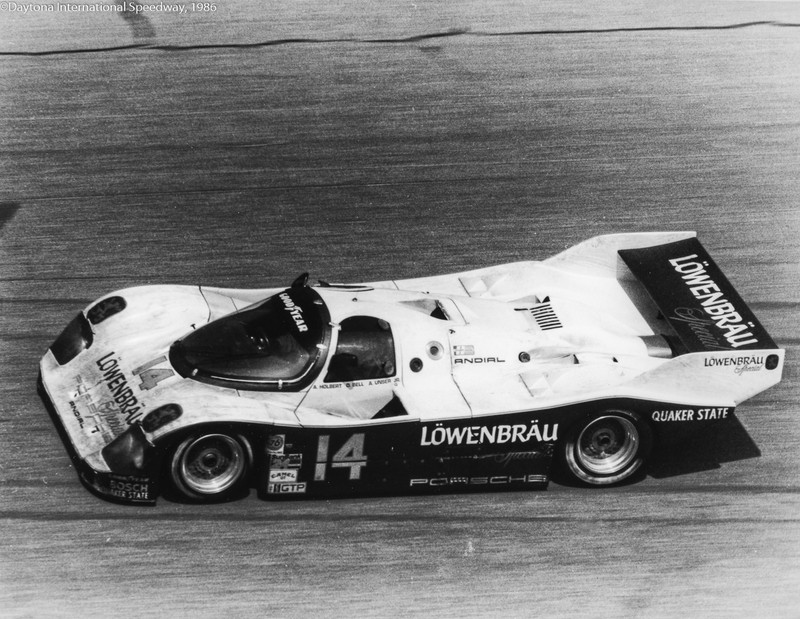 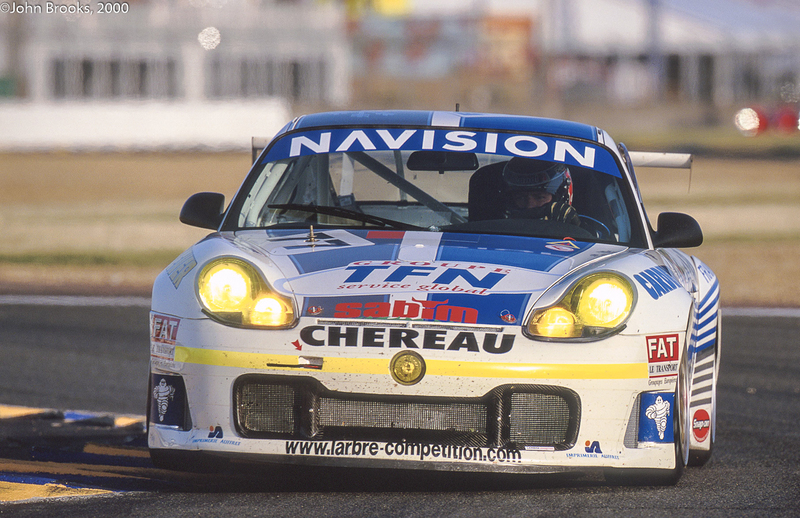 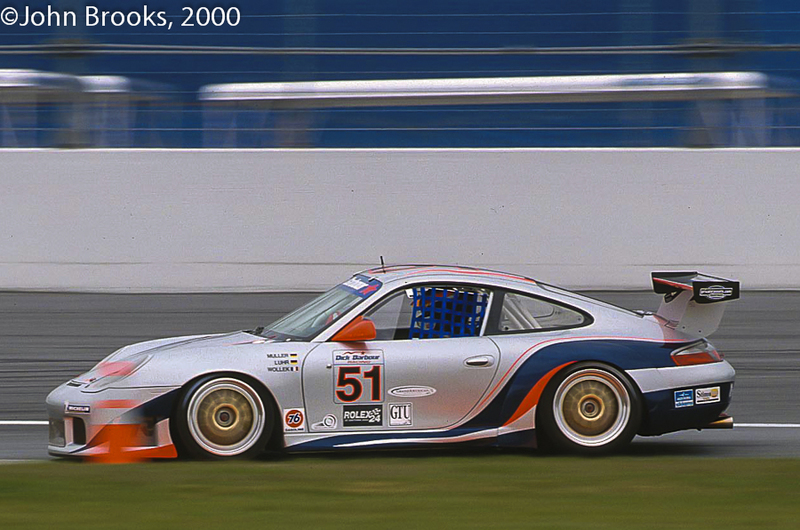 The old order was in the form of Porsche who had won eight out of the previous nine editions of the Floridian endurance classic. 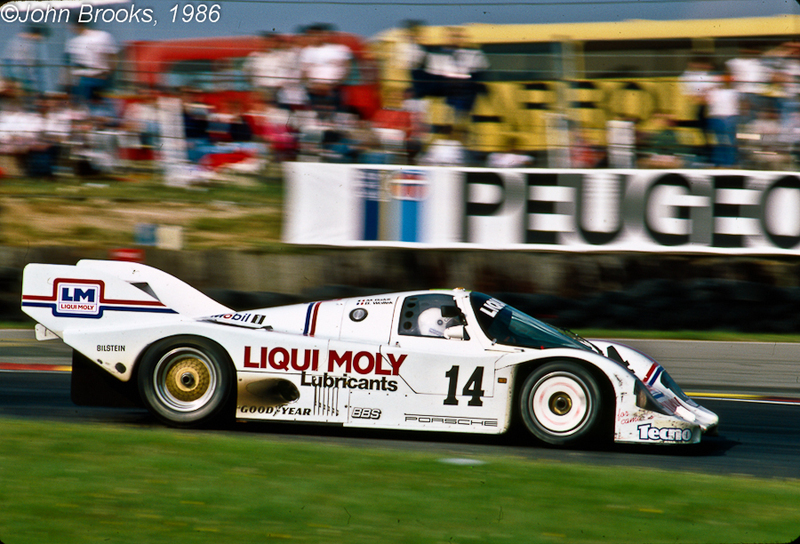 Even the March chassis that took honours in 1984 was Porsche-powered, quite a record. 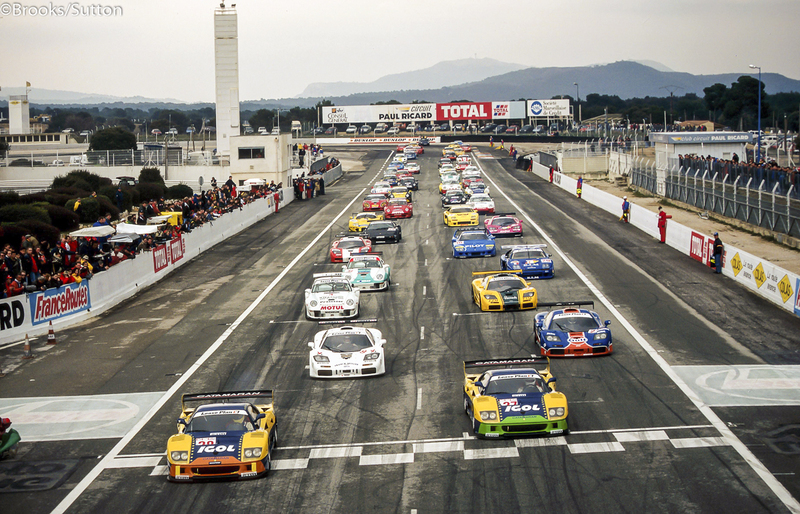 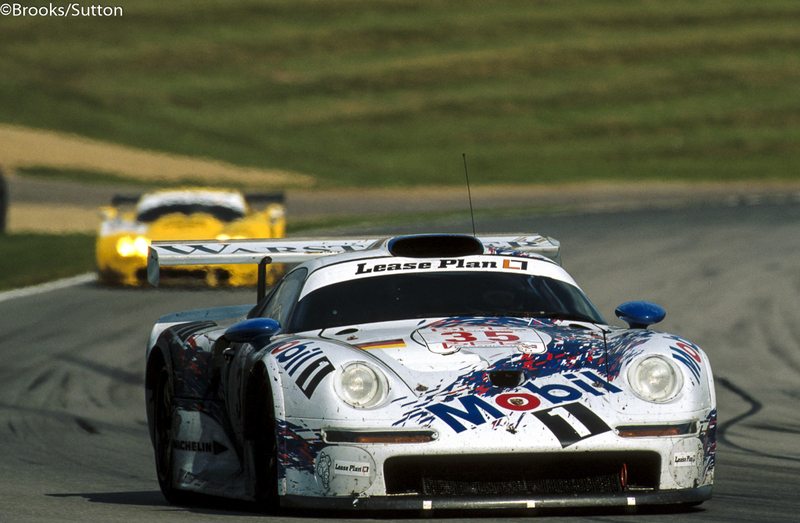 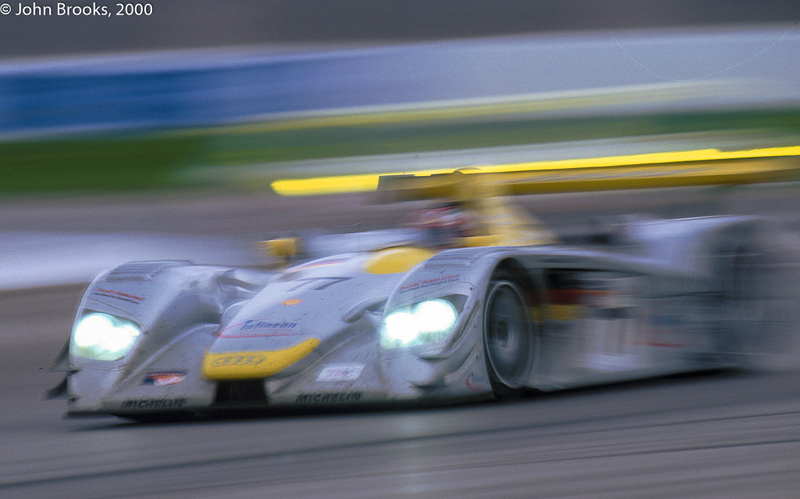 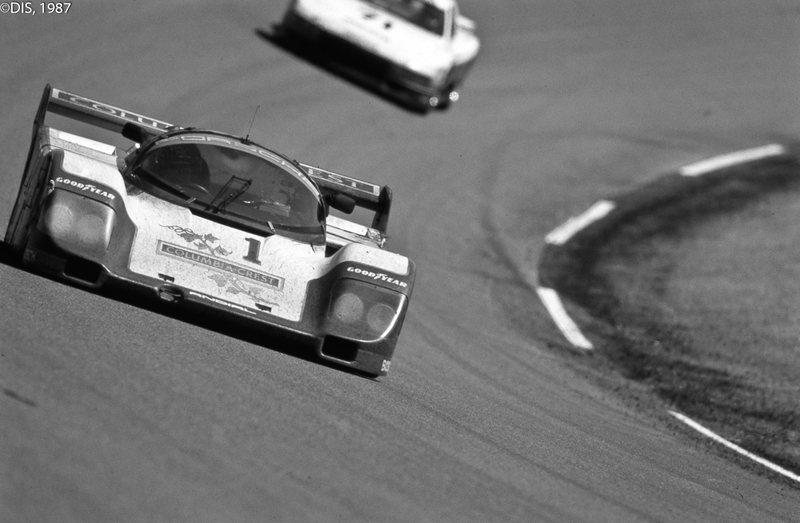 Leading the charge of Weissach’s finest were no less than nine Porsche 962s. 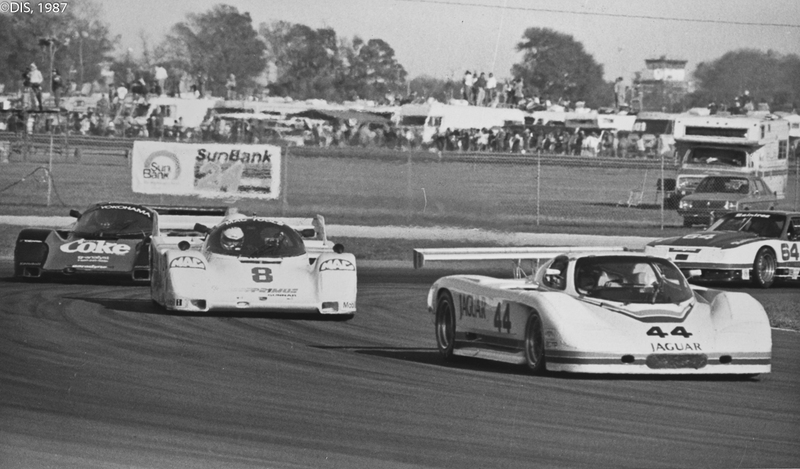 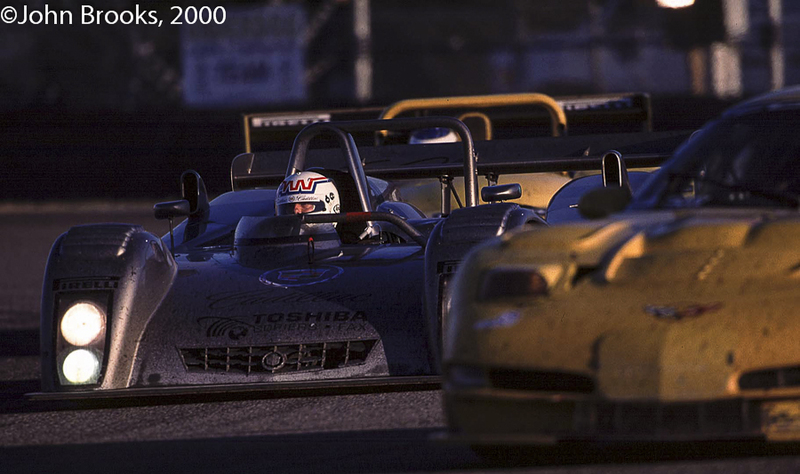 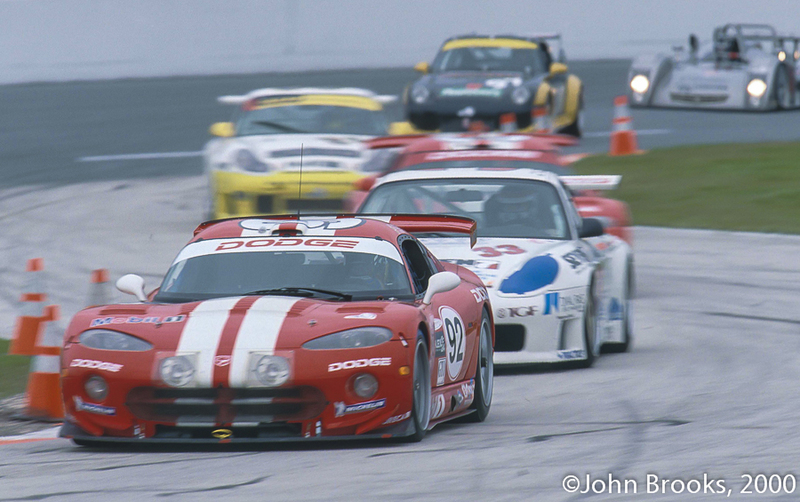 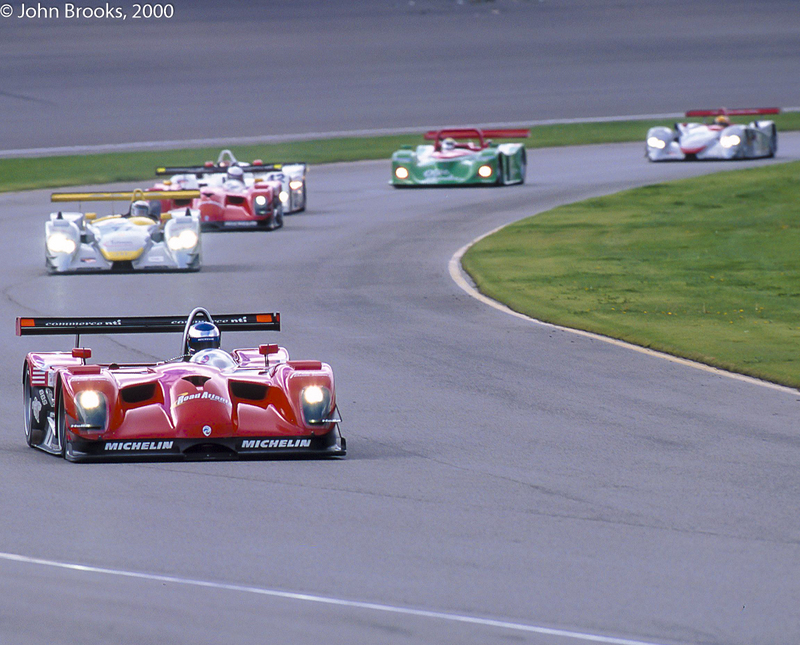 IMSA’s regulars dominated this pack with Jim Busby bringing two BF Goodrich sponsored examples, this was supported by singleton efforts entered by Al Holbert, Preston Henn, Bruce Leven, Rob Dyson and Bob Akin. 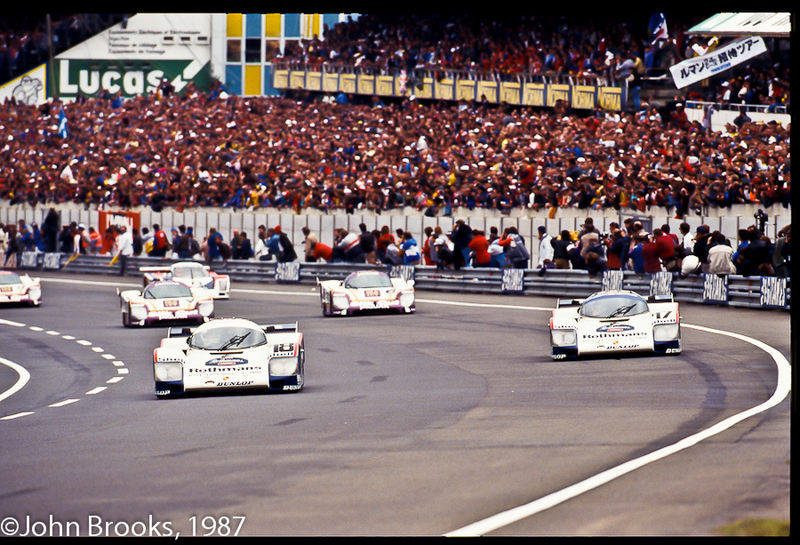 Europe’s honour was to be upheld by further 962s from Walter Brun and Reinhold Joest, a truly top quality selection of Porsche teams. 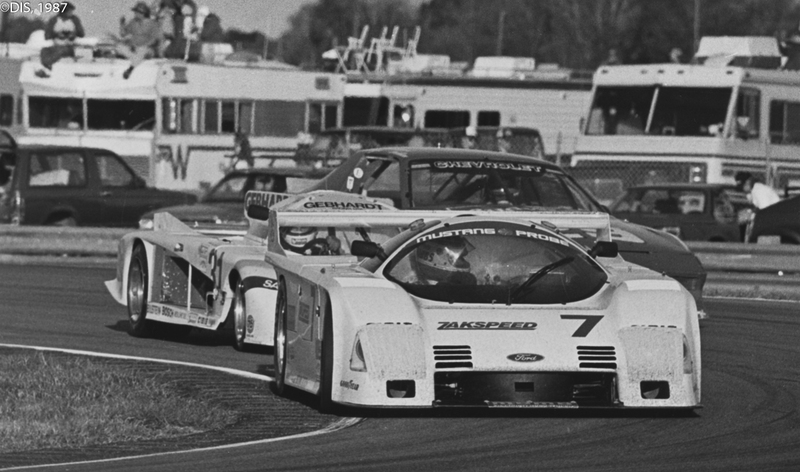 The pretenders to the endurance crown were factory-backed efforts from BMW and Chevrolet, with the Group 44 Jaguars also in contention, so a serious bunch to combat Stuttgart. 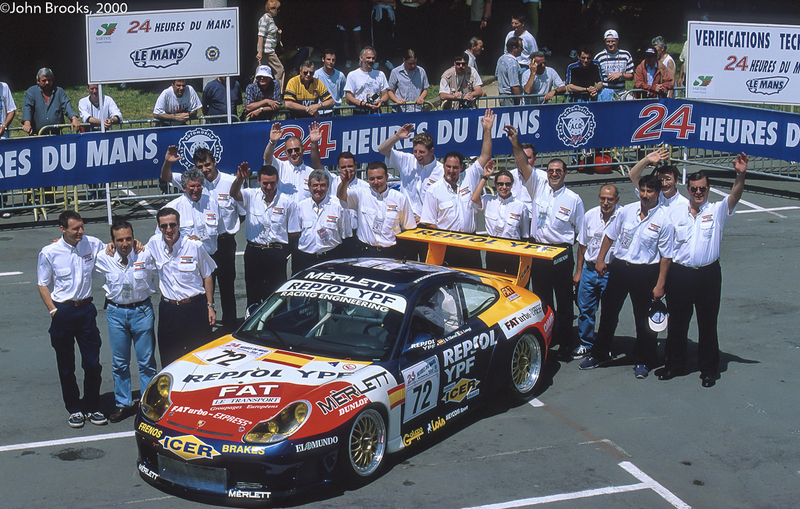 However the threat to Porsche’s hegemony had melted away even before the cars lined up on their way to the Green Flag and the start of the race. 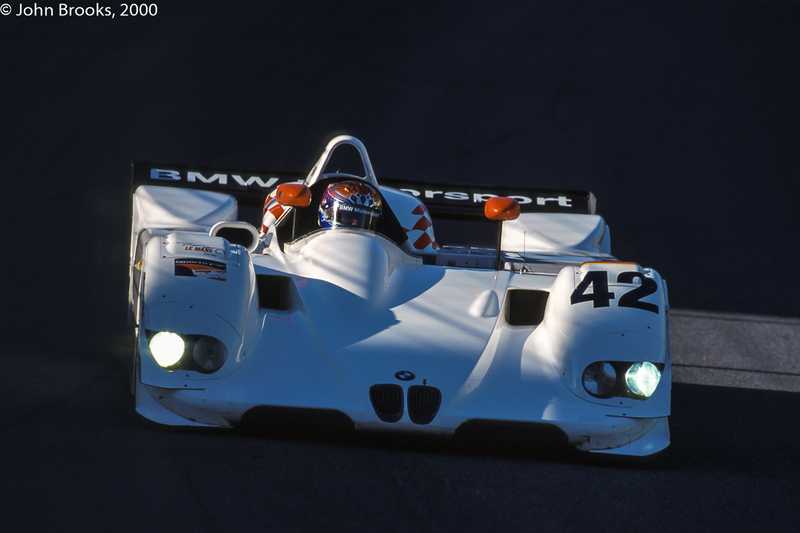 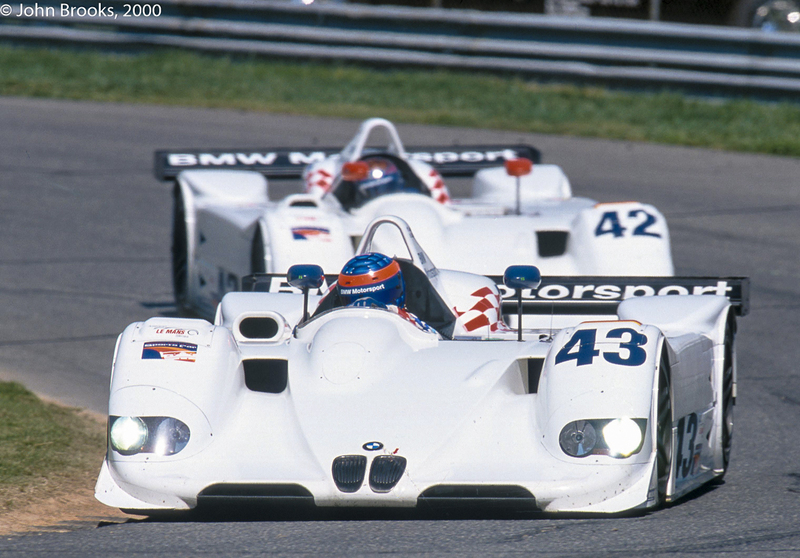 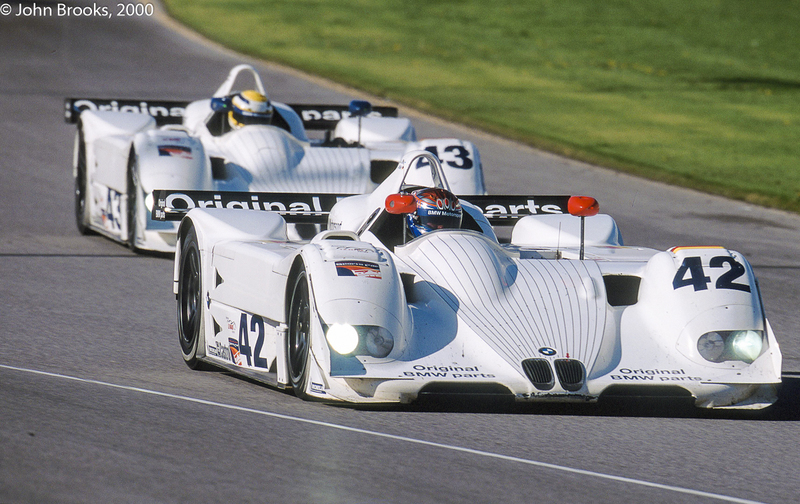 BMW tested at Road Atlanta the week before the race and one of their GTP prototypes was consumed by fire while on track and, as the cause was not clear, it was considered prudent to withdraw the second car. 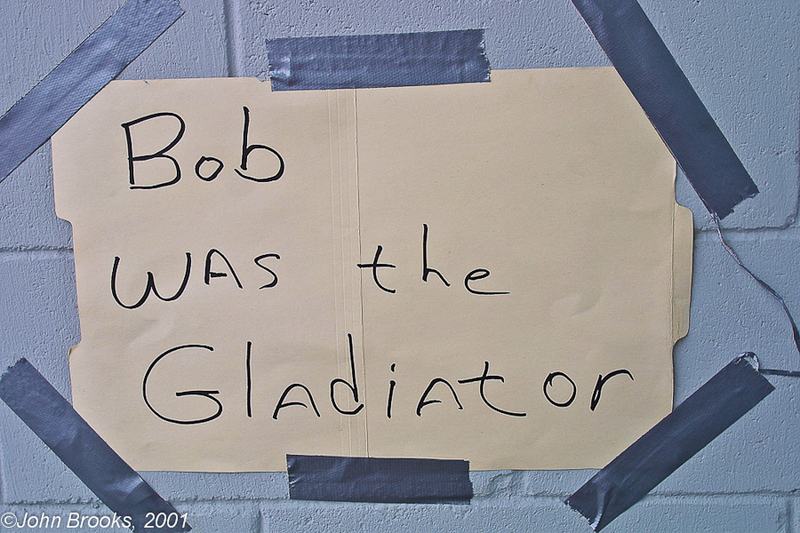 One down. 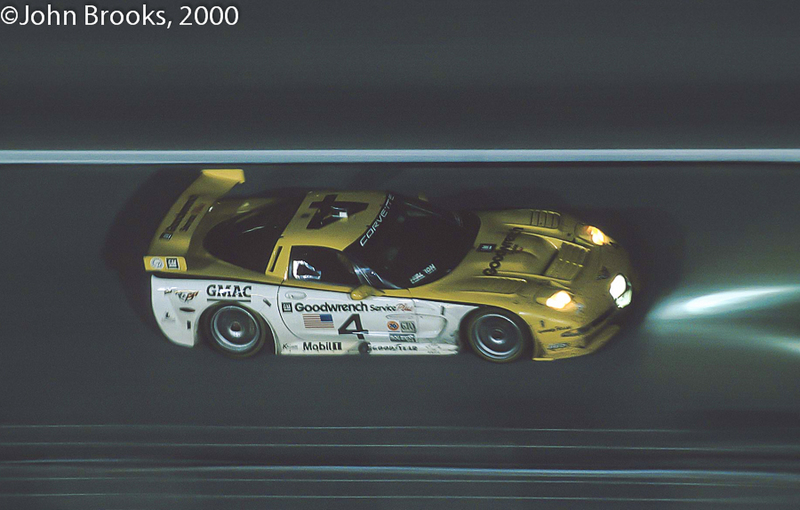 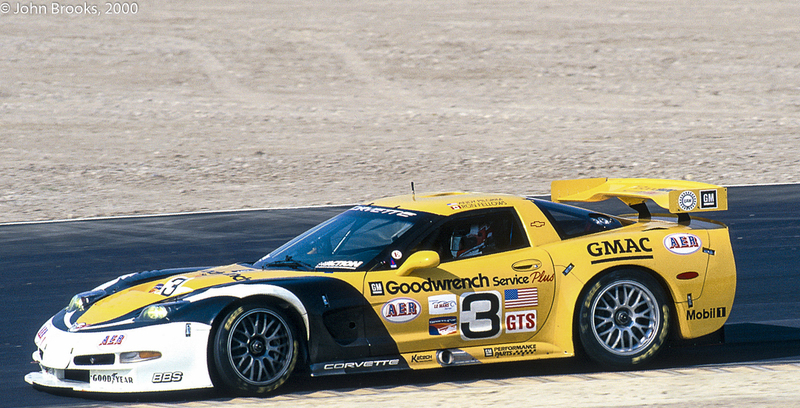 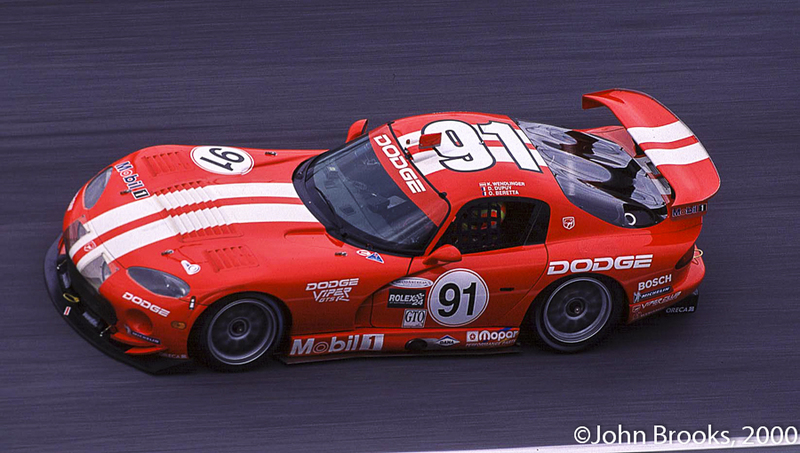 The other significant threat to Porsche’s supremacy was in the shape of the Corvette GTP of NASCAR team owner Rick Hendrick. 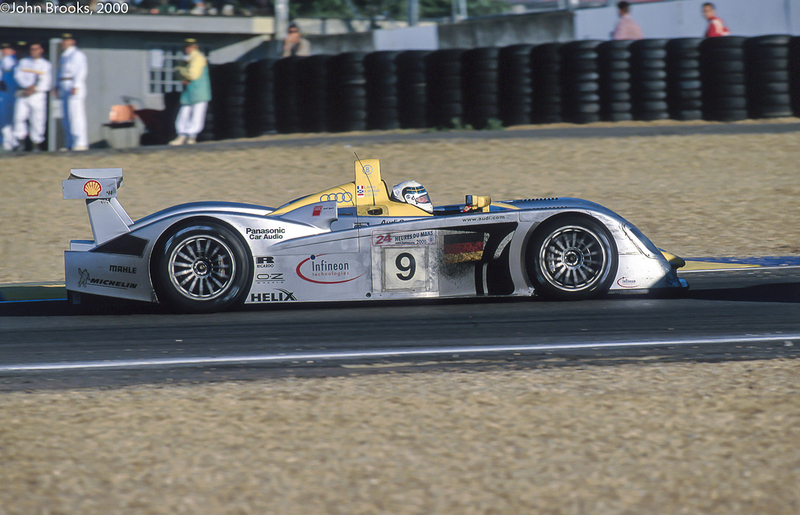 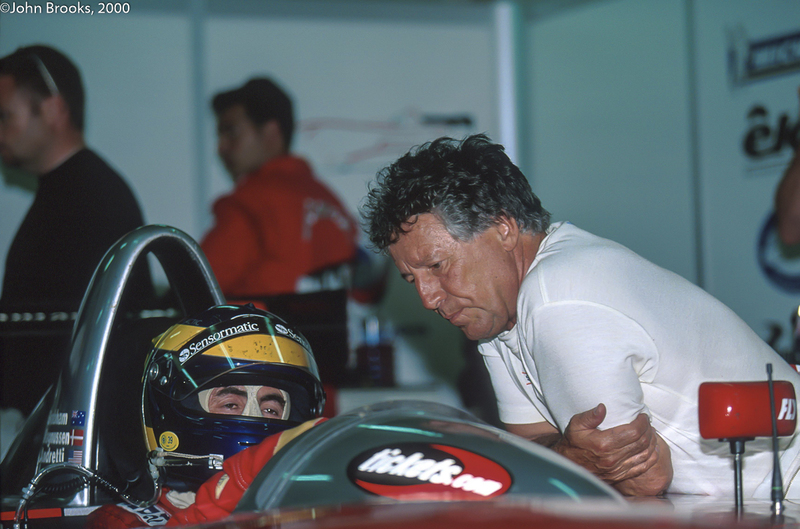 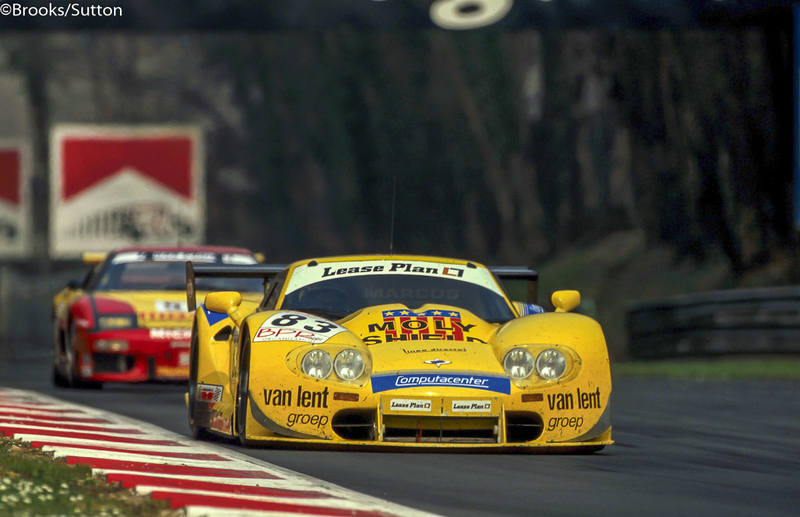 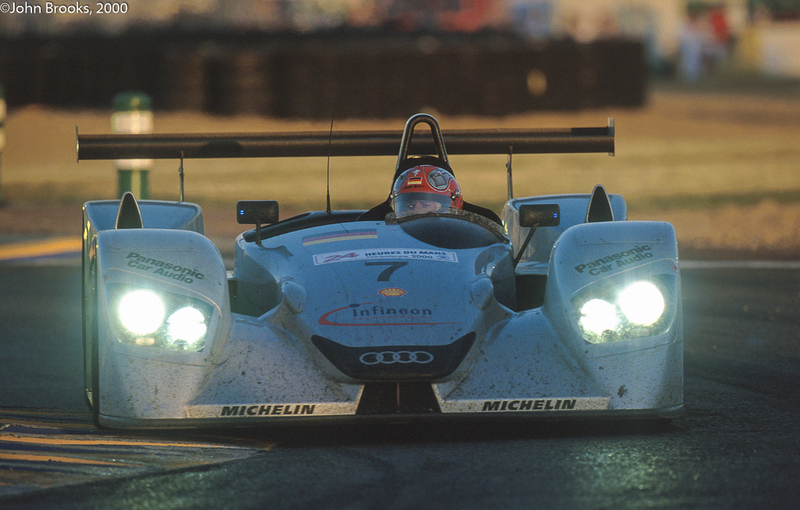 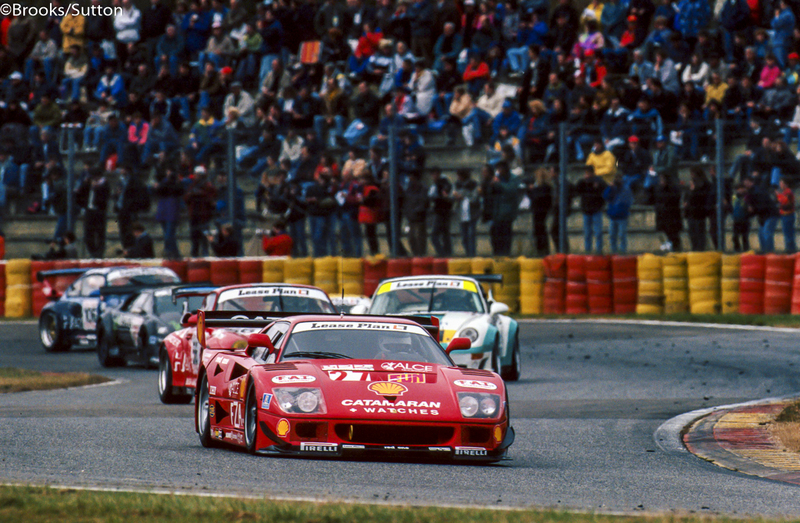 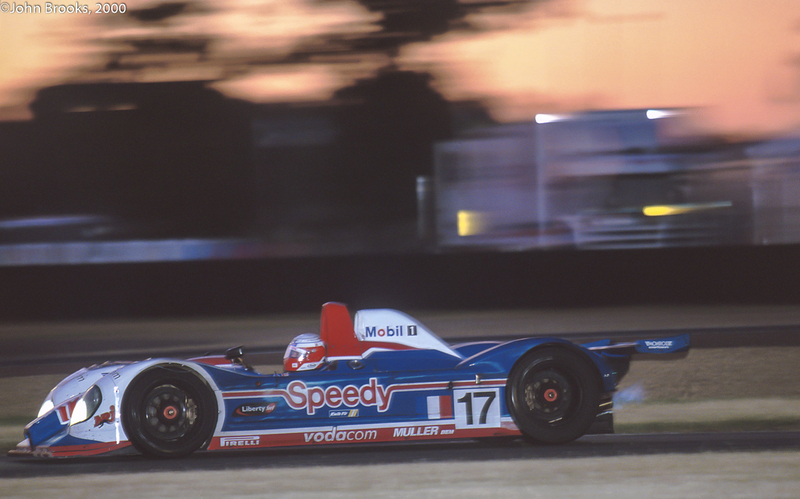 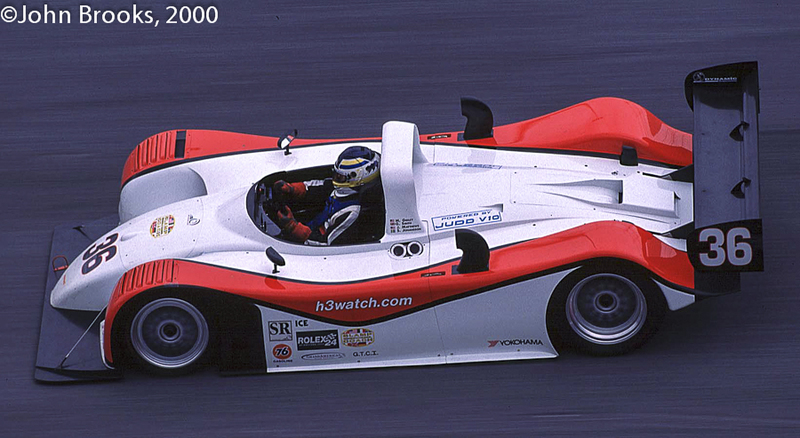 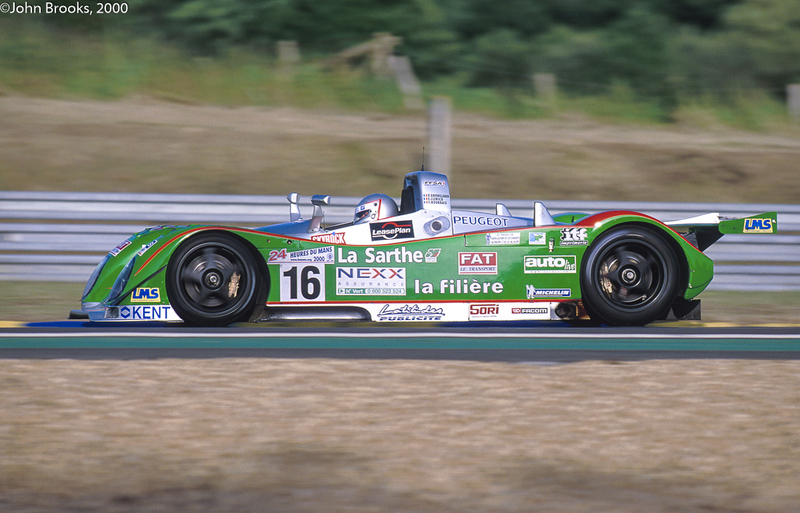 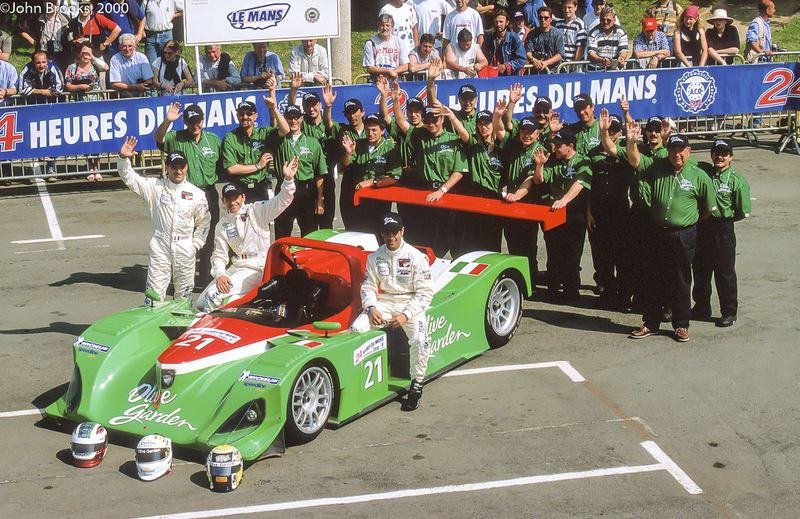 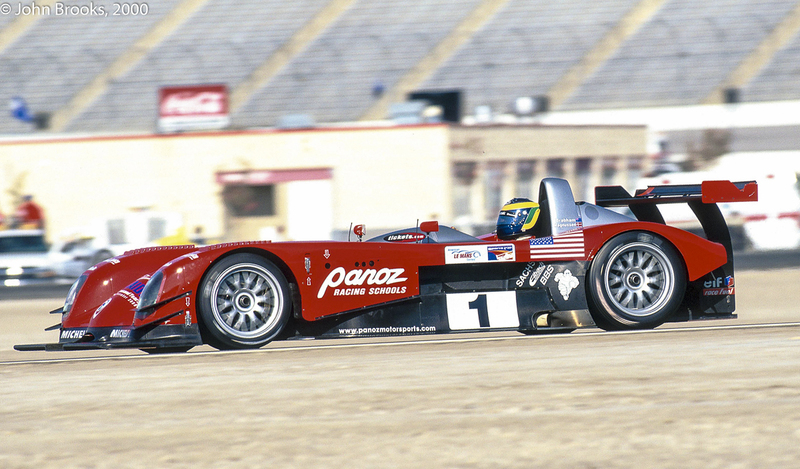 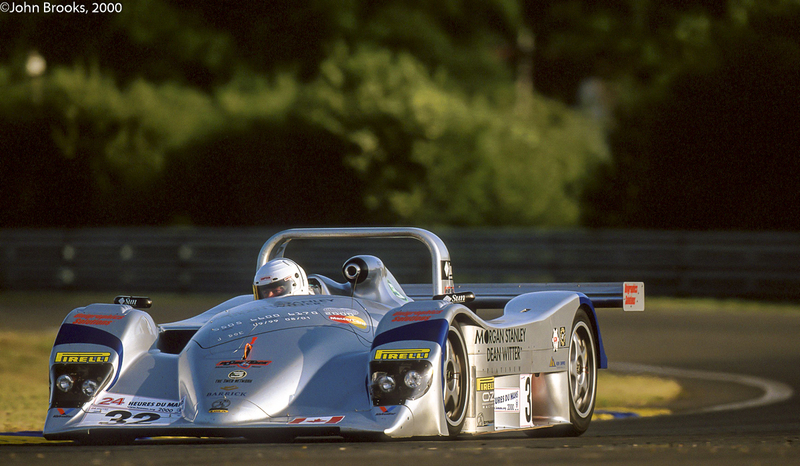 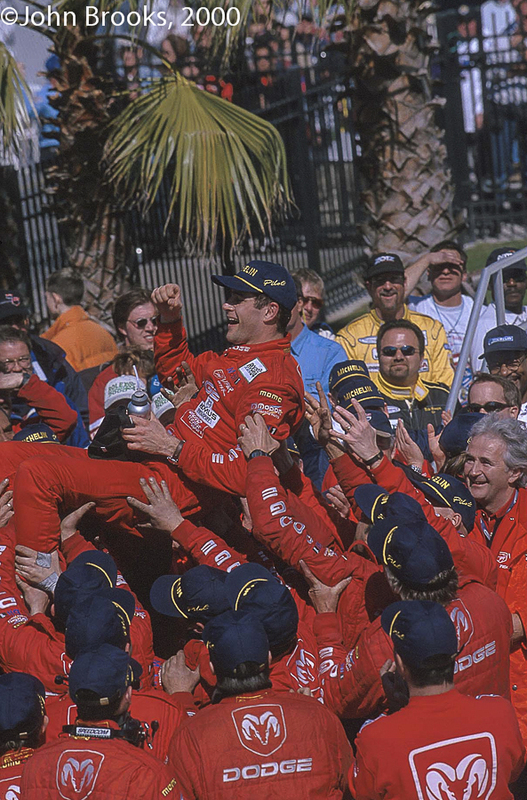 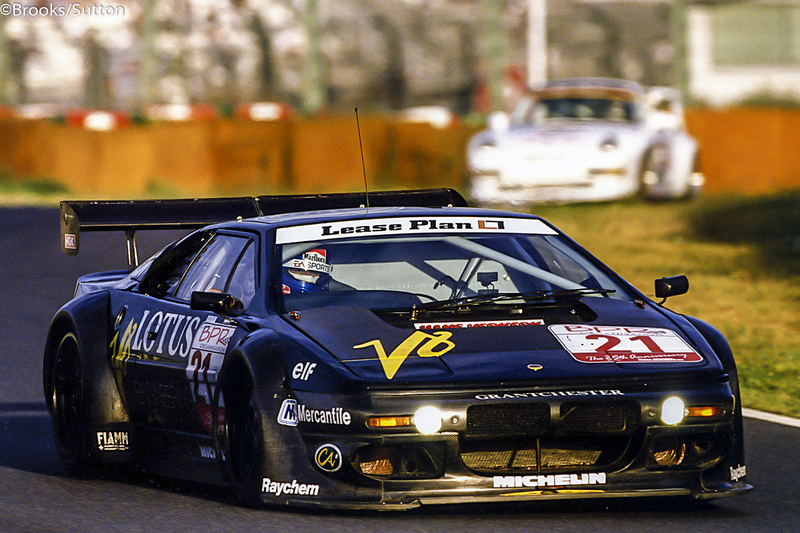 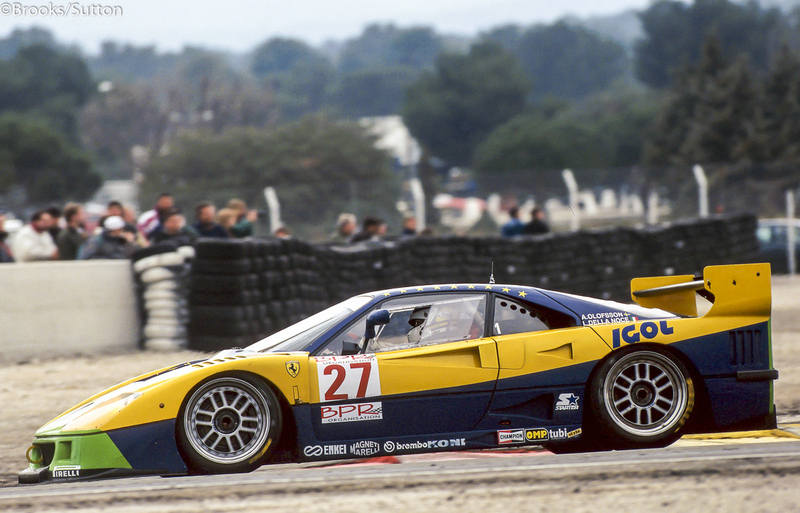 The potential of the turbocharged V-6 powered car was evident as Sarel van der Merwe stuck it on pole position. 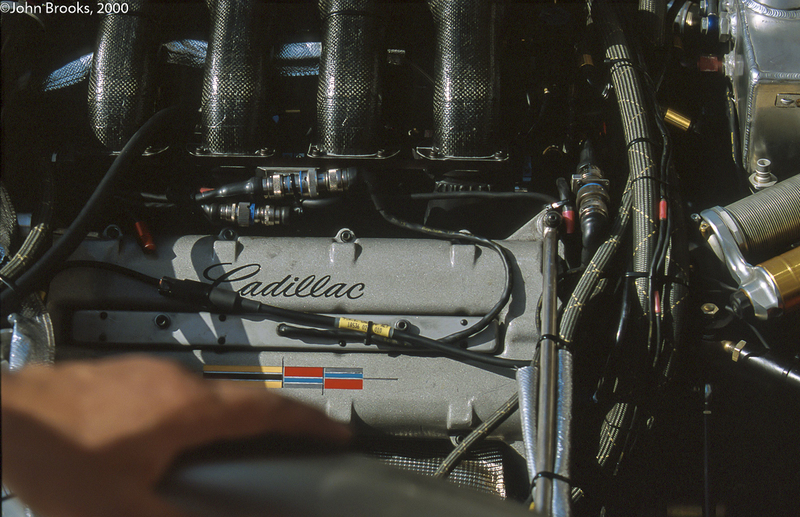 However after an engine change a vibration was noticed in the morning warm-up. 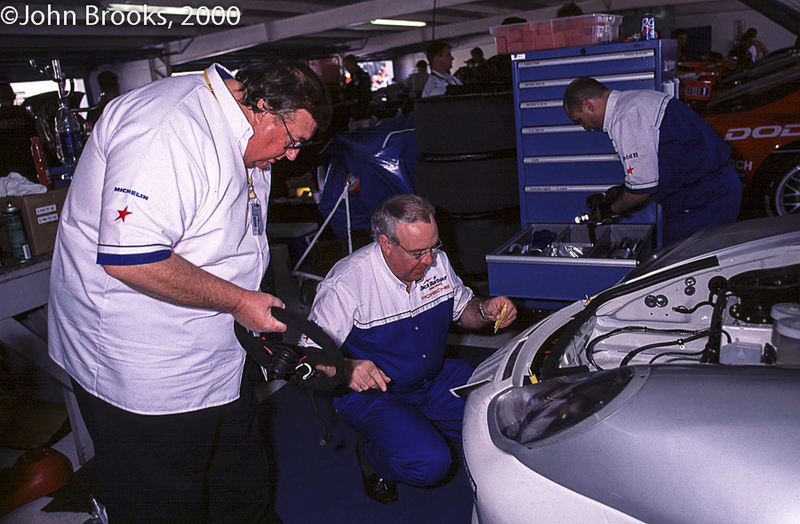 When this was investigated the cause was found to be a cracked engine block and there was insufficient time to change the unit. 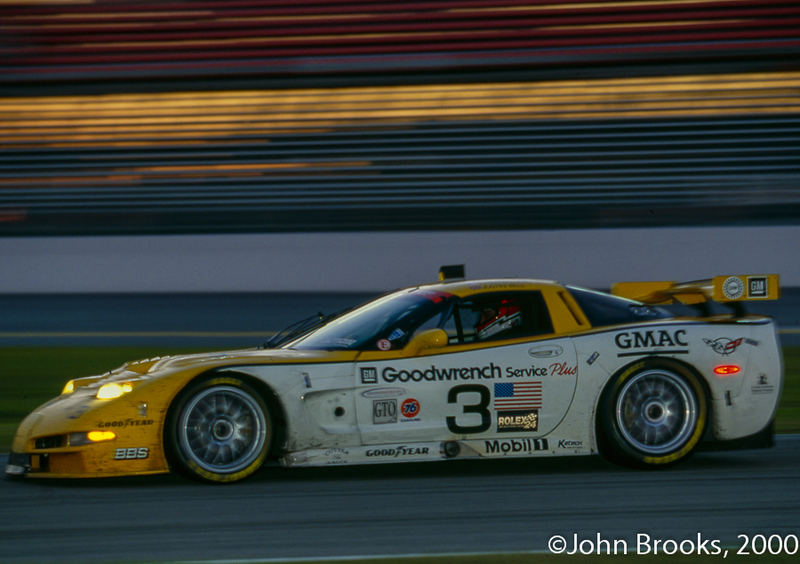 Scratch two! 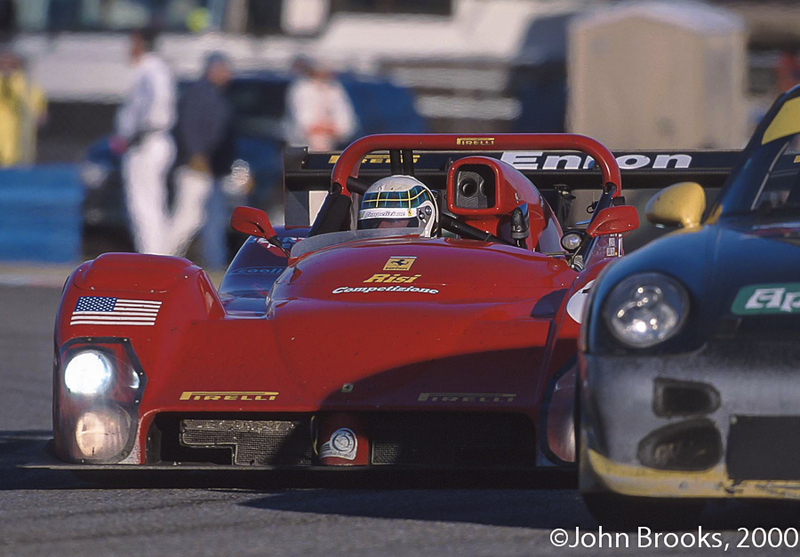 So it was Bob Wollek who led the pack on the formation lap in Bruce Leven’s Bayside Disposal Racing 962 with Price Cobb and Paolo Barilla itching to pass the veteran French racer. 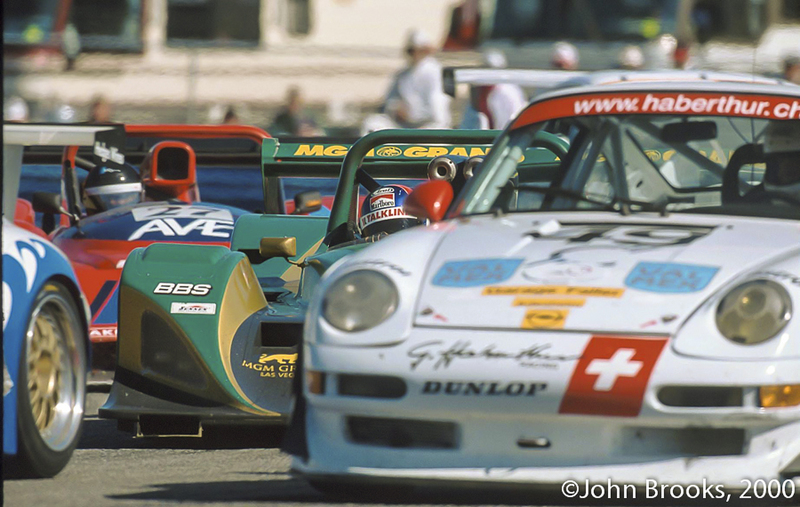 The Group 44 Jaguars were the new XJR-7 cars, a complete update of the XJR-5 and probably lacking sufficient mileage to seriously threaten the 962 gang for the top step of the podium. 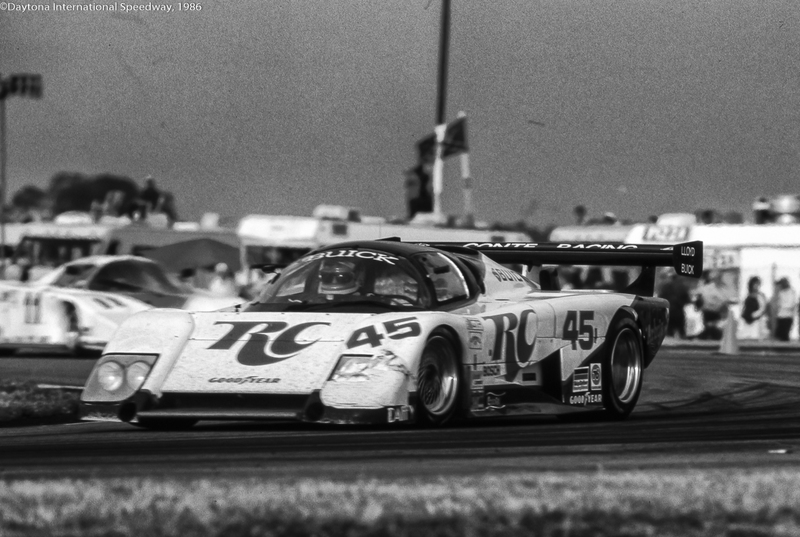 Team owner Bob Tullius would be partnered by Chip Robinson and Claude Ballot-Léna in #44, while in #04 there was an all-star line up of Brian Redman, Vern Schuppan and Hurley Haywood. 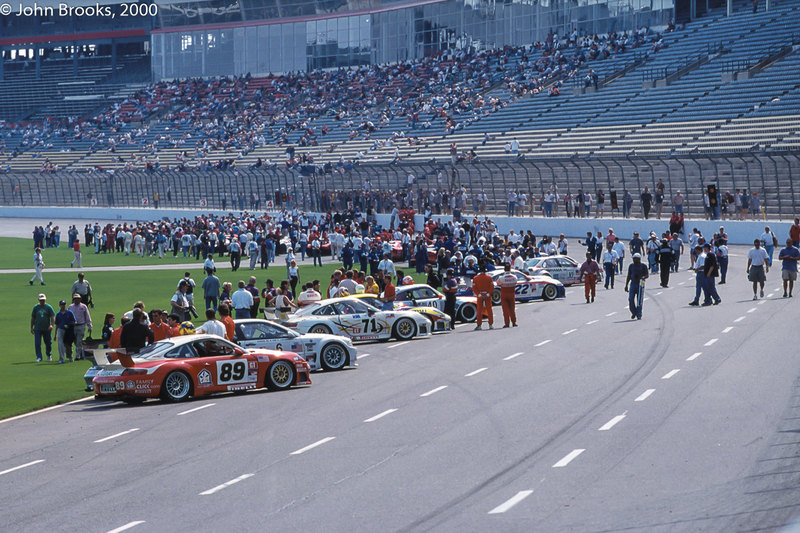 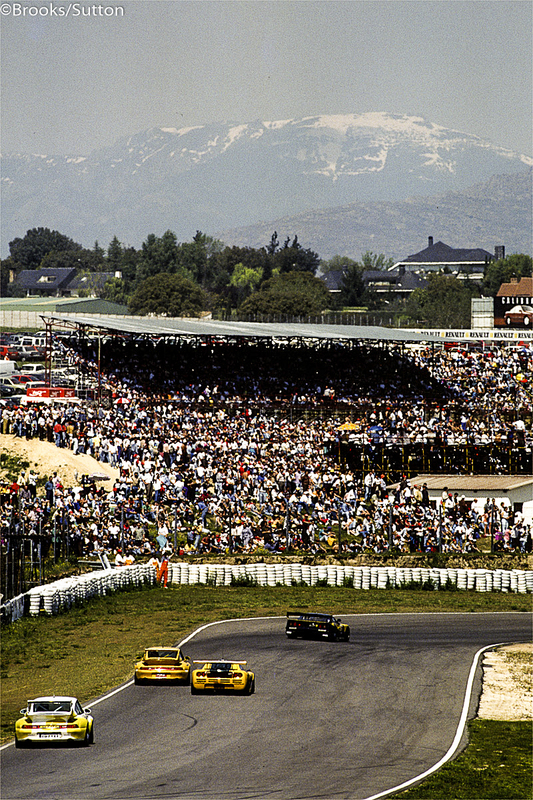 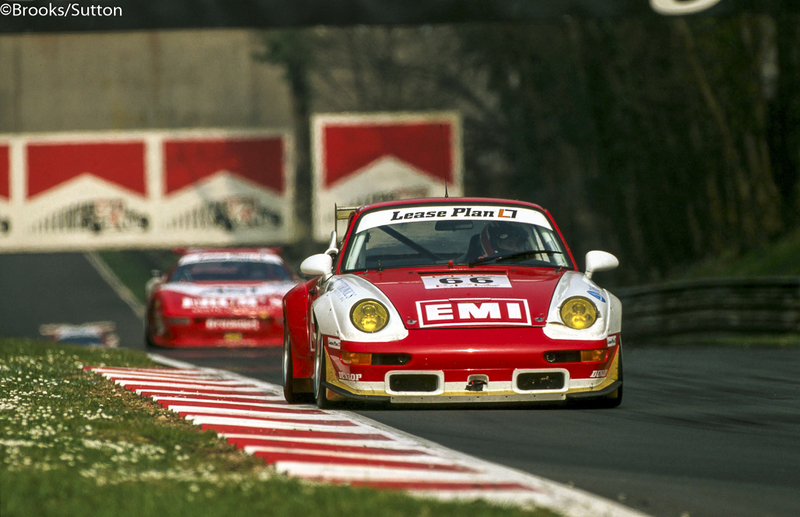 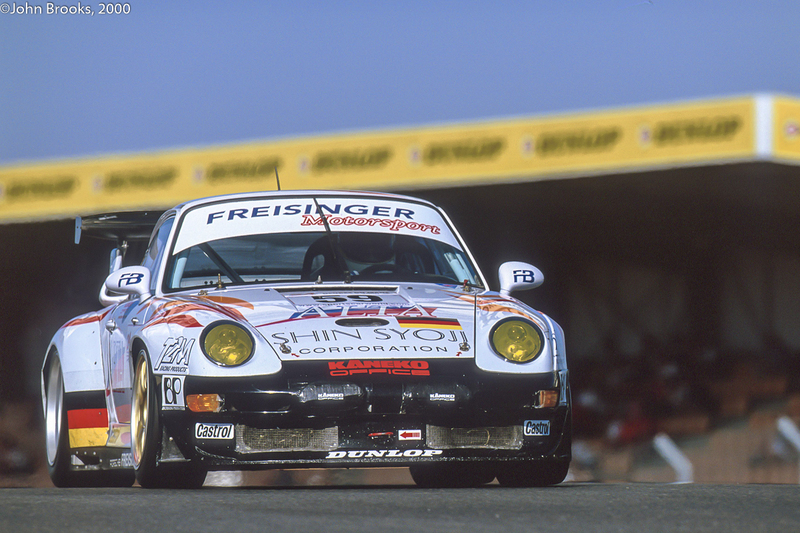 New rules for 1986 also impacted the Porsches and would play a significant part in the race itself. 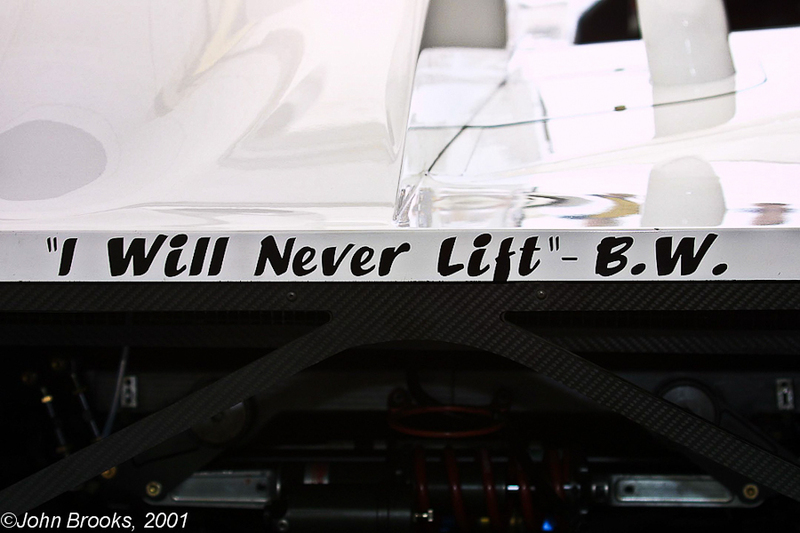 The biggest change was the addition of 160lb of ballast, this would tax the already stretched components. 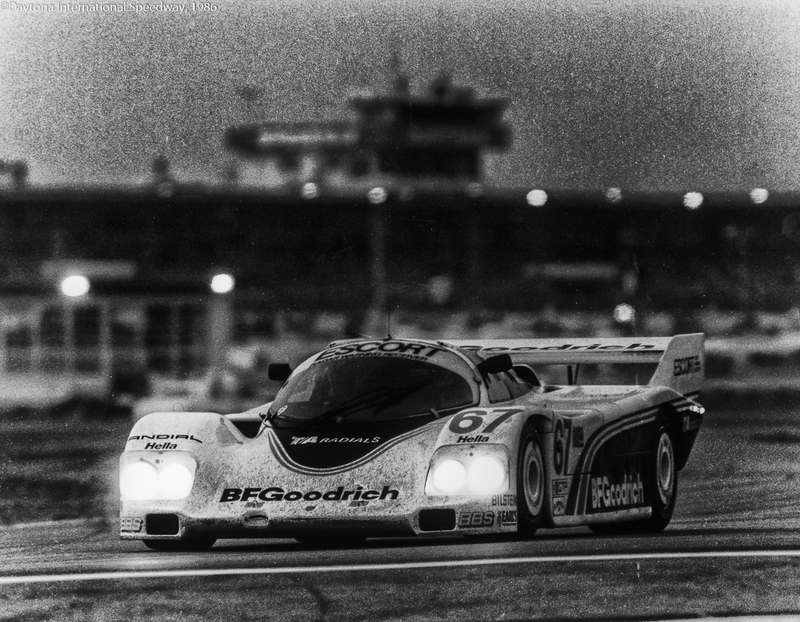 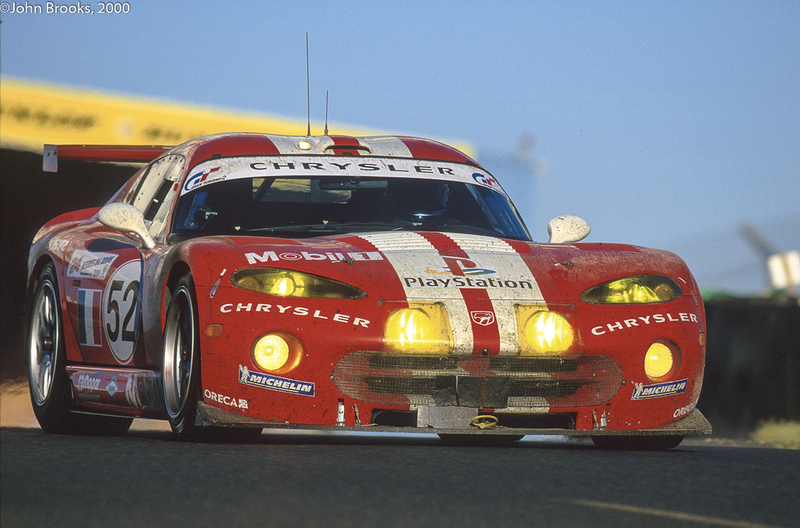 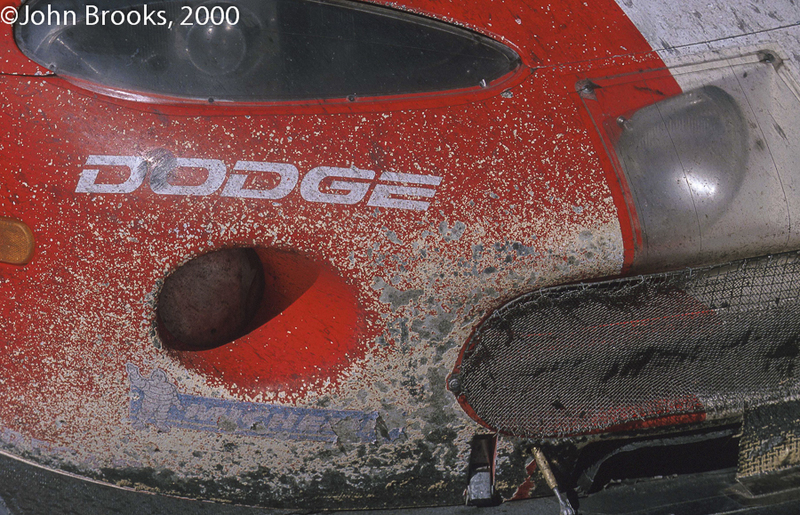 The Daytona 24 Hours has a reputation as a car-killer and even the 962s would suffer. 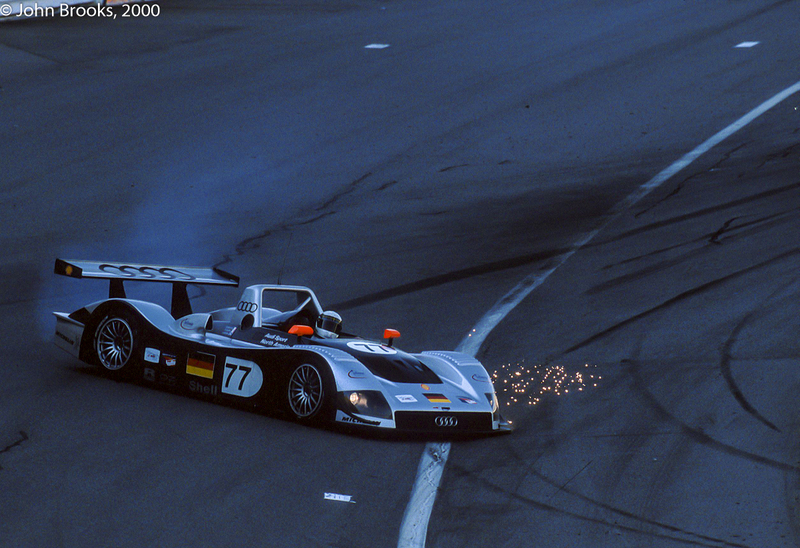 First of the leading contenders to exit the race, after only 6 laps, was the Joest car suffering a broken distributor rotor. 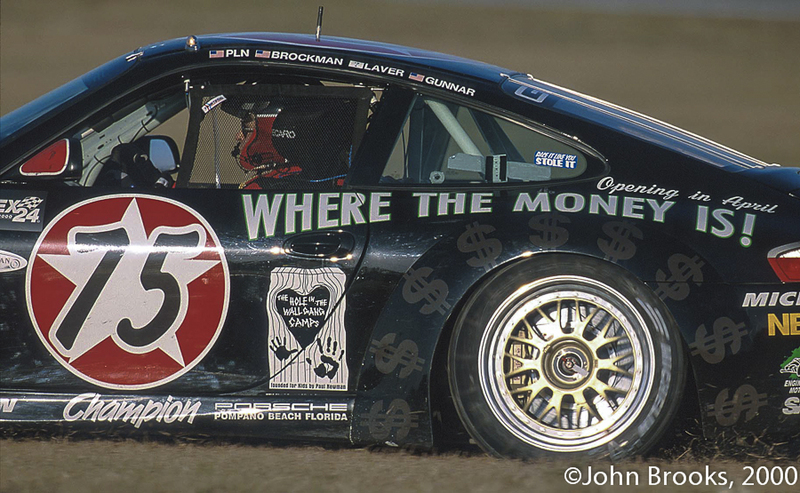 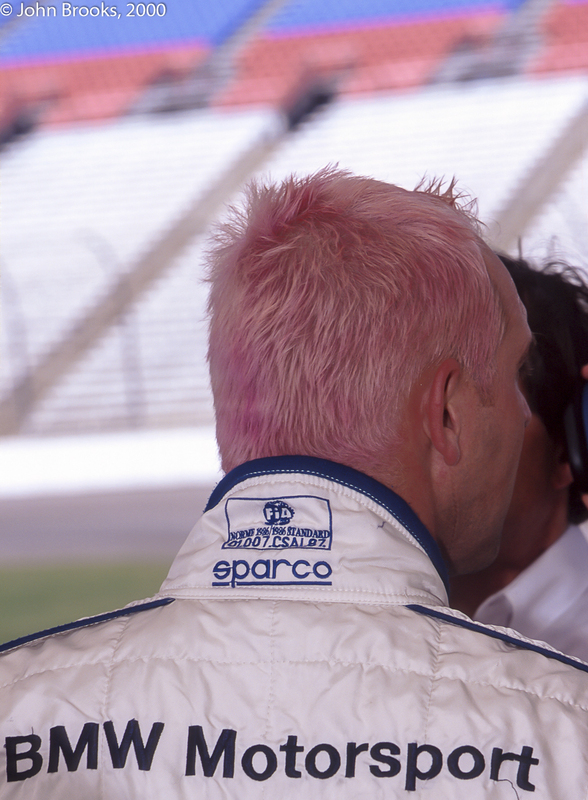 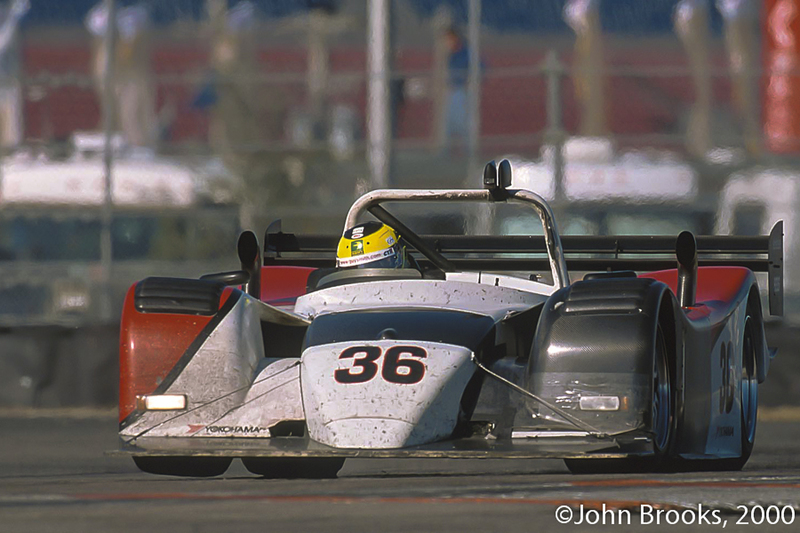 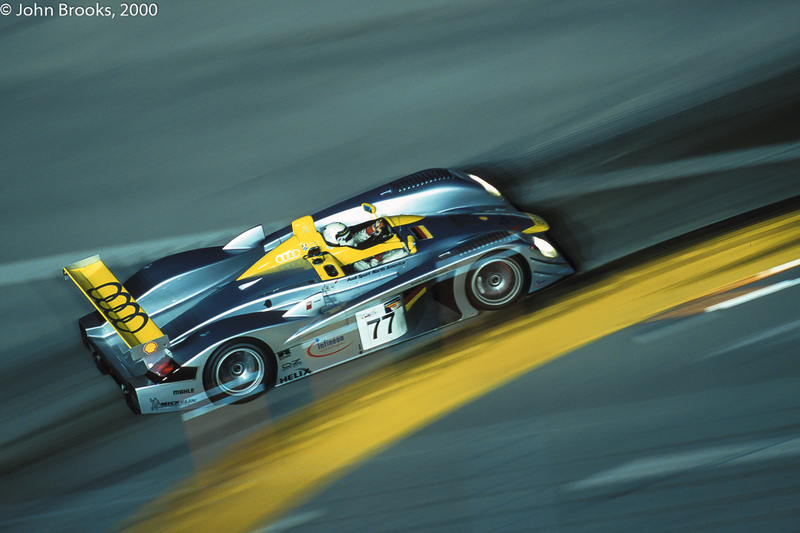 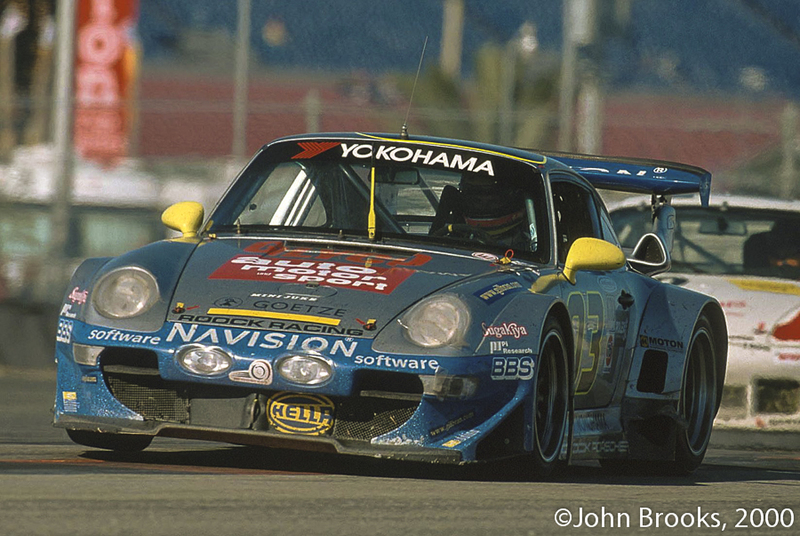 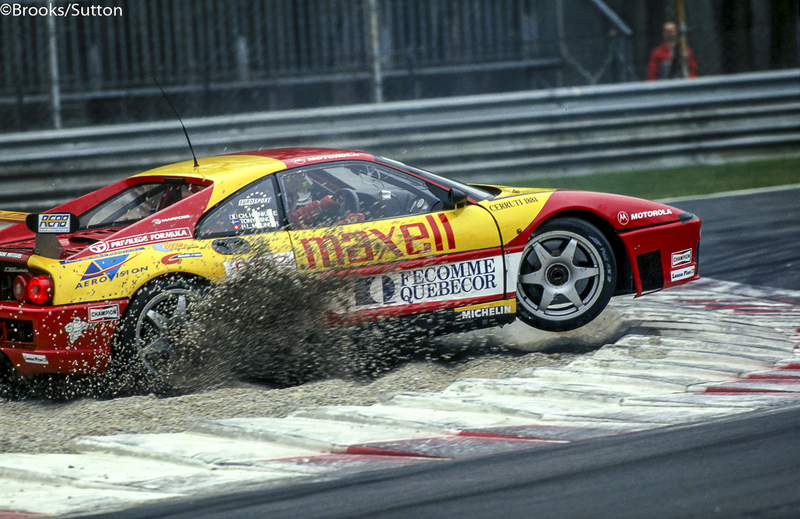 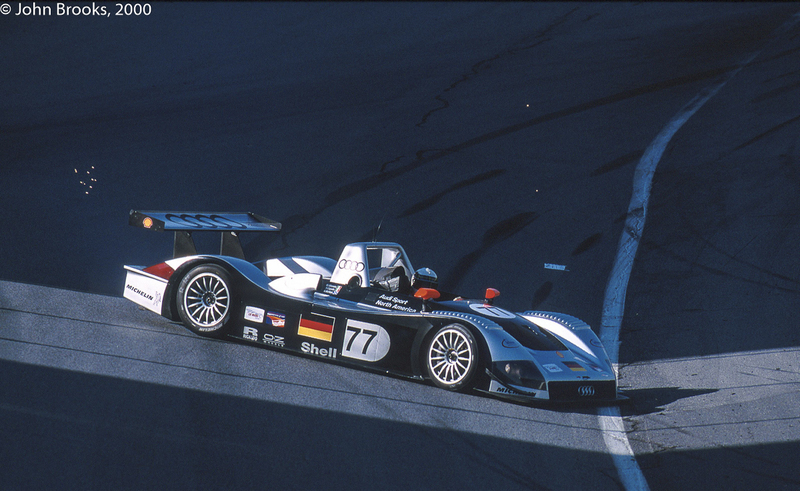 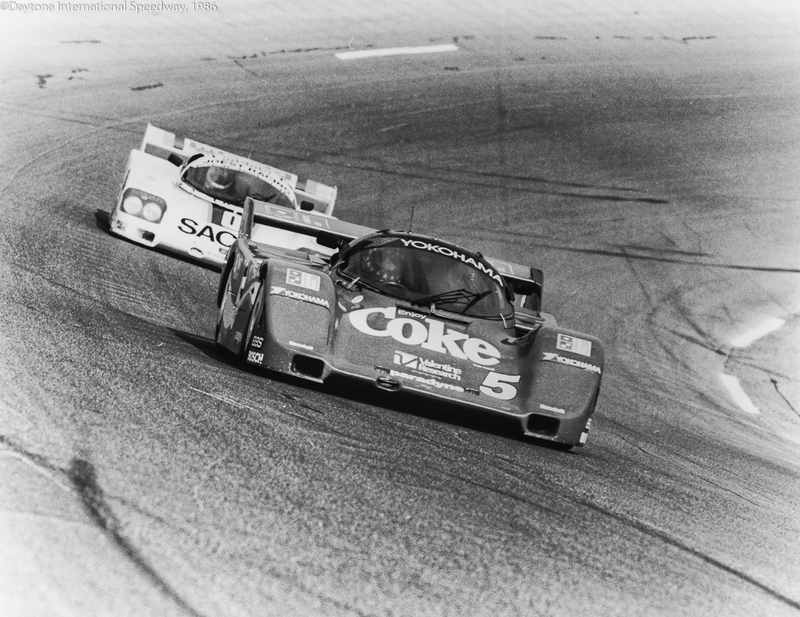 A few laps later Hans Stuck hit the wall in the Coke-sponsored 962, the drink that is, this was after all IMSA. 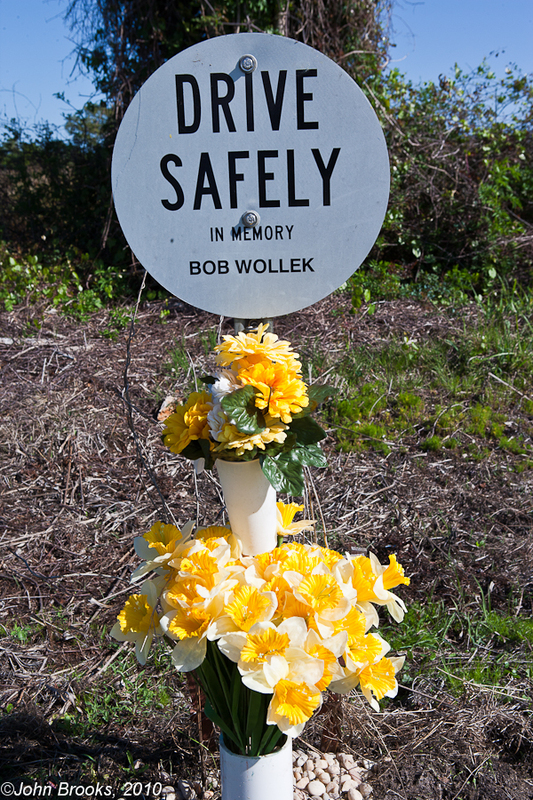 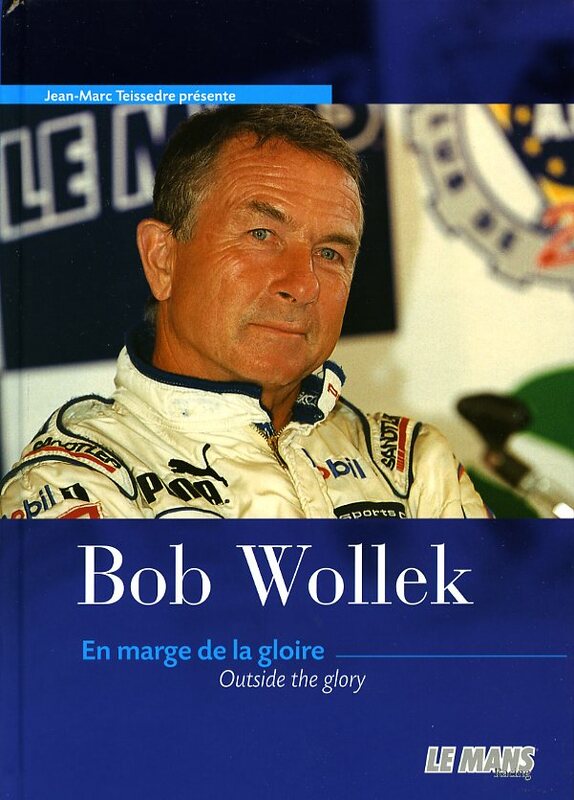 Then Bob Wollek collided with a suddenly slowing car on the banking and that was the end of his race and that of the Leven 962. 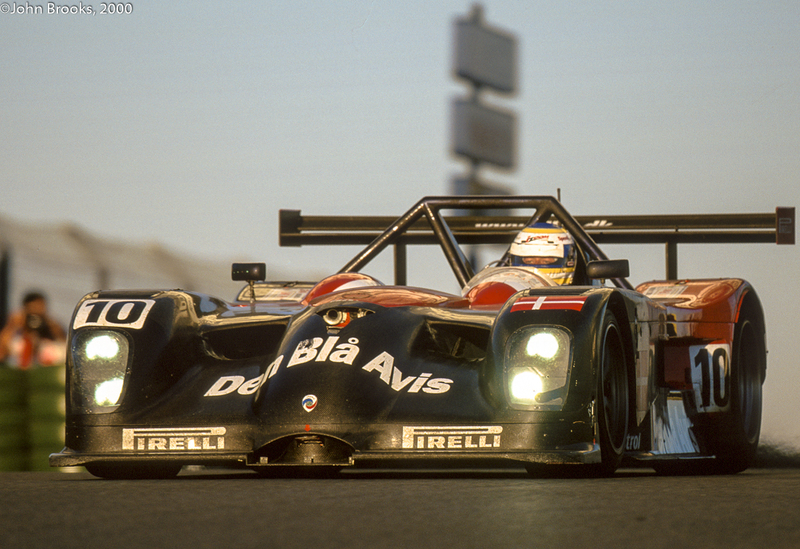 Also out before sunset was the Brun 962 with some form of electrical malady. 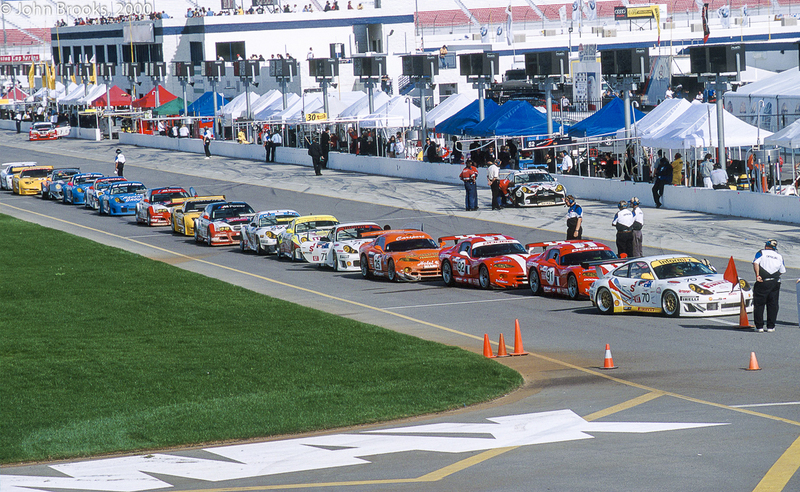 Down in the GTO class NASCAR fans had something to cheer with the #50 Jack Roush Ford Mustang having a crew comprising Bill Elliott, Ken Schrader, Kyle Petty and Ricky Rudd, all Winston Cup regulars. 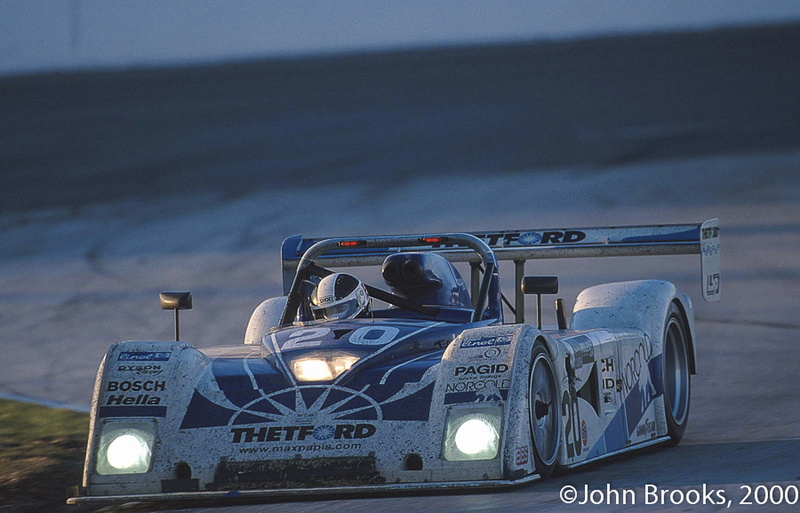 This car ran in the leading group of their class in this Ford-supported effort till Rudd hit the barriers coming out of the back stretch chicane sometime during the night. 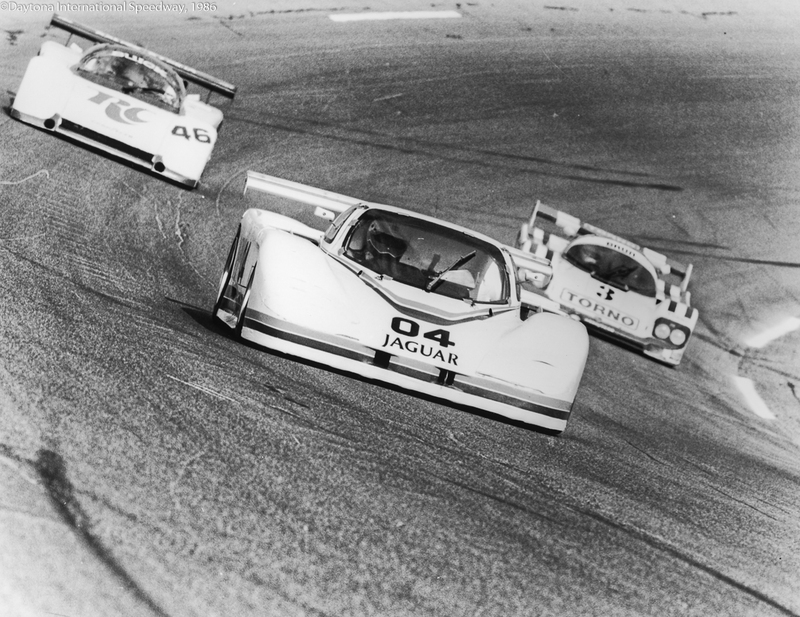 As forecast before the race the Group 44 Jaguars struggled on track with various suspension and transmission issues, then the engine failed in the #04 car. 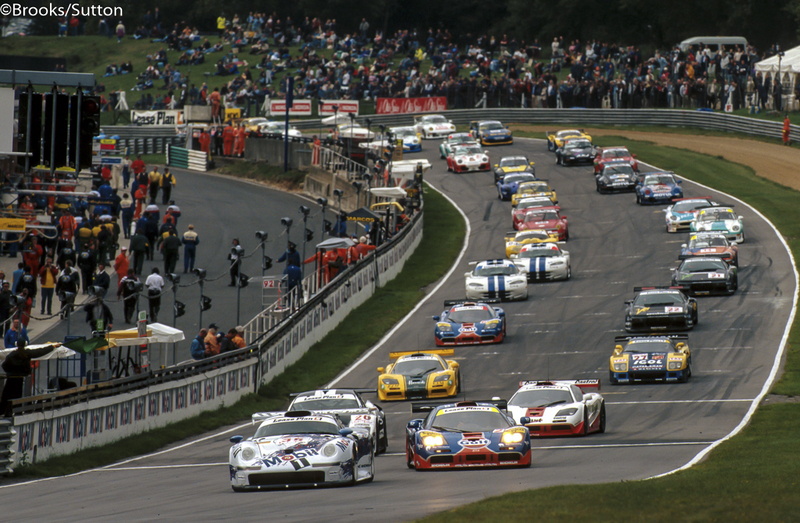 There was some measure of satisfaction for the team as the #44 Jag cruised home to sixth and fourth in class despite spending over an hour behind the wall during the race. 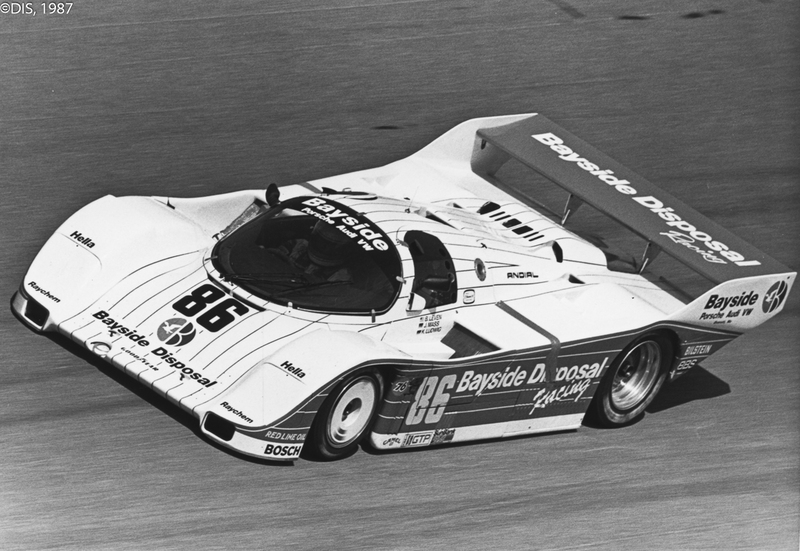 The only real challenge to the 962 armada, aside from self inflicted injuries, came from the March 85G Buick driven by John Paul Jr., Chip Ganassi, Whitney Ganz and ex-Ferrari Grand Prix star, Ivan Capelli. 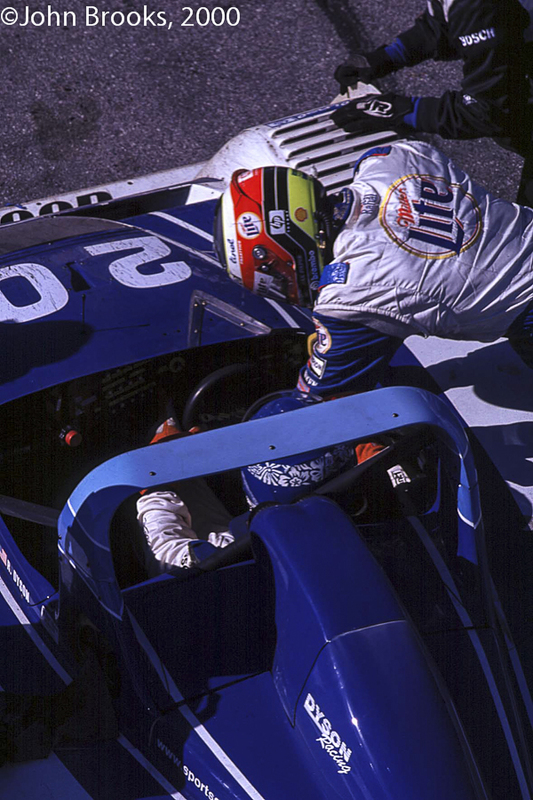 JP posted the fastest lap of the race and the car ran in the top three till the engine cried enough, just past the halfway point. 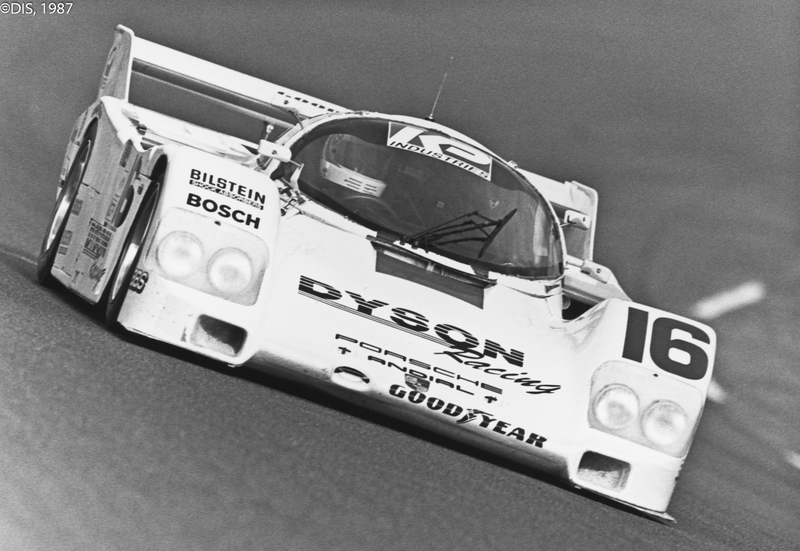 Further carnage in the 962 field saw the Dyson car go out with engine failure. 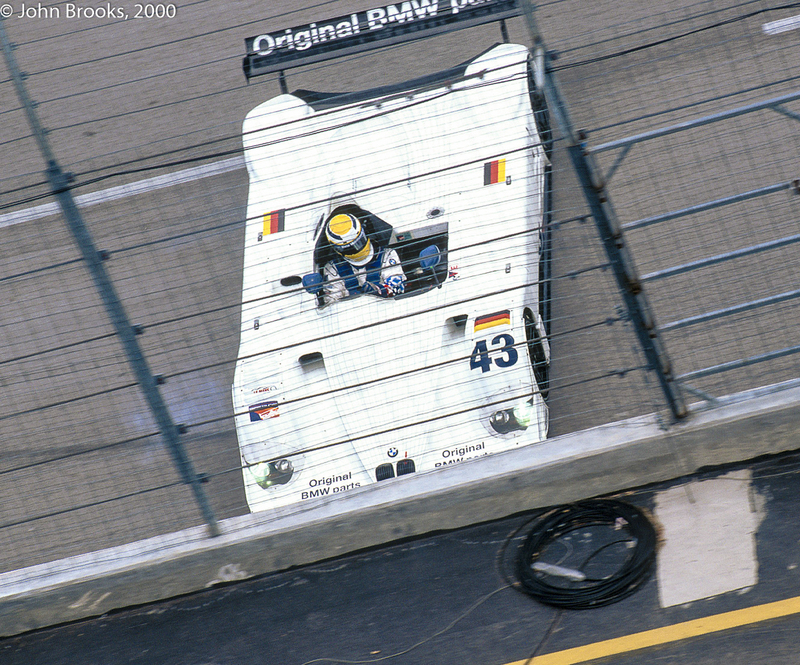 Jan Lammers had one of the biggest crashes of his career when the brakes failed on the second BF Goodrich 962, he had to be extracted through the windscreen as the car had folded up around him. 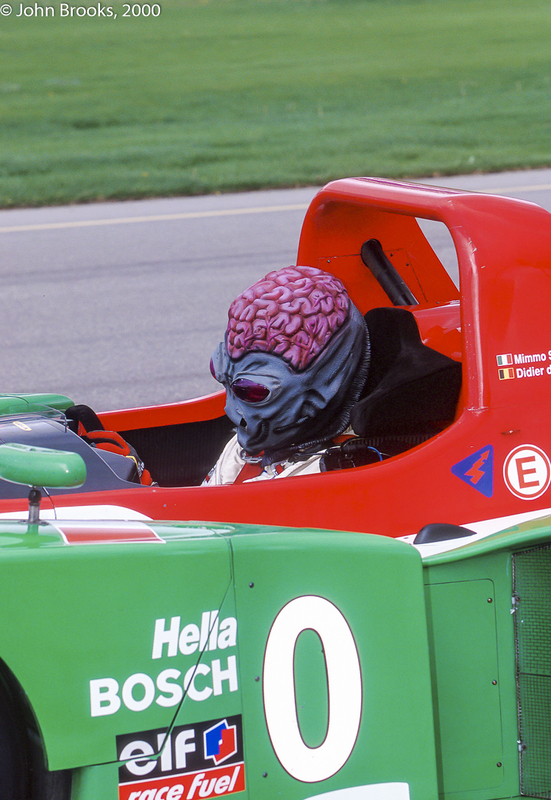 By some miracle he survived without a scratch, only a few minor sprains. 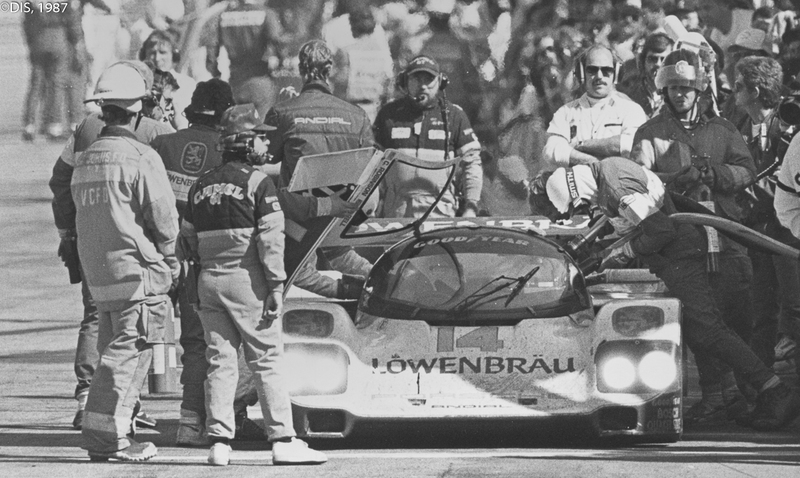 Delays to the Holbert Porsche for brake line failure and broken throttle cable meant that the lead during the darkness was disputed by the Swap Shop 962 of the owner, Preston Henn, and his trio of Indianapolis 500 winners, A.J. 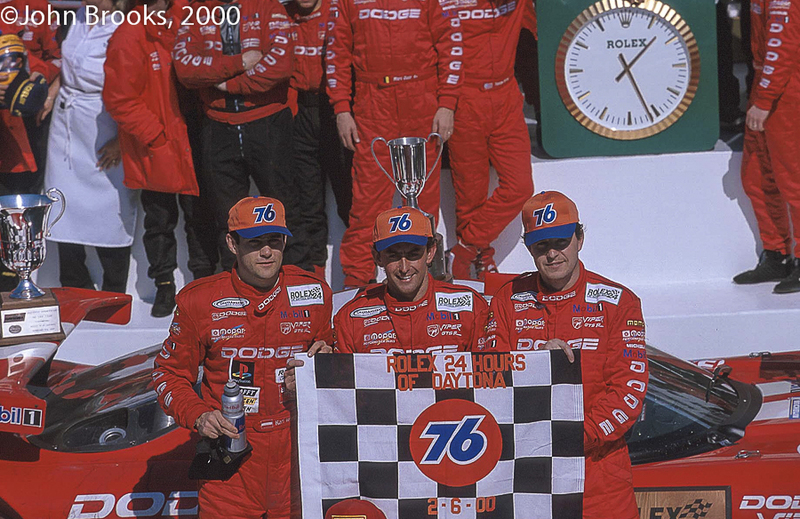 Foyt, Arie Luyendyk and Danny Sullivan. 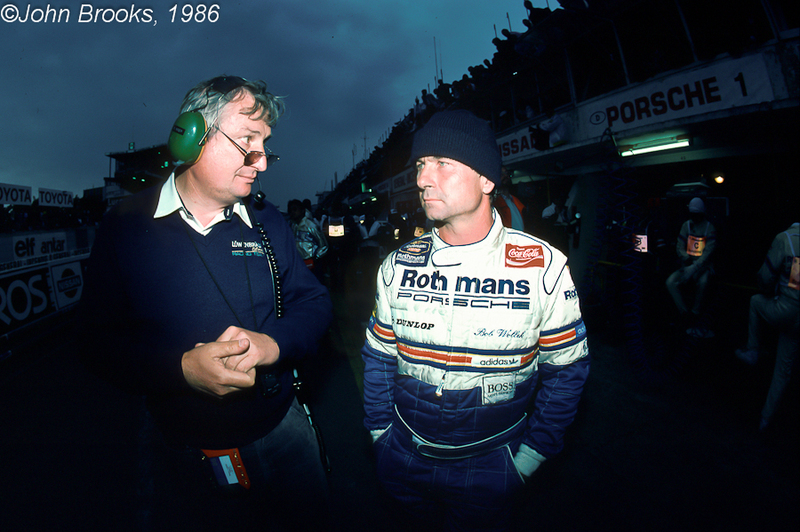 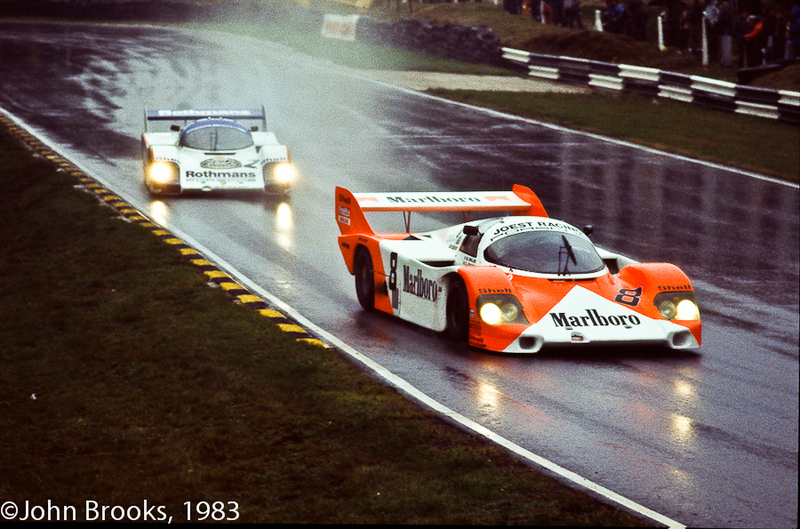 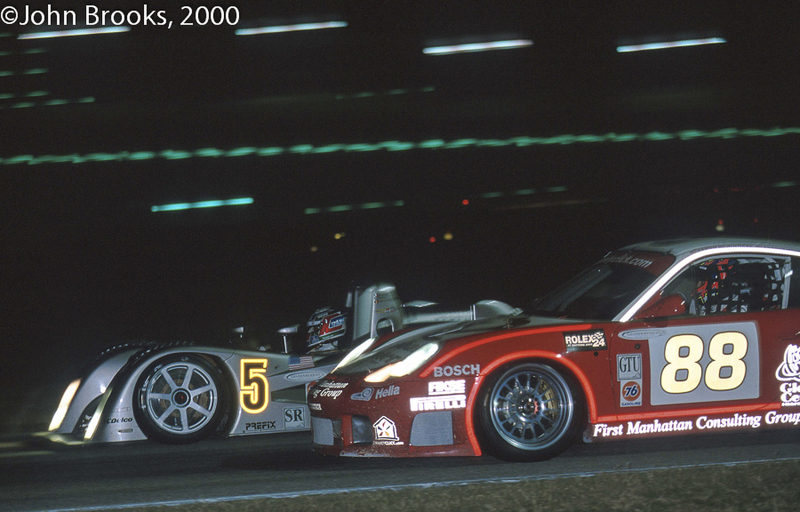 Opposition came from the surviving BF Goodrich Porsche of Derek Warwick, Jochen Mass, Darin Brassfield and Jim Busby, these two cars swapped the lead during the night, apparently in a race of their own. 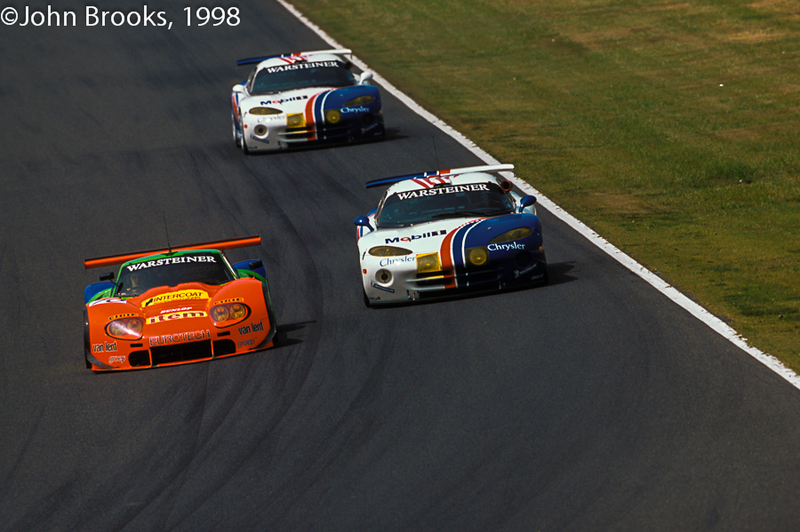 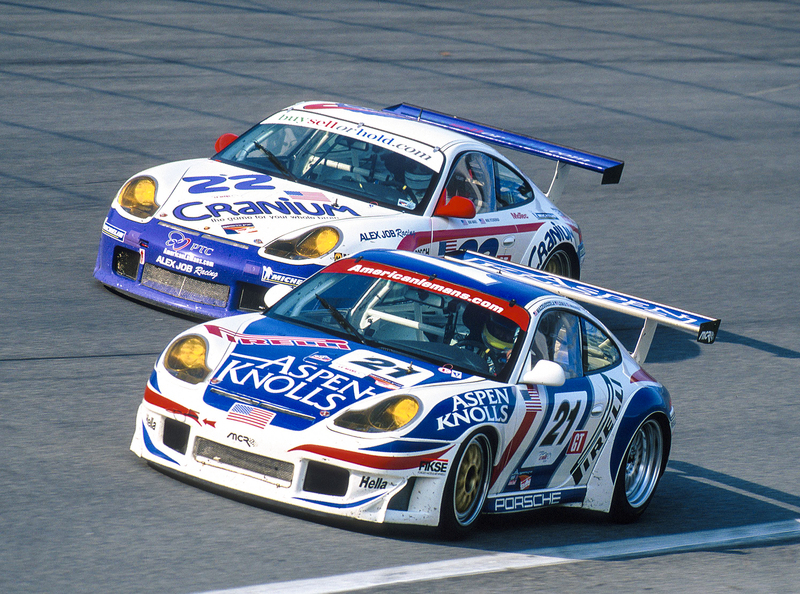 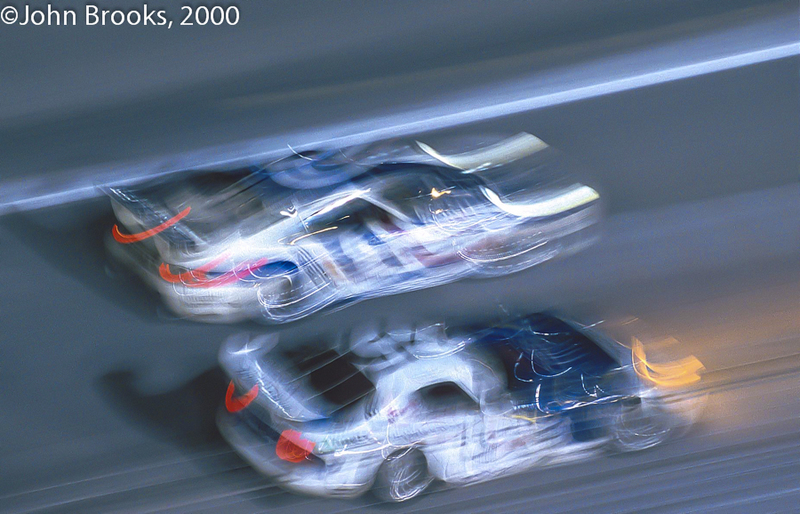 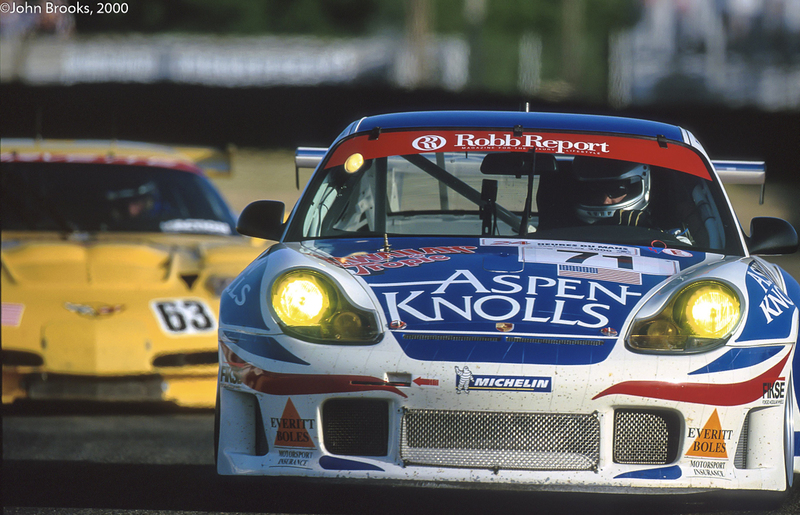 In common with the Holbert car, some distance back, these Porsches were being wrung by the neck, each lap treated like a qualifying effort. 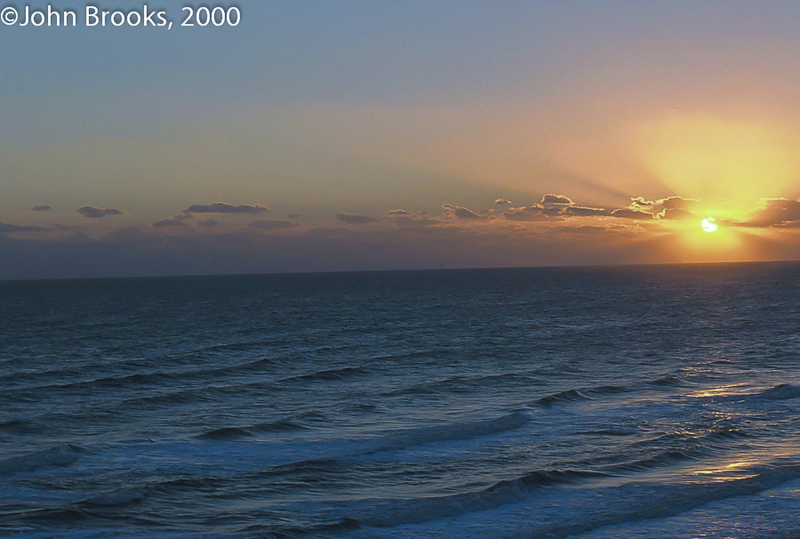 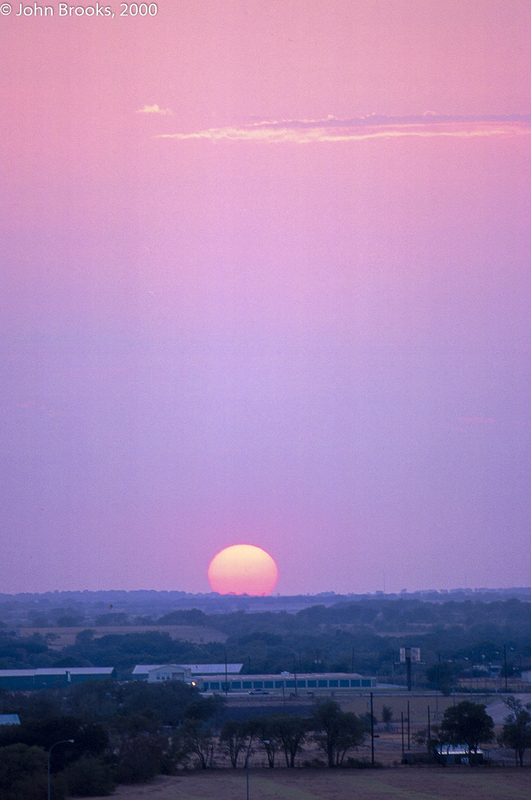 Then, as the sun appeared from the East, things started to go wrong for the leading pair. 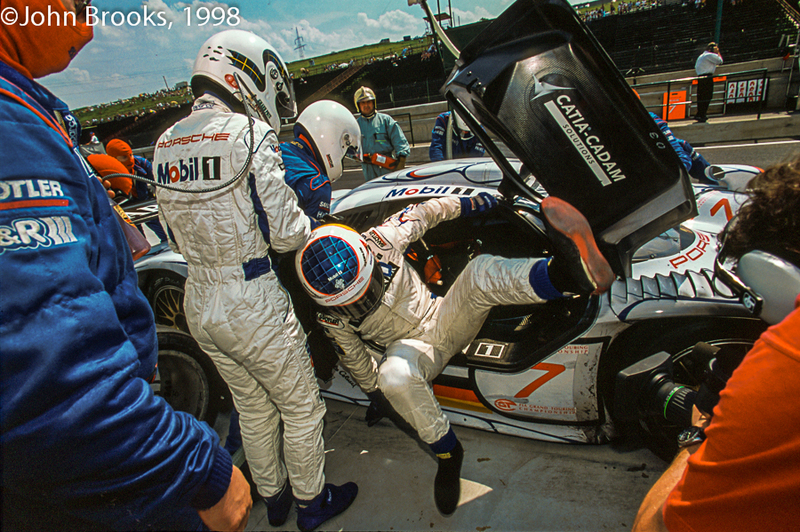 #67 suffered a broken CV joint and then a driveshaft failure, time was being lost in the pits, any chance of victory also seemed to have evaporated. 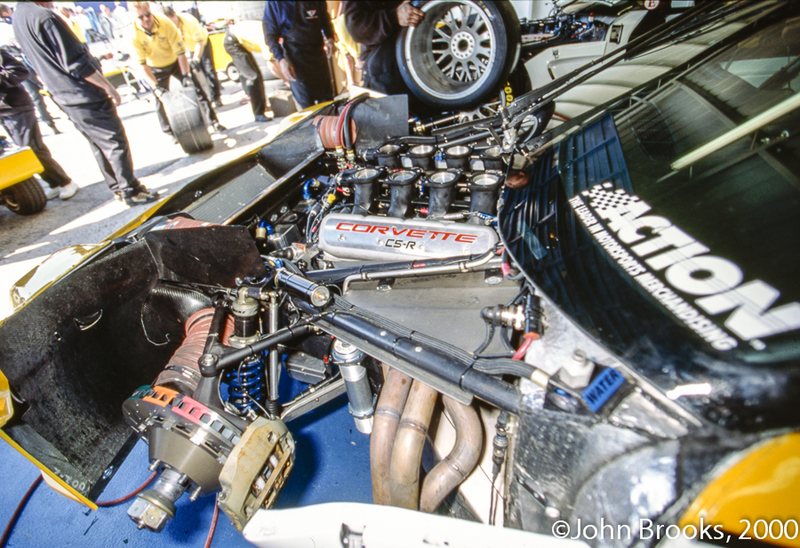 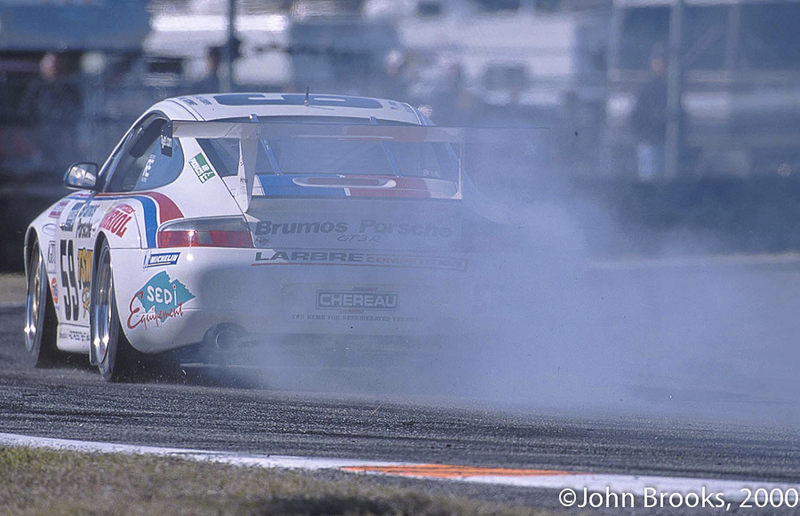 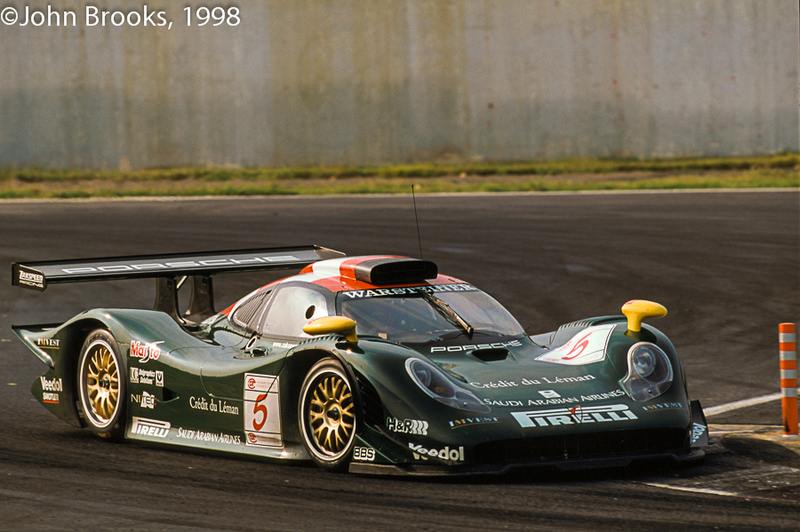 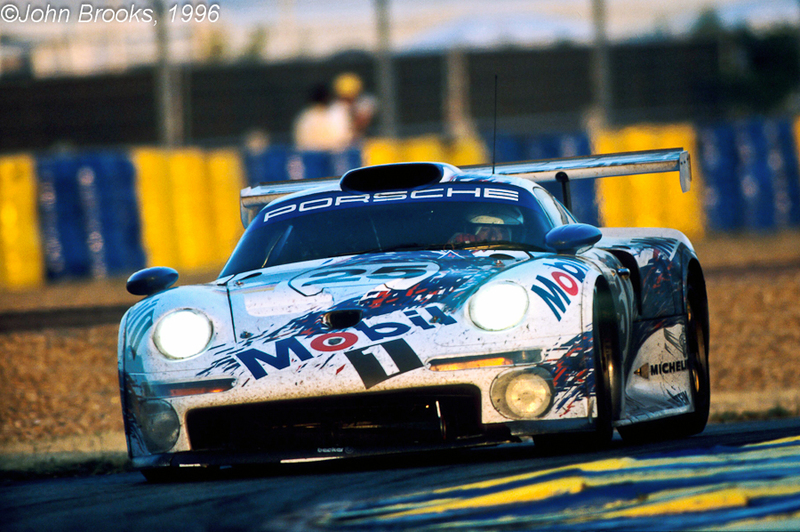 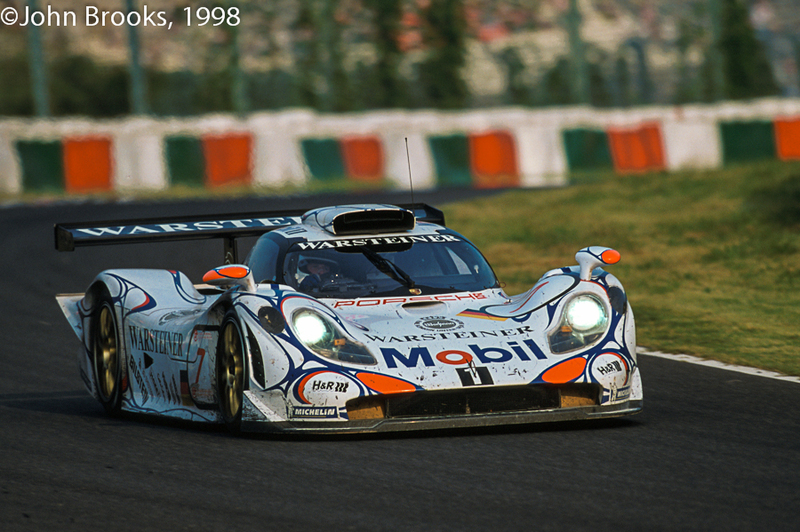 #8 was also in the wars, an oil line had to be replaced as did a turbo wastegate. 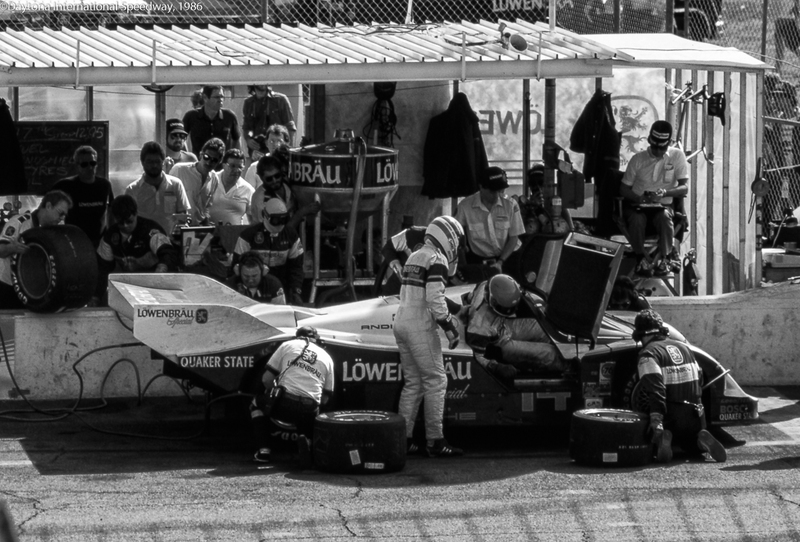 The biggest issue was a sticking throttle and the team elected to fix it costing some eight laps, however the problem persisted and their once substantial lead was disappearing fast. 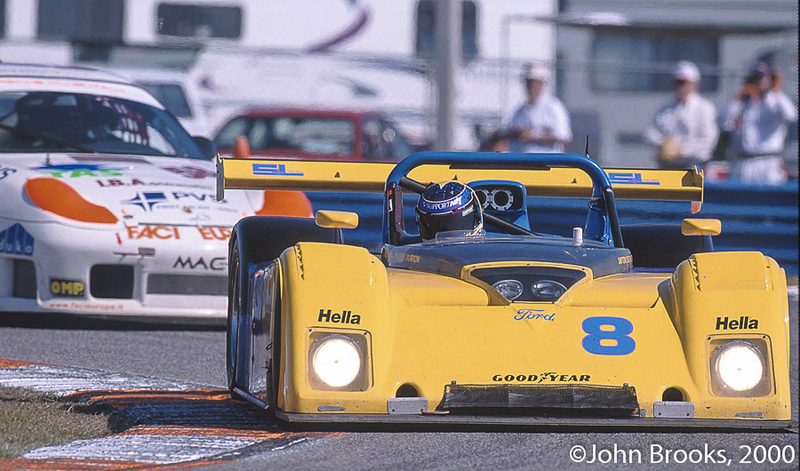 At one point the Holbert 962 had been 22 laps off first place but as their rivals struck misfortune they closed in on the top spot. 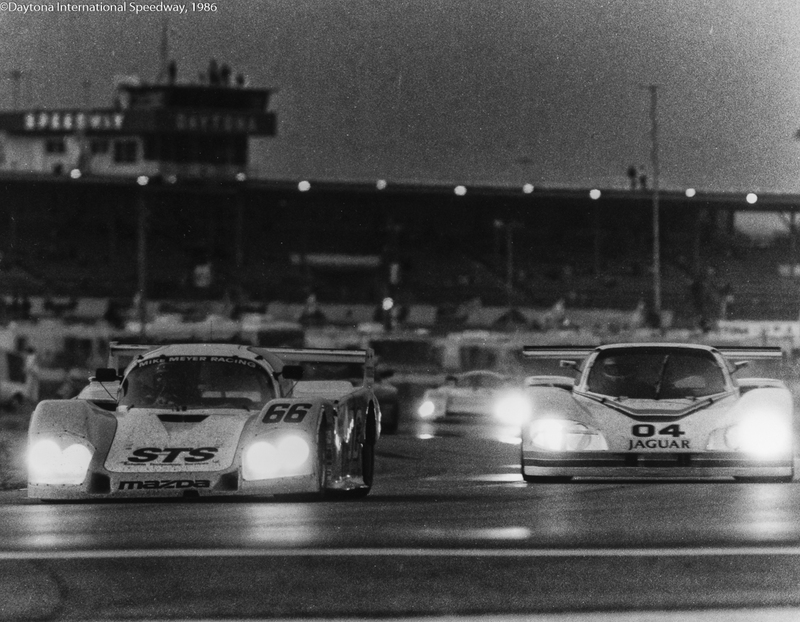 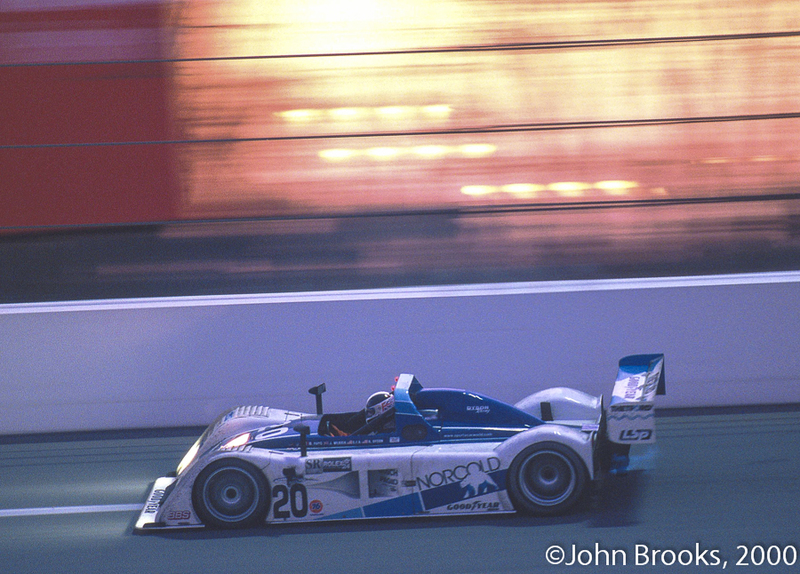 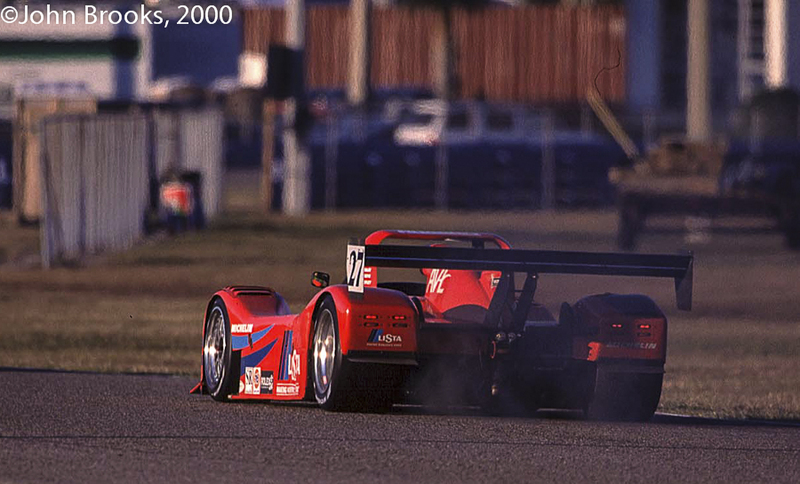 Holbert, Bell and Unser Jr. knew all about the cruelty that the Daytona 24 Hours could inflict on those seemingly destined for glory. 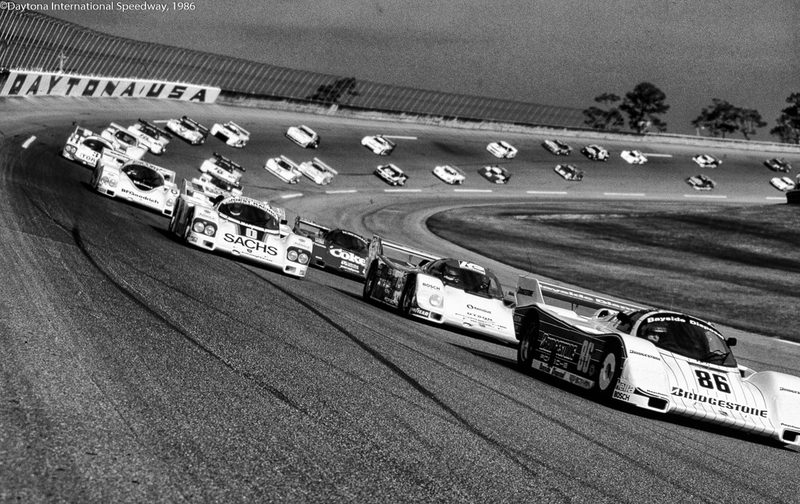 A year previously they had seen a 13 lap advantage while leading on Sunday morning turn into a 17 lap deficit that would result in second place. 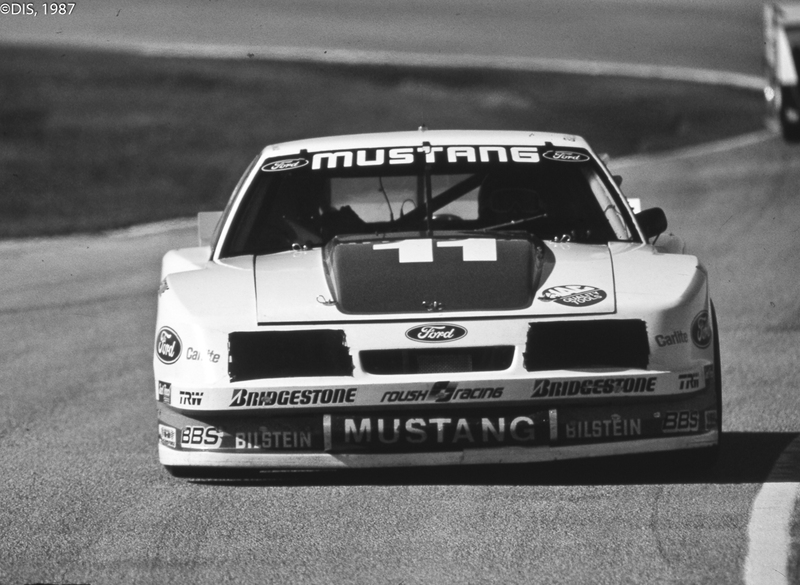 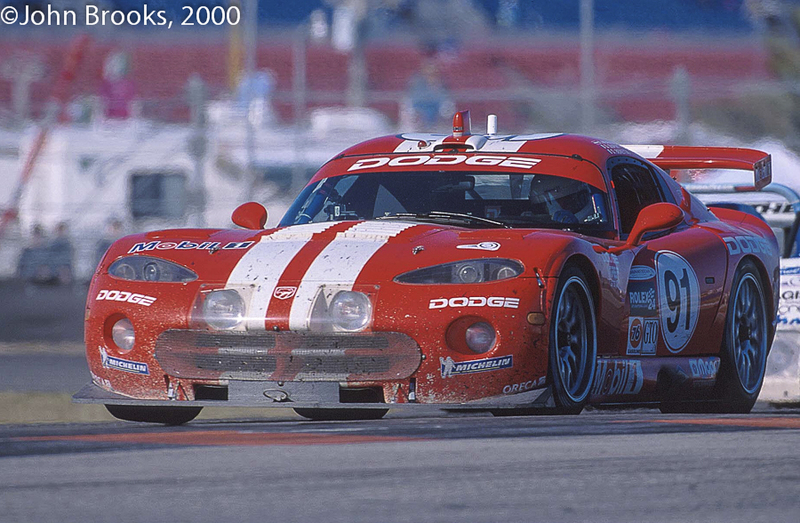 If further proof were necessary about the capricious nature of racing round the clock at Daytona Beach consider the fate of the #07 Ford Mustang. 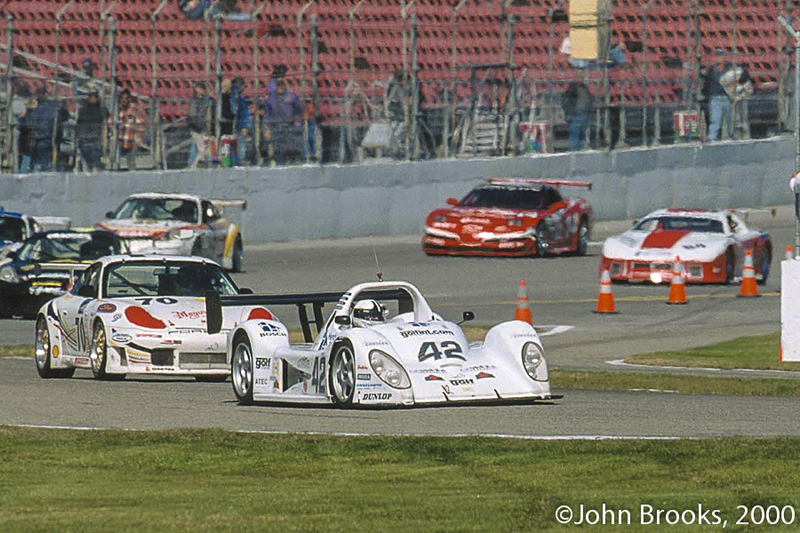 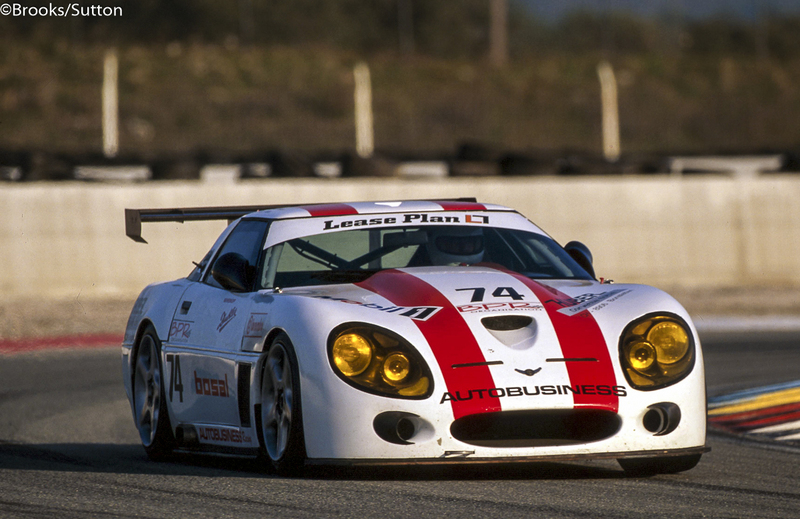 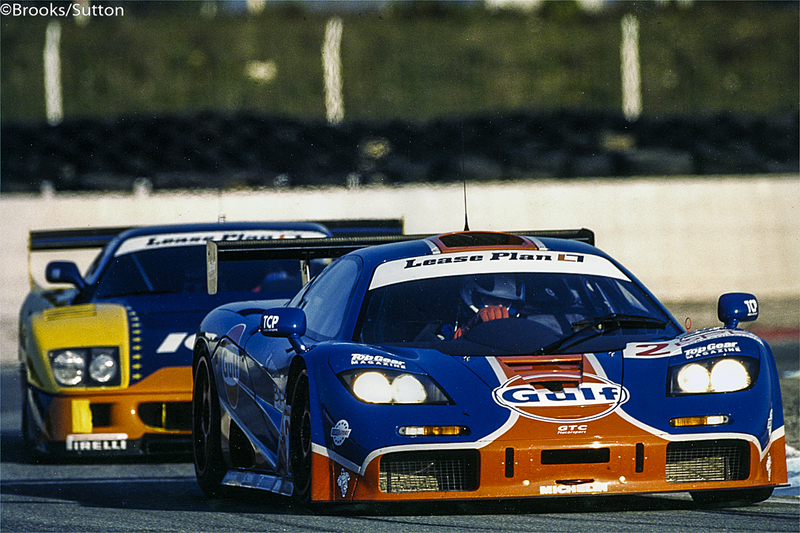 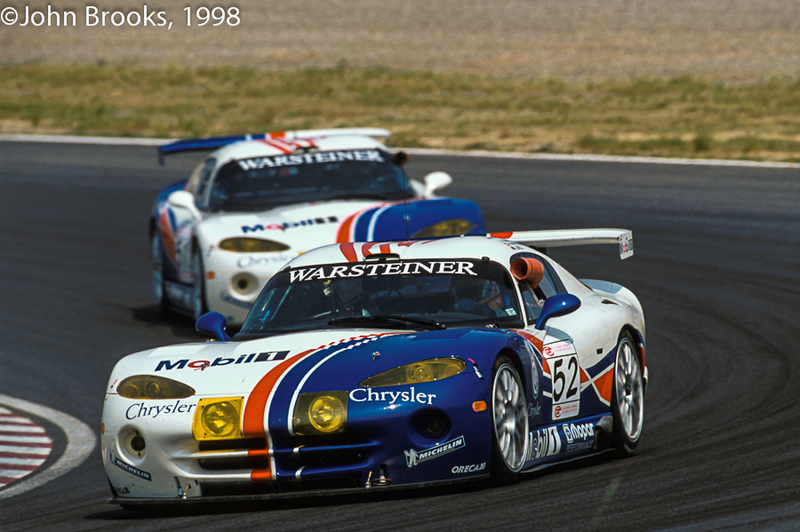 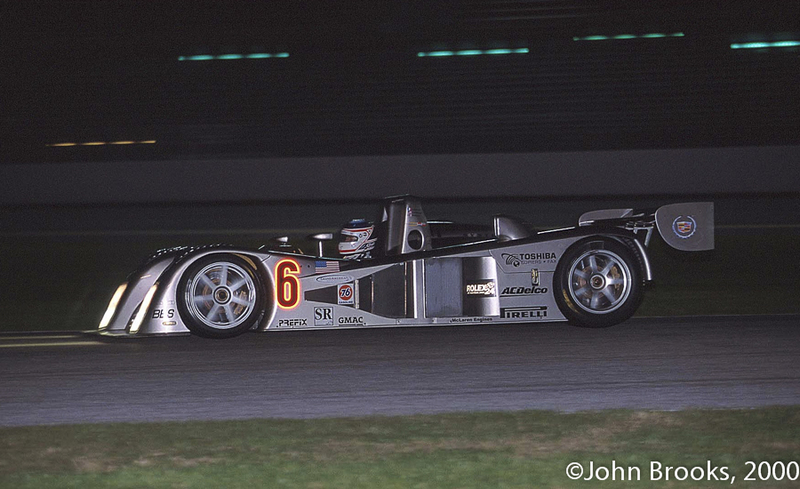 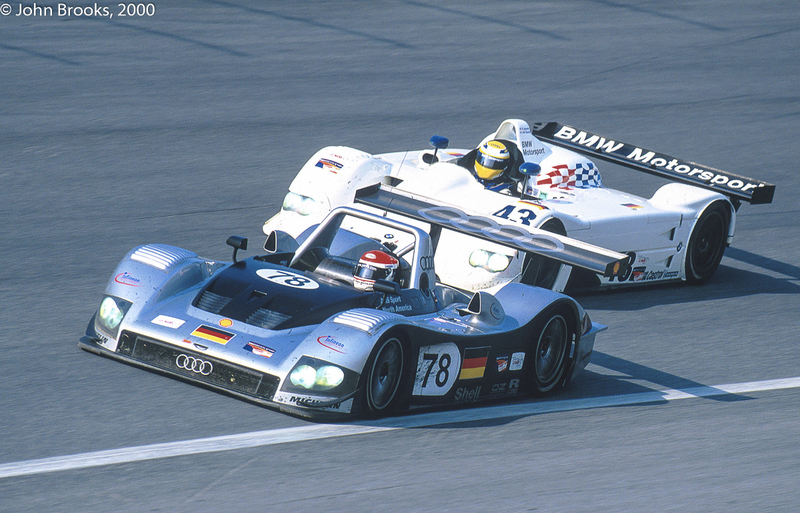 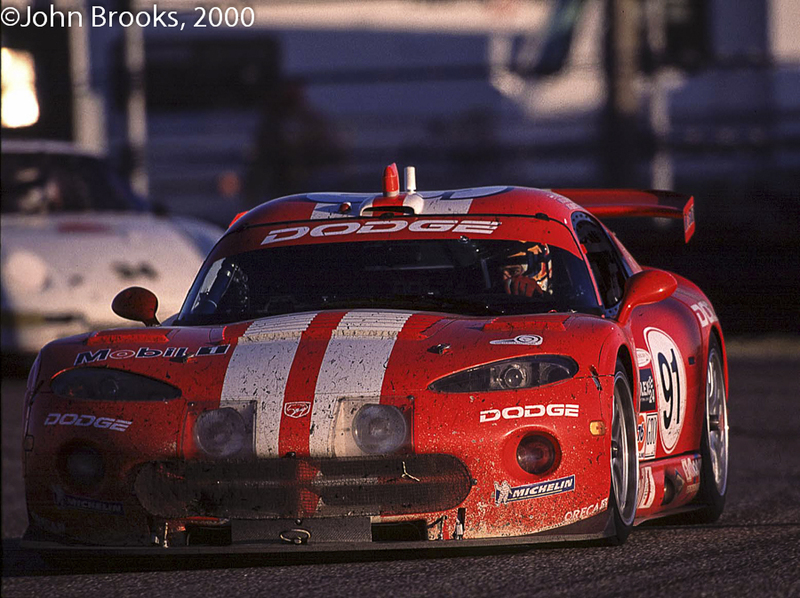 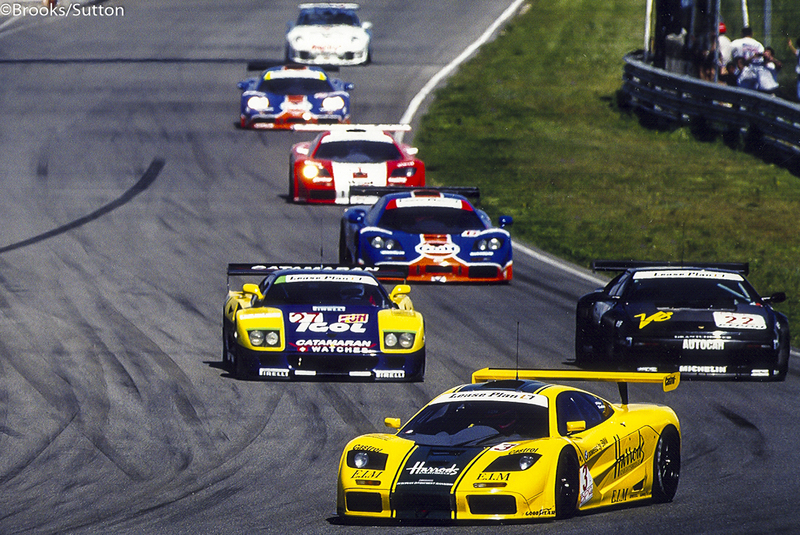 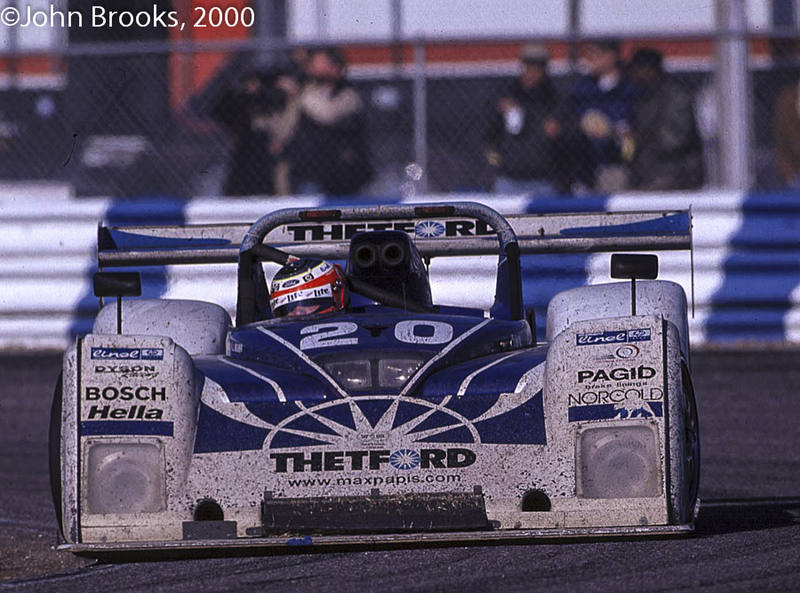 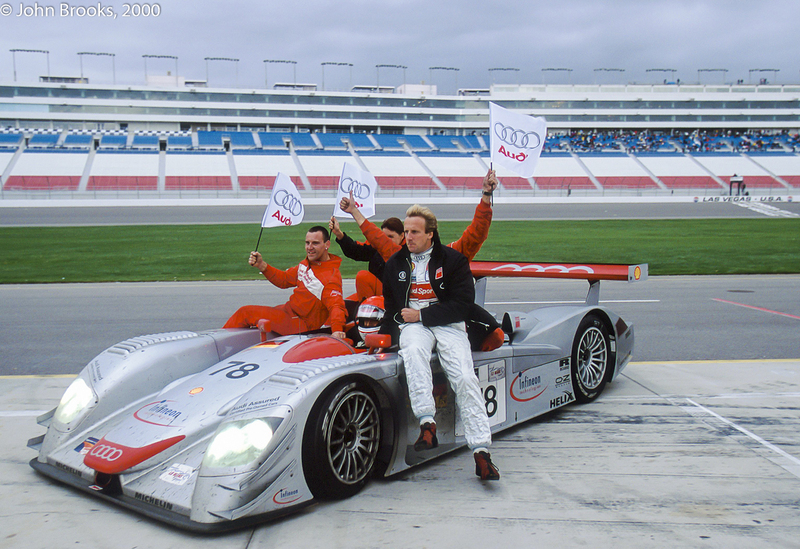 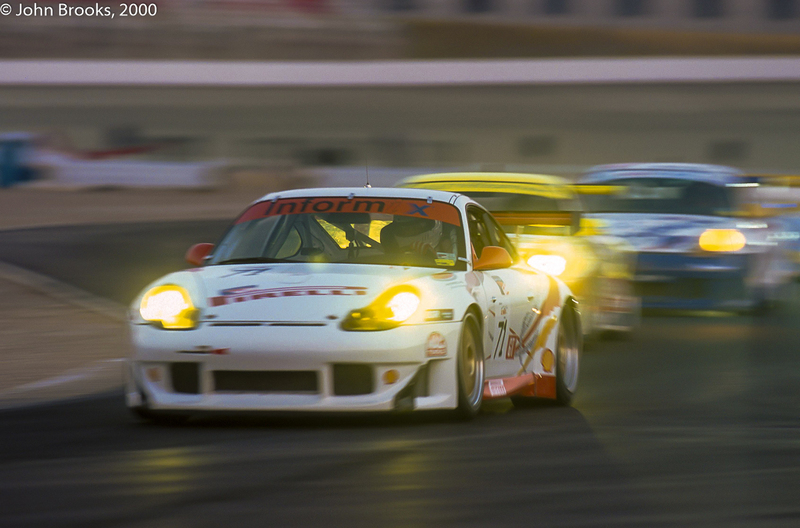 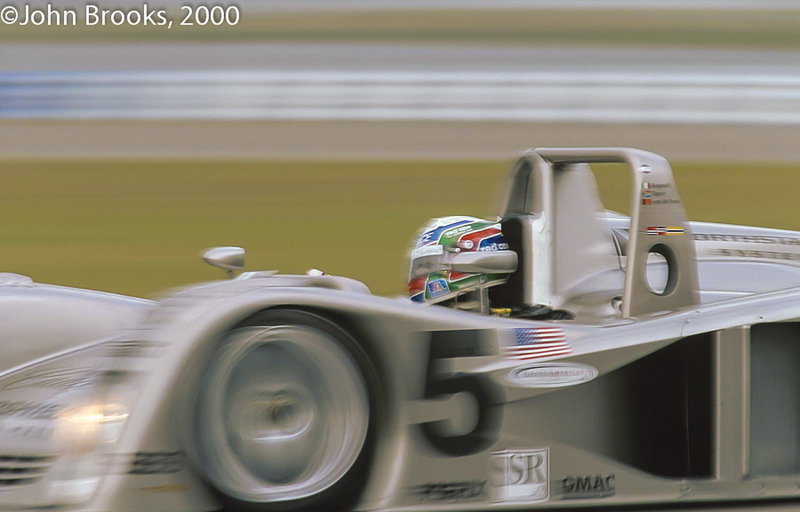 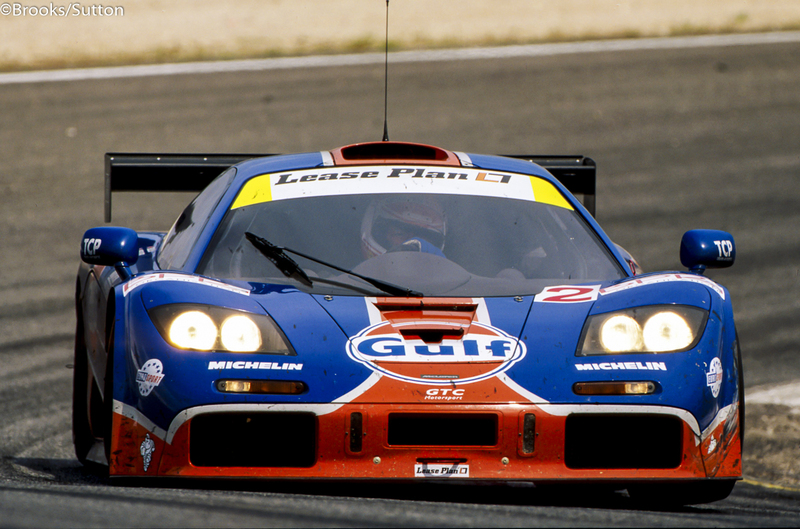 The driver trio of Klaus Ludwig, Scott Pruett and Bruce Jenner (Yes, THAT Bruce Jenner) built up a lead of 90 laps over their nearest class rivals. 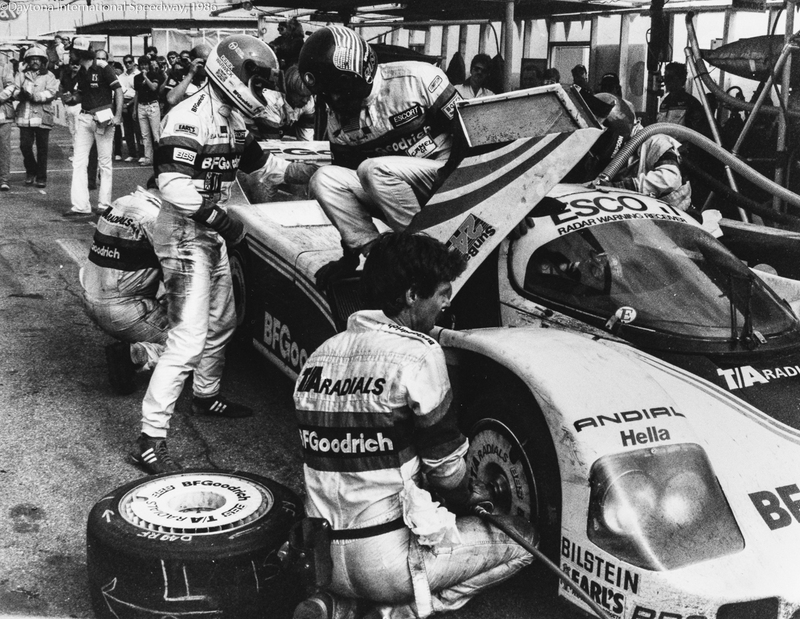 Late on Sunday morning they had to witness this apparently impregnable advantage unravel as they were stuck in the pits trying to repair an oil leak, they still managed a second in class and fifth overall, a good indication of the attrition suffered by the whole field. 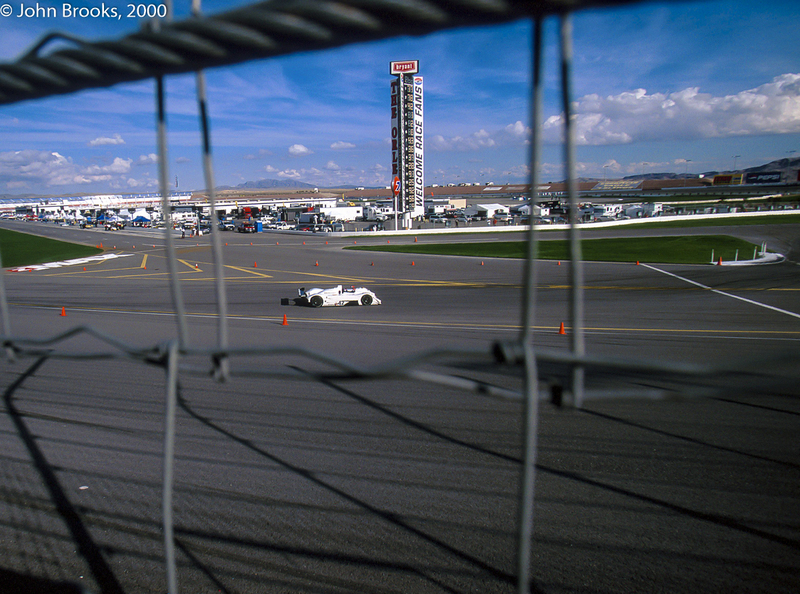 The closing laps were tense as the lead of the #14 car was just over a minute from the #8 962, with #67 a further lap adrift. 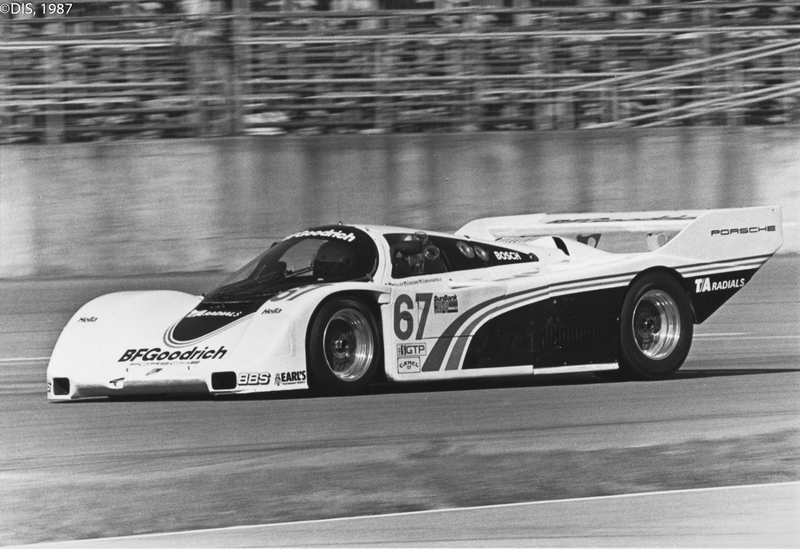 The final result saw the Holbert car record 712 laps, just 1:49.150 ahead of their rival after 24 hours, it was the closest finish of the race to that point and also a distance record of 2,534.72 miles. 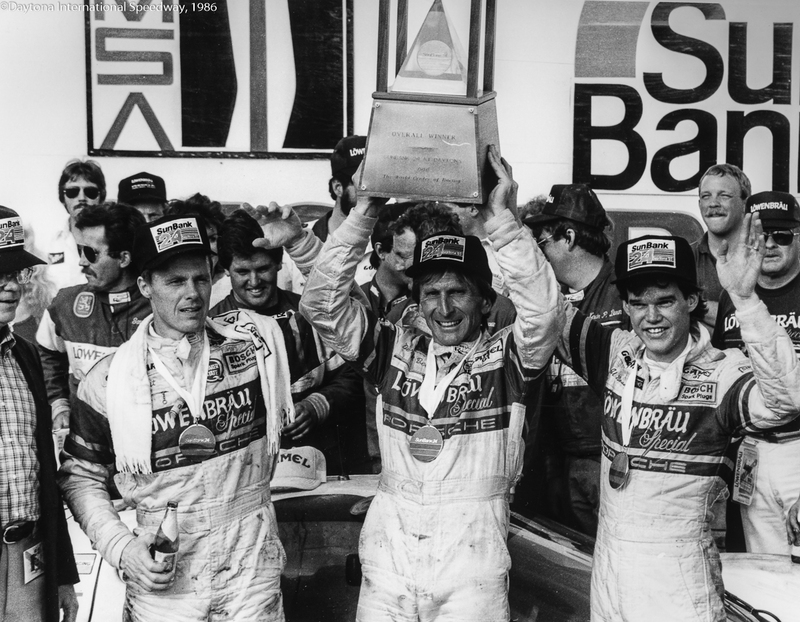 There would be no repeat of the crushing disappointment of 1985, Holbert, Bell and Unser Jr. would get to spray the Champagne and hoist the trophies. 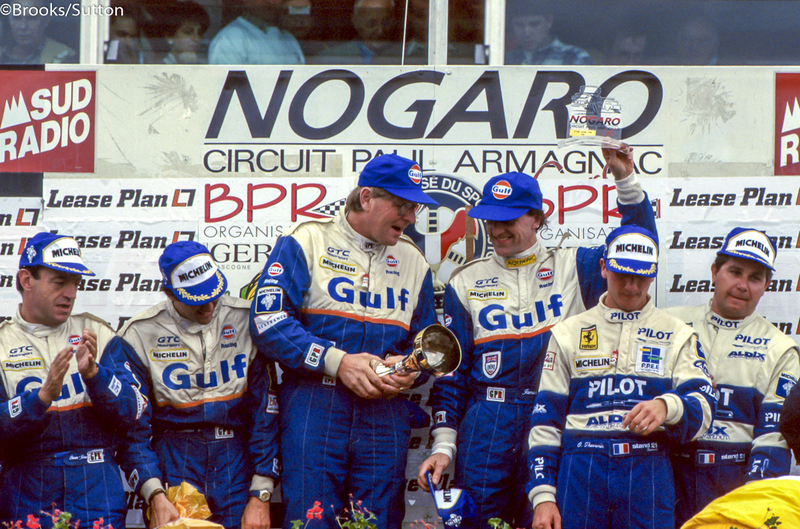 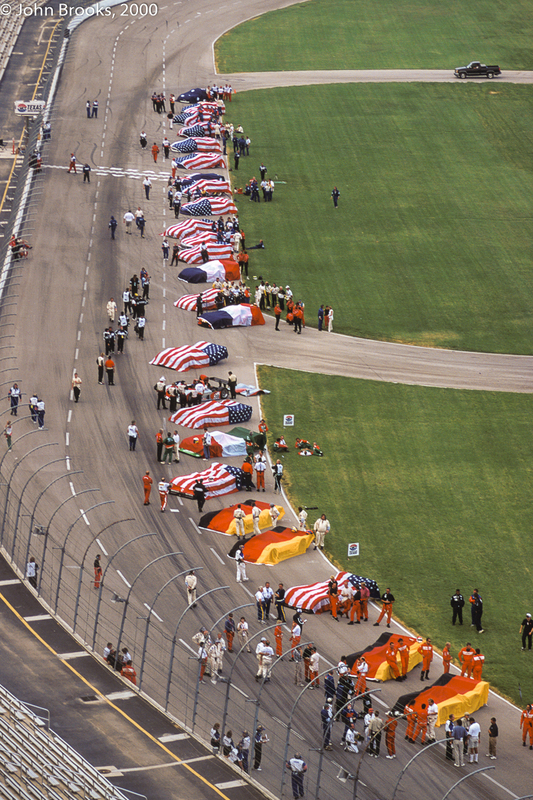 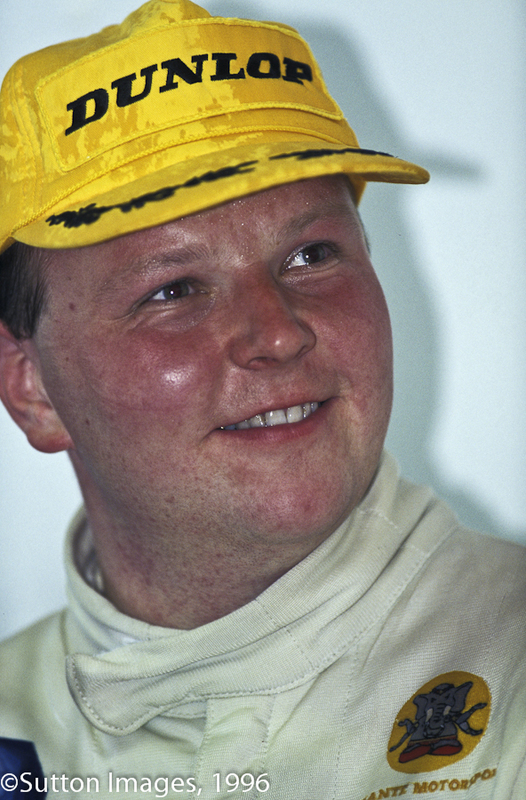 They would repeat this triumph a year later but Holbert’s time was running out, he was killed in a plane crash in September 1988, an endurance champion was lost. 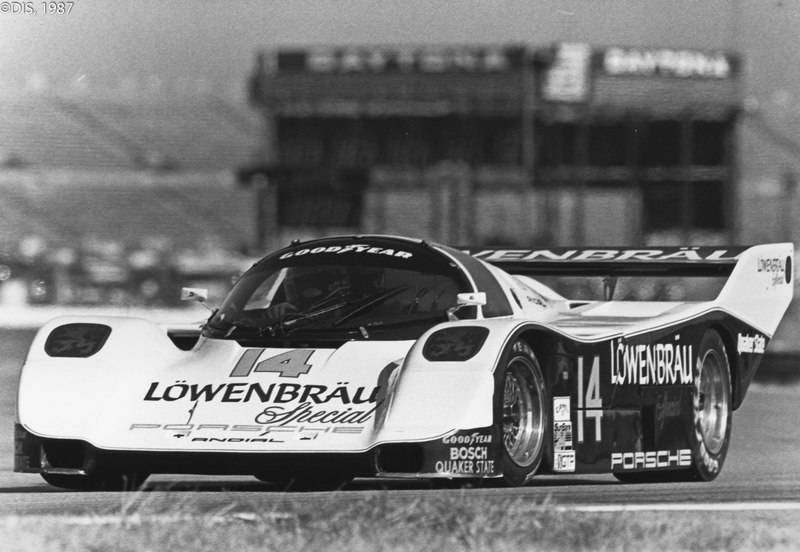 This entry was posted in Notes from the Cellar and tagged Al Holbert, Al Unser Jr., Bill Elliott, Bob Tullius, Bob Wollek, Bruce Jenner, Bruce Leven, Daytona 24 Hours, Derek Bell, Jan Lammers, Jim Busby, John Paul Jr., Ken Schrader, Klaus Ludwig, Kyle Petty, Porsche 962, Preston Henn, Reinhold Joest, Ricky Rudd, Rob Dyson, Sarel van der Merwe, Scott Pruett, Walter Brun on January 29, 2016 by John Brooks. 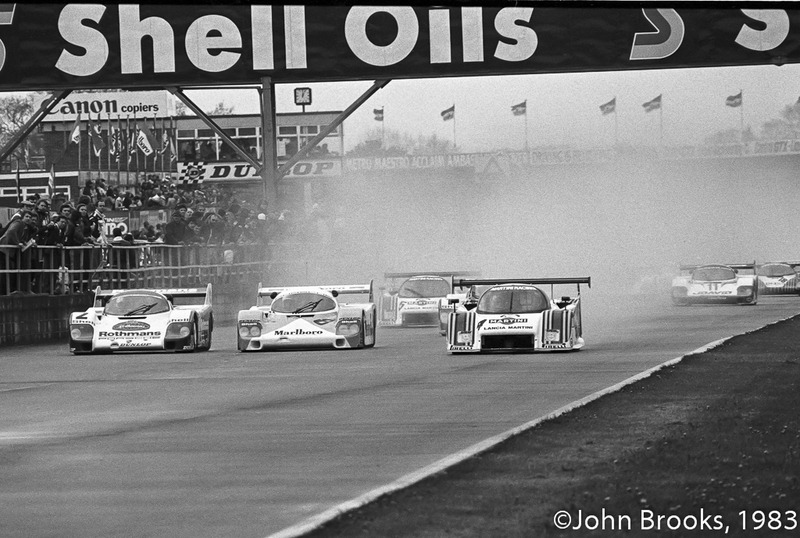 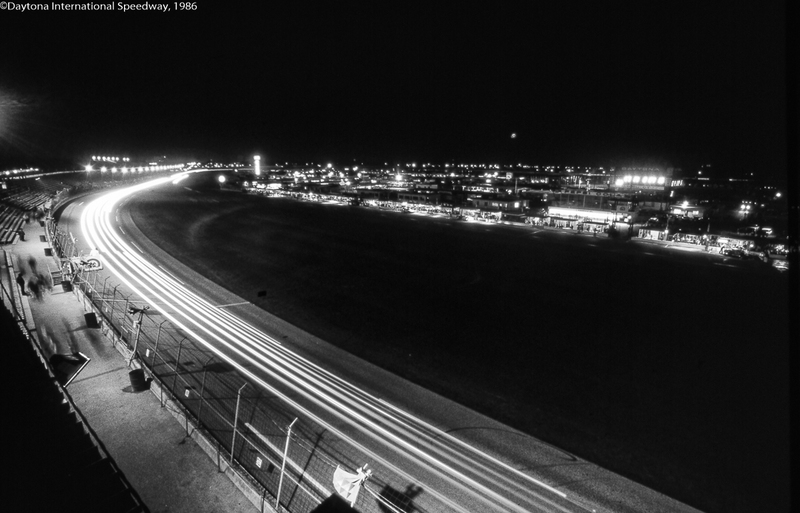 1983 and the start of the 1000 Kilometres of Silverstone. 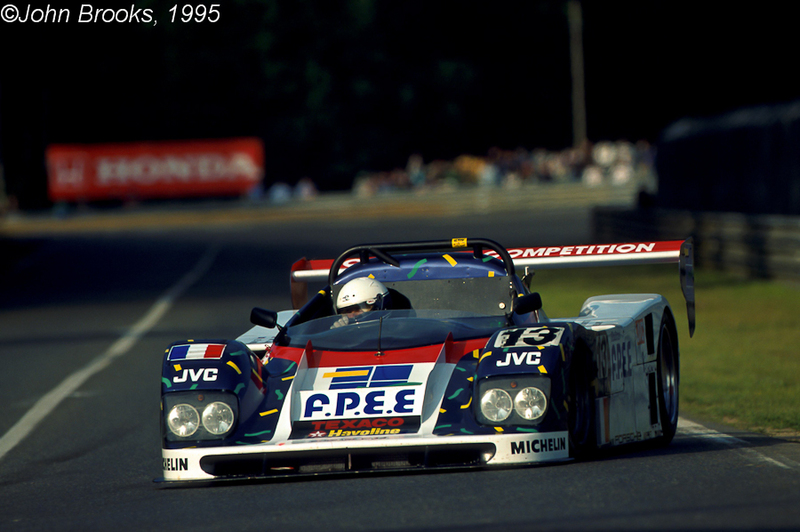 Michele Alboreto in the Martini Lancia LC2 is slicing past the fag packet Porsche 956s of Derek Bell and Bob Wollek…………………a happy time, almost all of our vices on display. 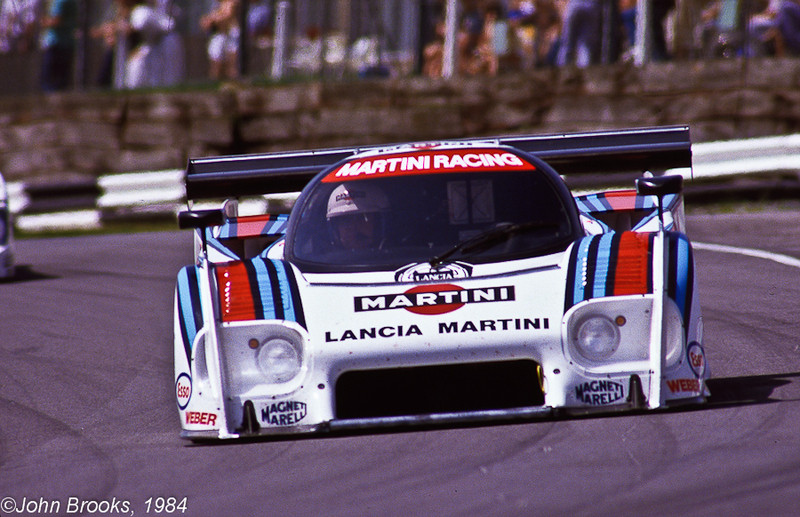 This entry was posted in Nostalgia, Notes from the Cellar, The Blink of An Eye and tagged Bob Wollek, Derek Bell, Lancia LC2, Porsche 956, Silverstone on April 9, 2013 by John Brooks.